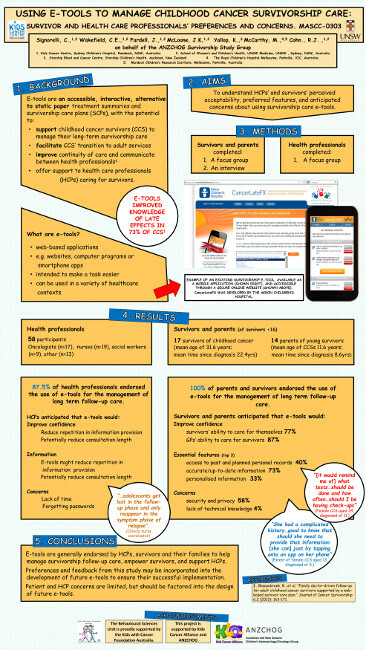 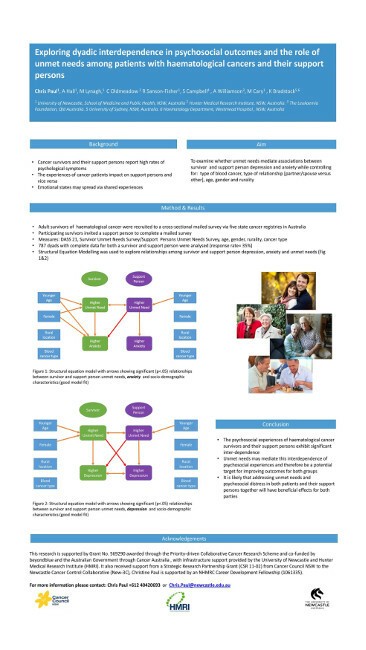 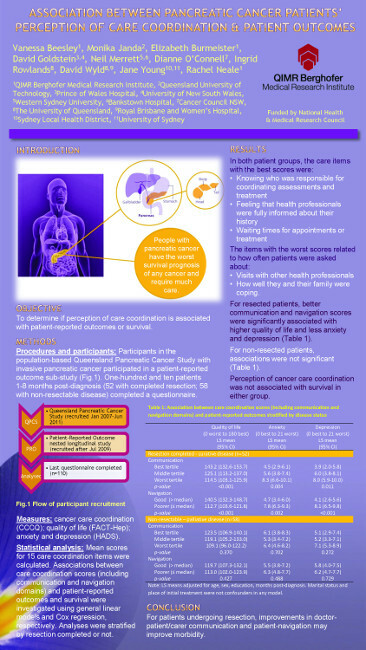 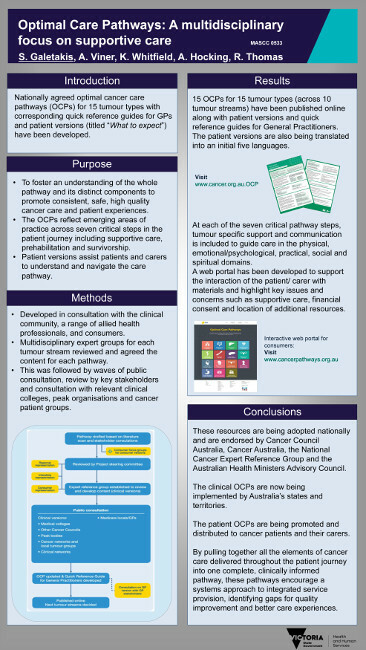 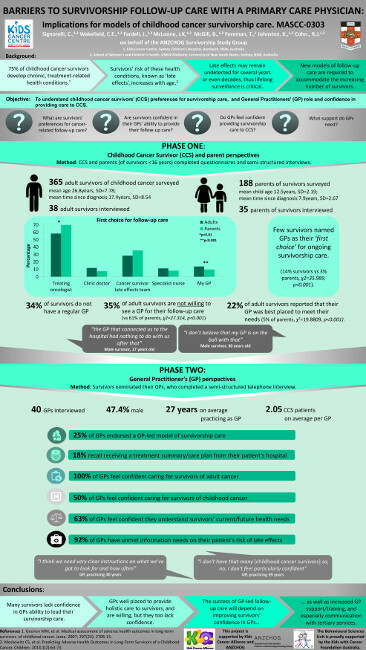 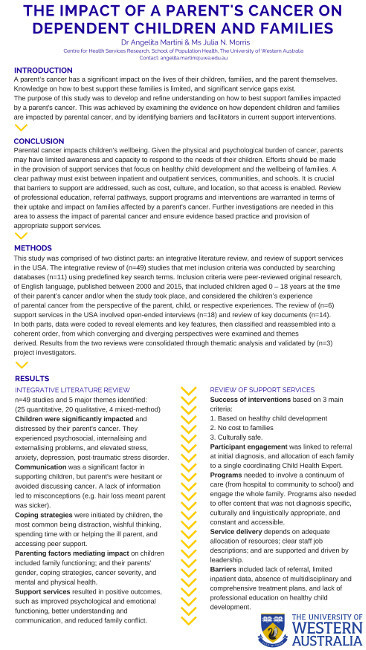 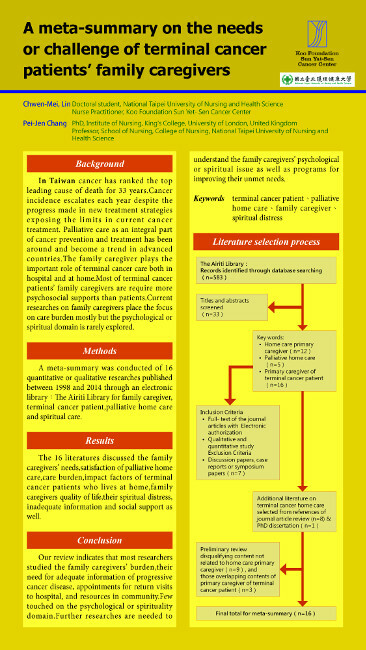 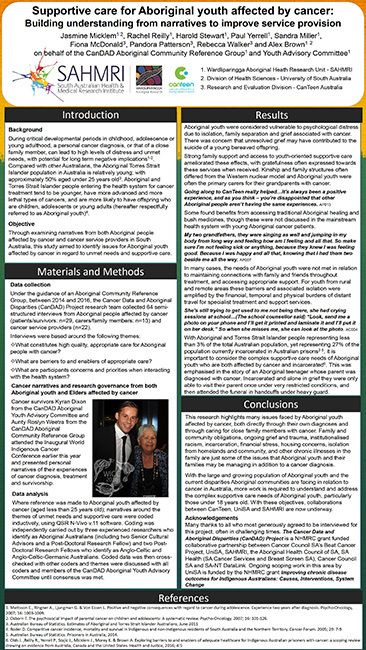 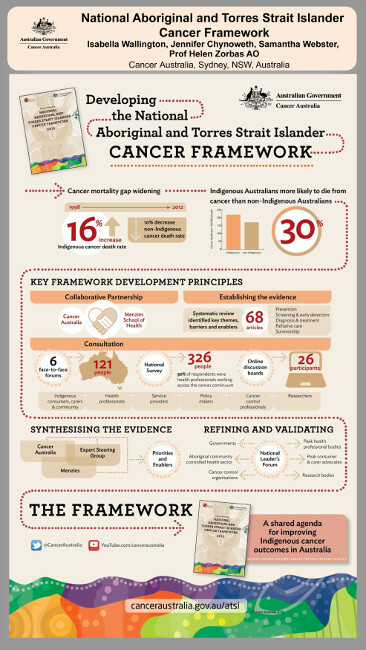 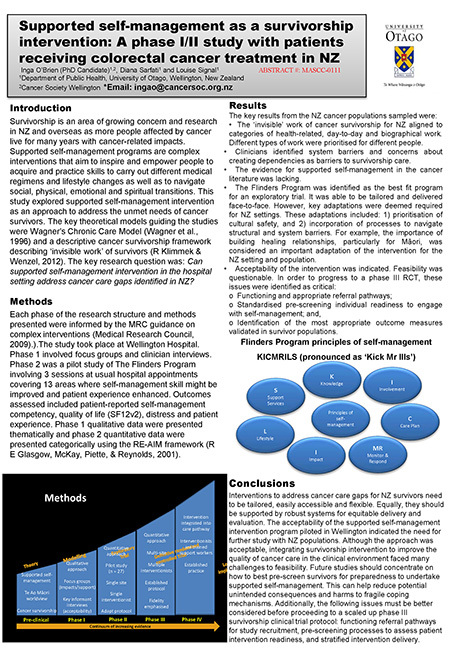 Health professionals caring for parents with cancer with adolescents and young adult children: Guidelines for assisting families in managing parental cancer-related communication & information challenges. 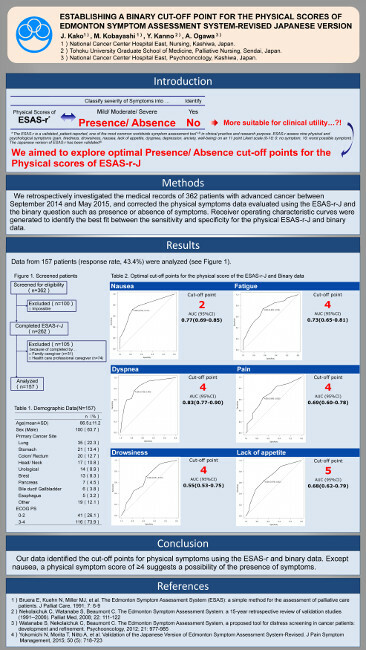 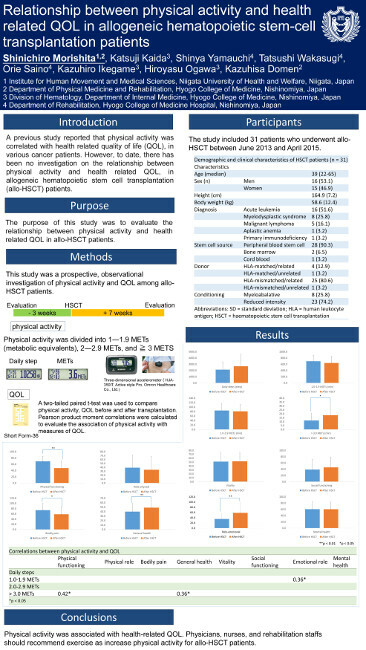 Relationship between lifestyle changes and physical inactivity in elderly patients with advanced non-small-cell lung cancer. 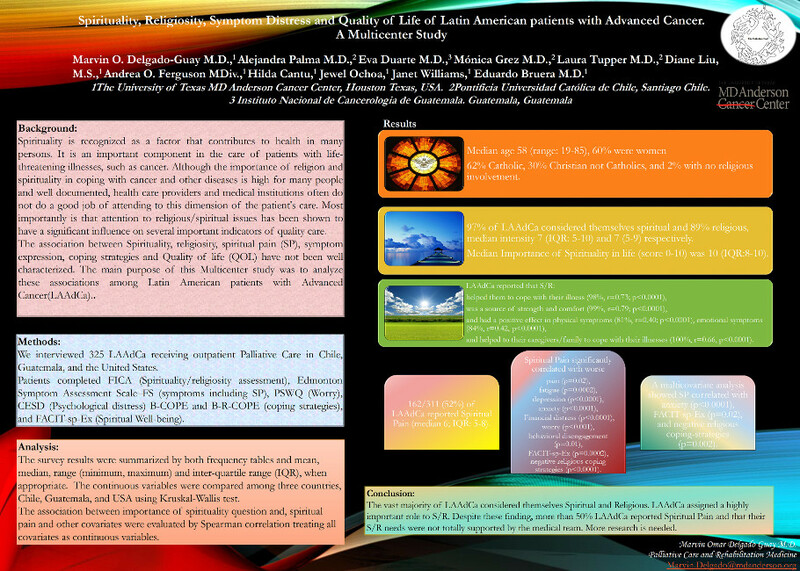 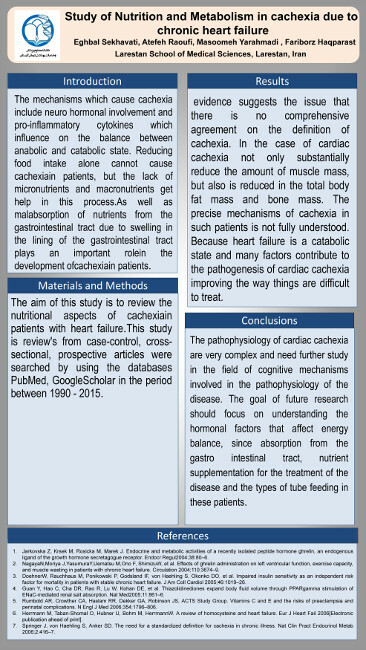 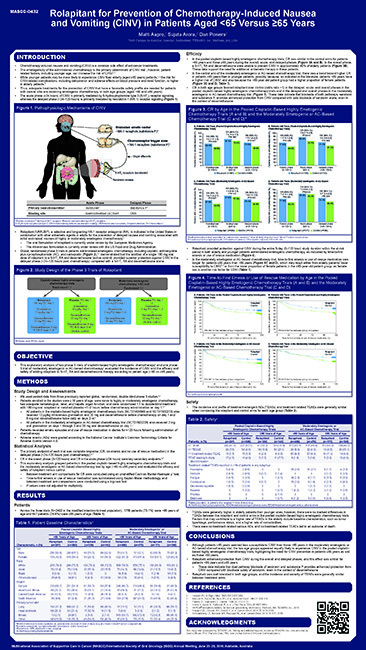 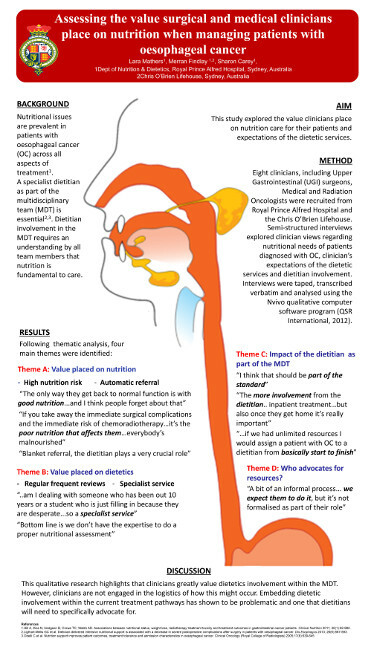 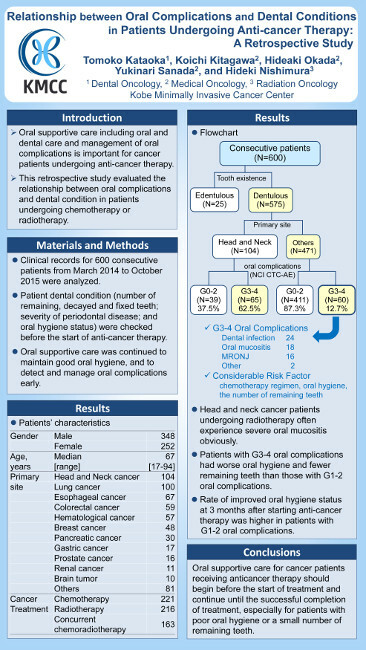 Treatment of oral cancer still reduce masticatory effectiveness; what are the physiotherapeutic options? 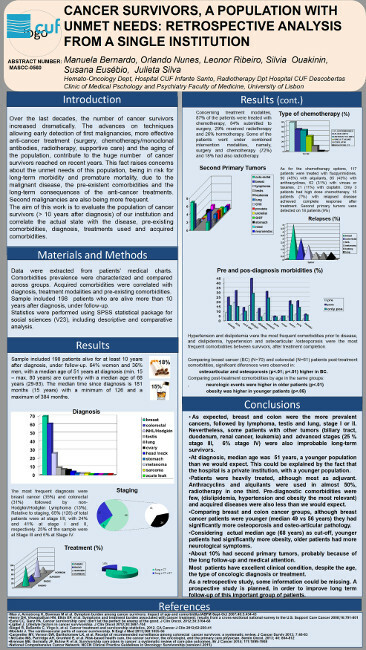 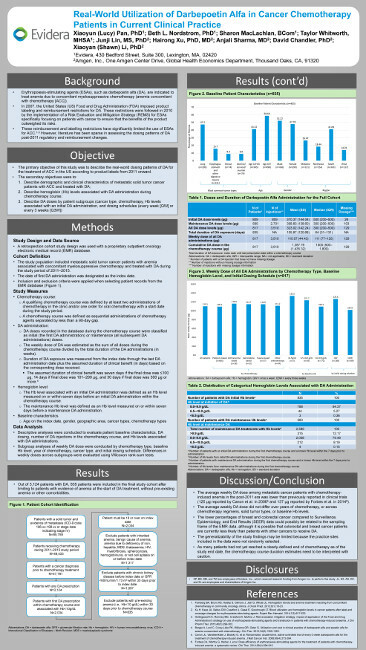 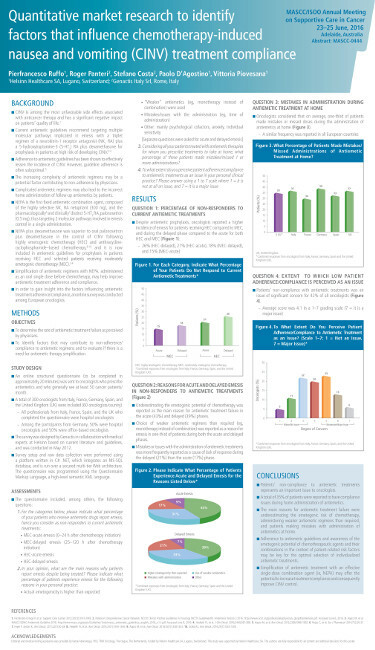 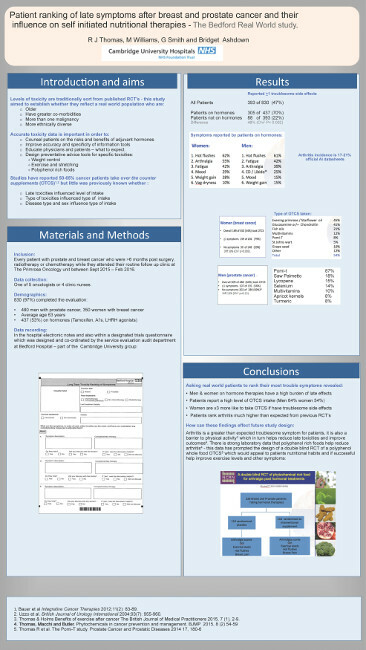 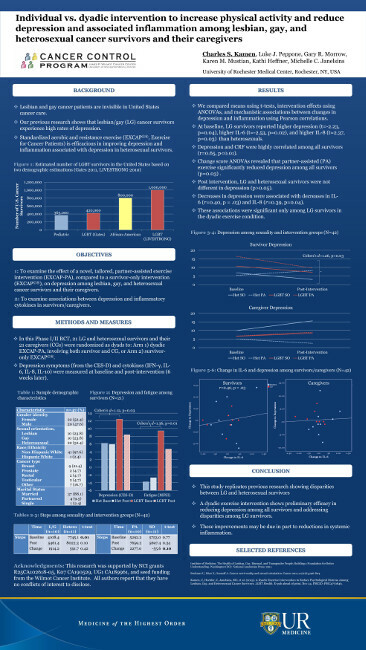 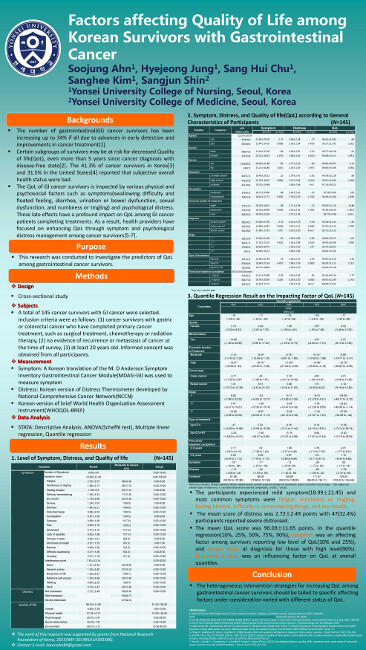 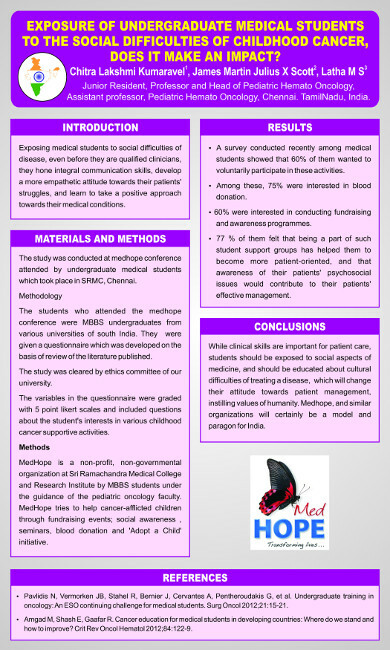 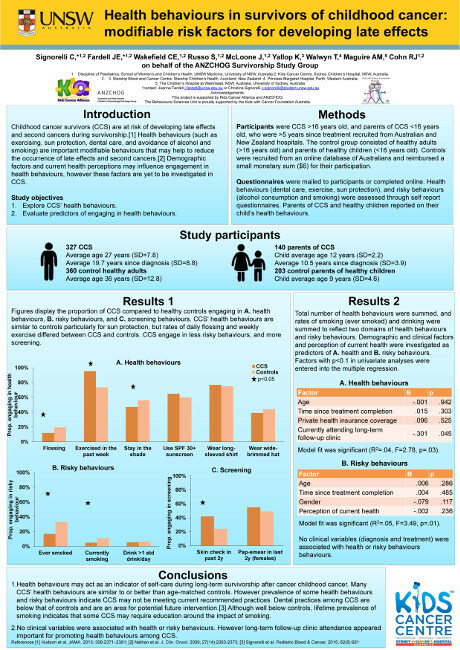 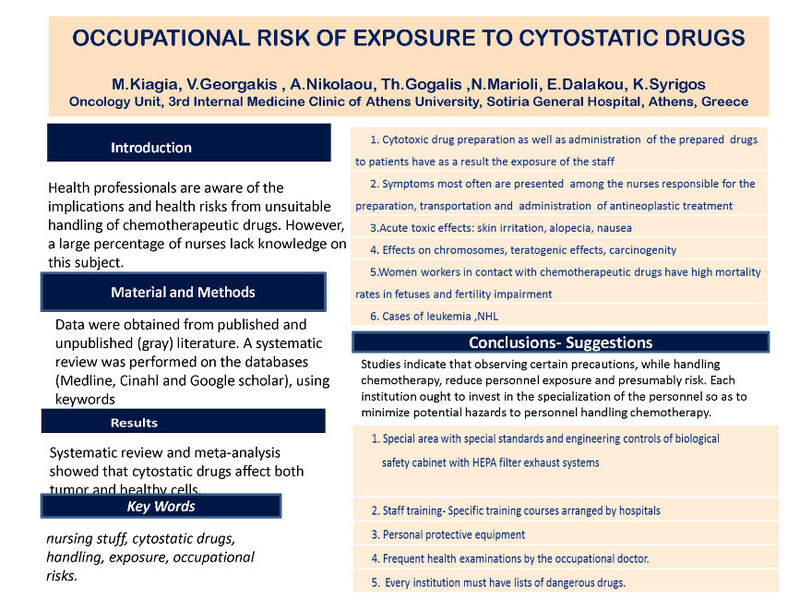 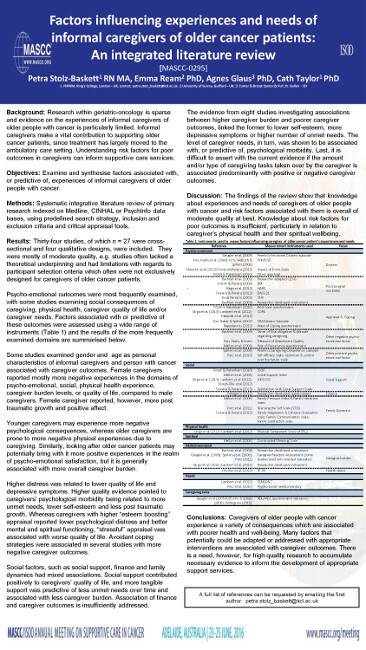 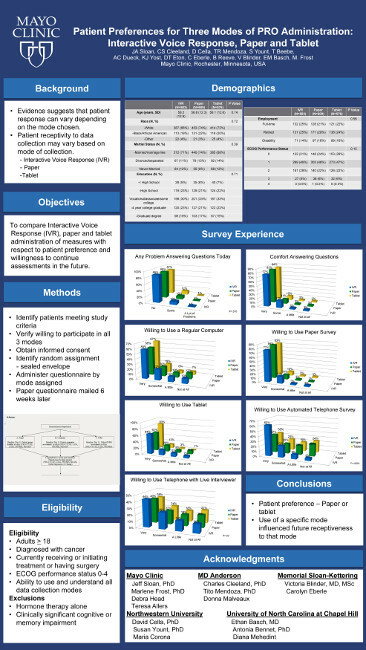 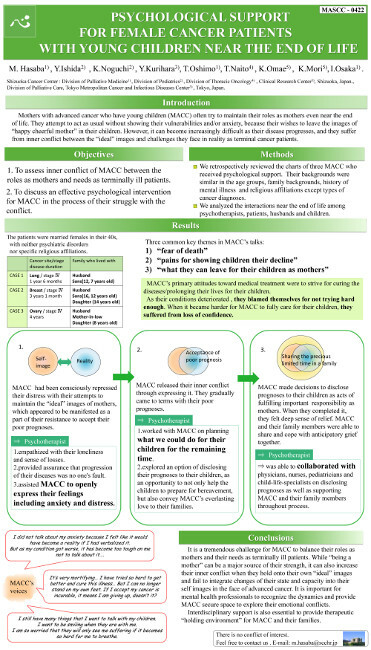 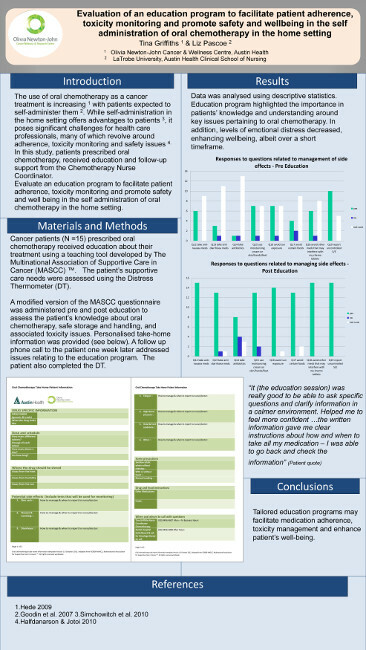 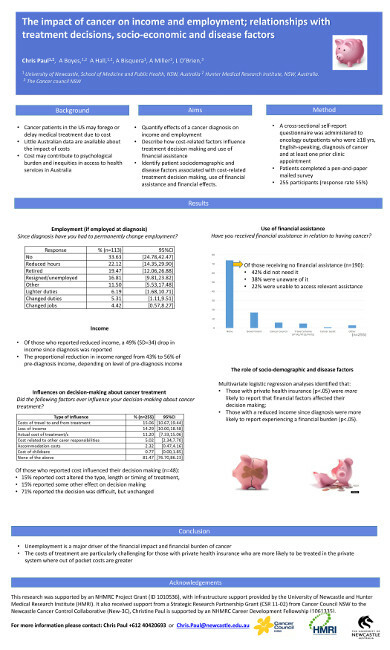 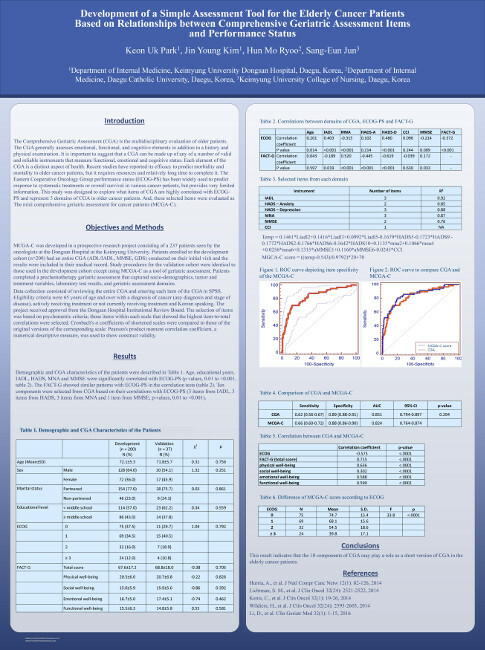 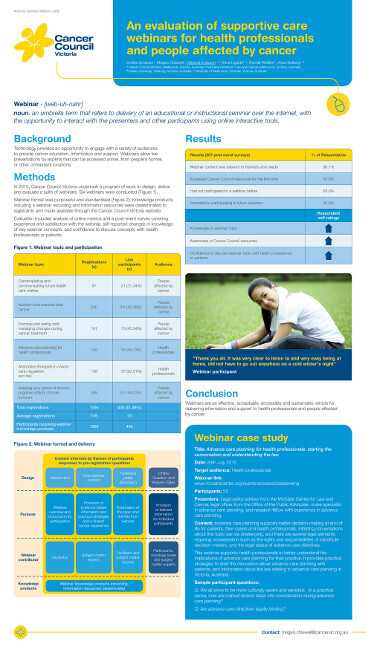 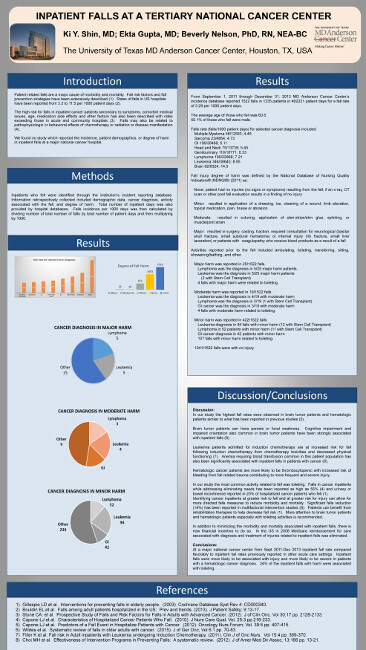 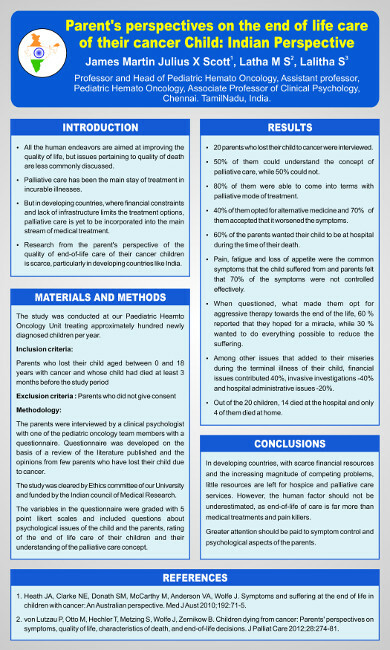 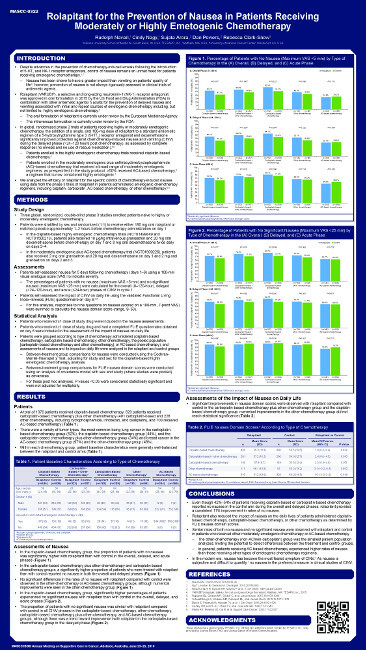 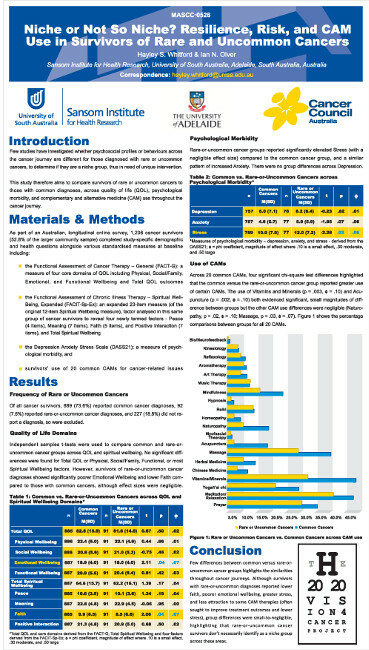 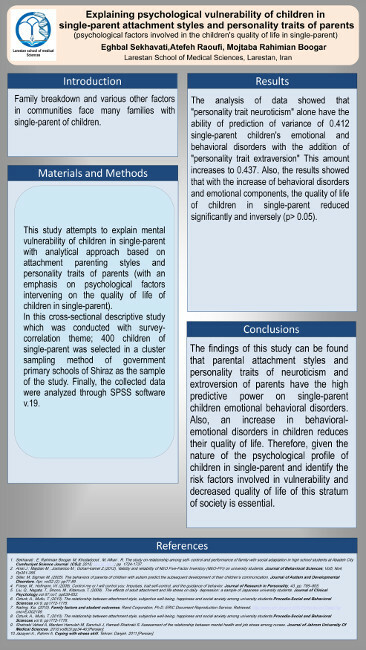 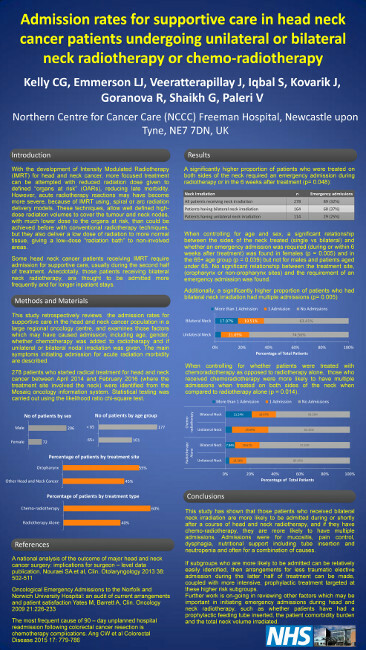 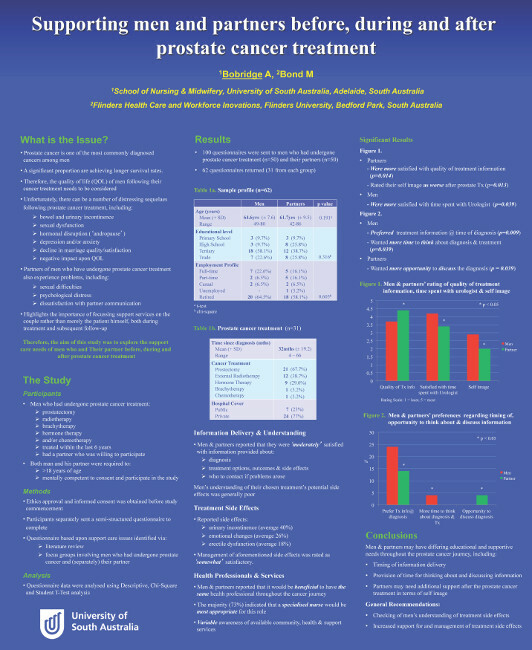 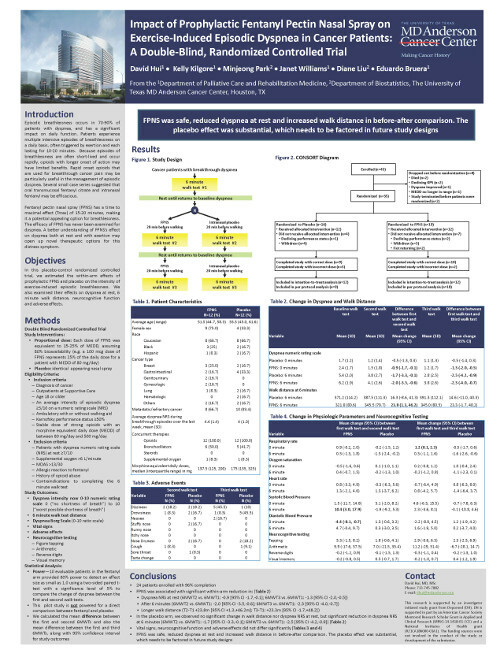 EXPOSURE OF UNDERGRADUATE MEDICAL STUDENTS TO THE SOCIAL DIFFICULTIES OF CHILDHOOD CANCER, DOES IT MAKE AN IMPACT ? 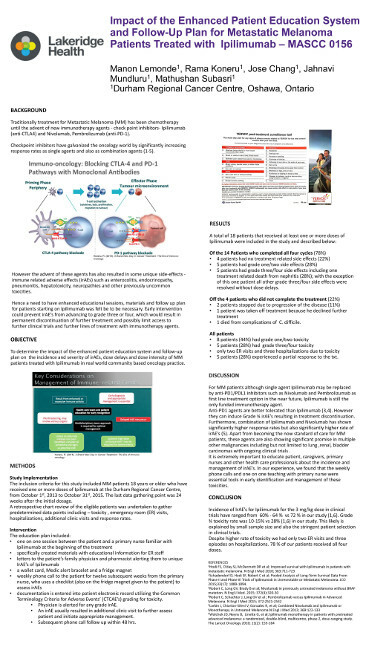 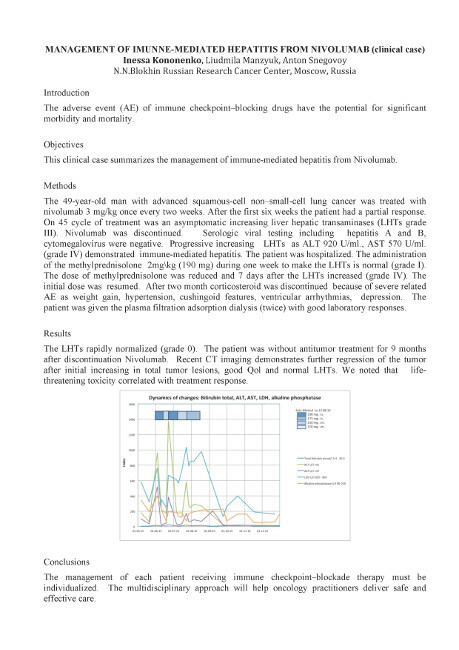 Regulation of intestinal secretory activity in an irinotecan-induced mucositis tumour bearing Dark Agouti rat model. 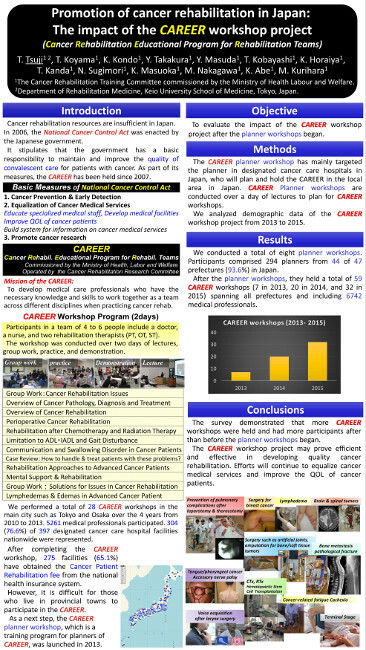 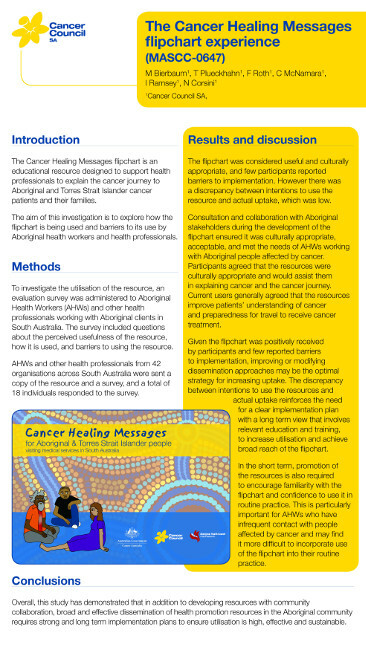 CANCER CARE EDUCATIONAL PROGRAM TO HIGH SCHOOL TEACHERS AND SCHOOL STAFF. 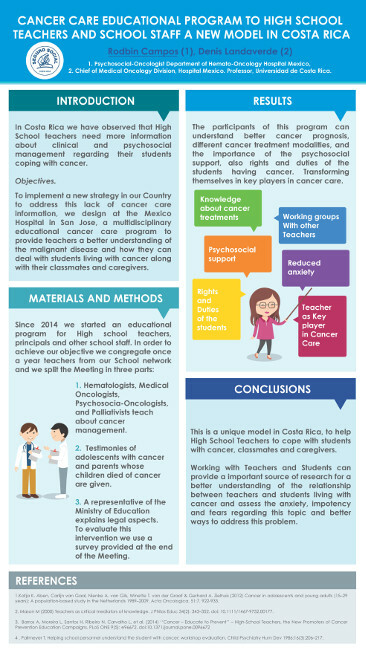 A NEW MODEL IN COSTA RICA. 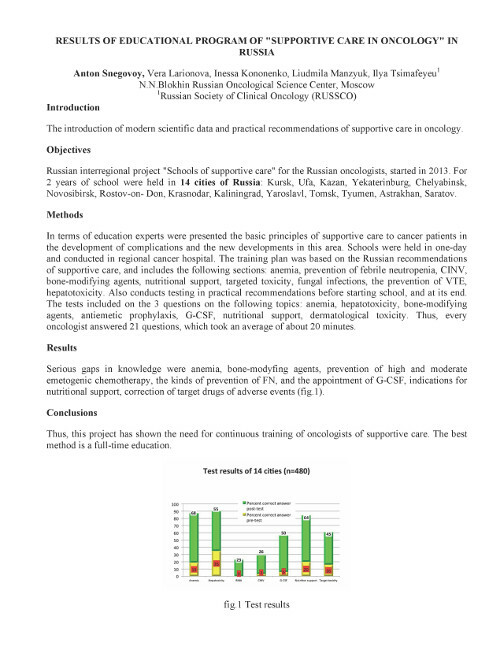 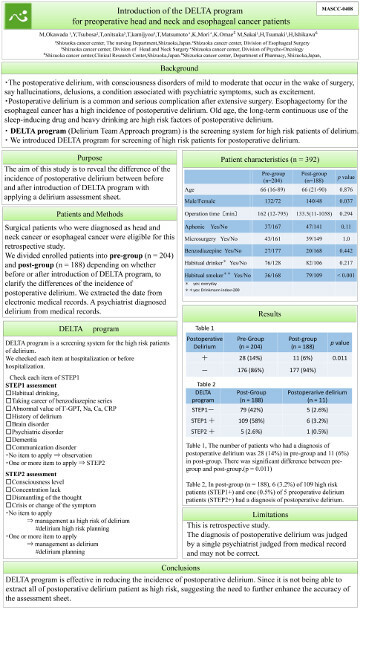 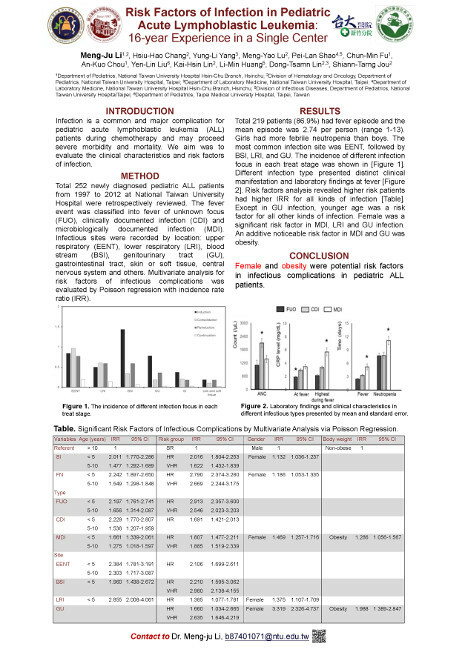 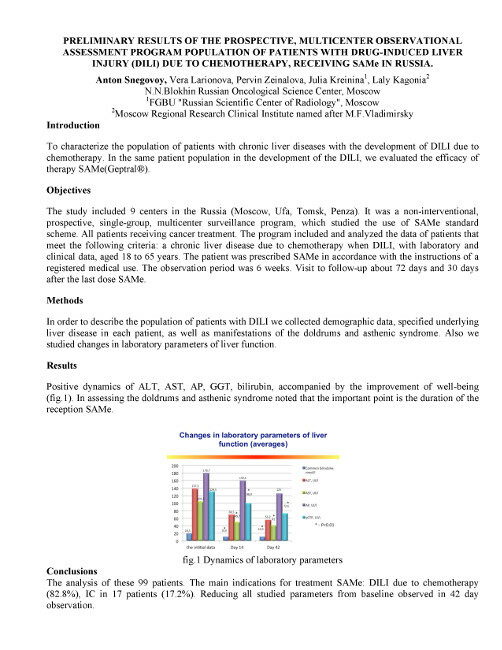 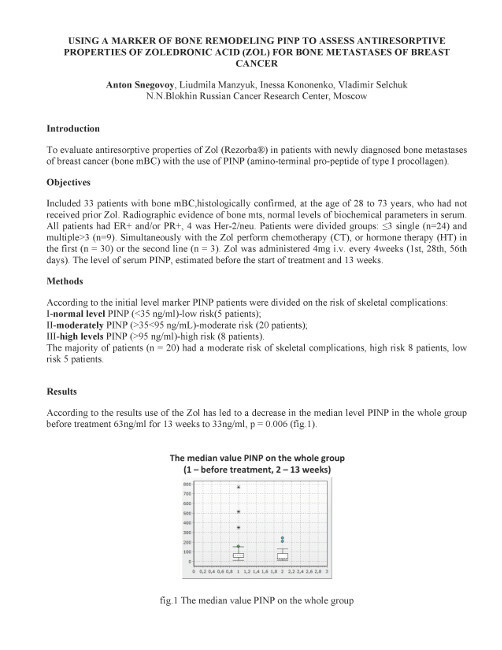 Preliminary results of the prospective, multicenter observational assessment program population of patients with drug-induced liver injury (DILI) due to chemotherapy, receiving SAMe in Russia. 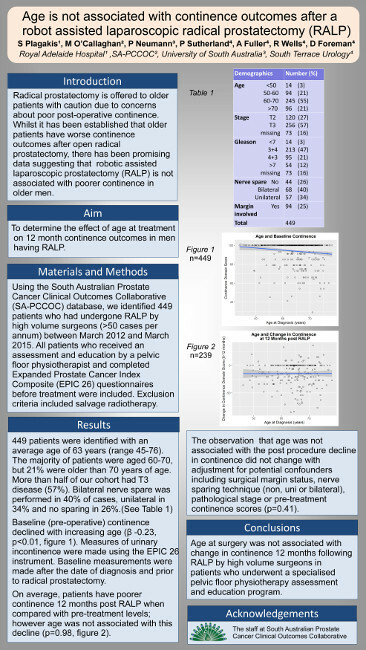 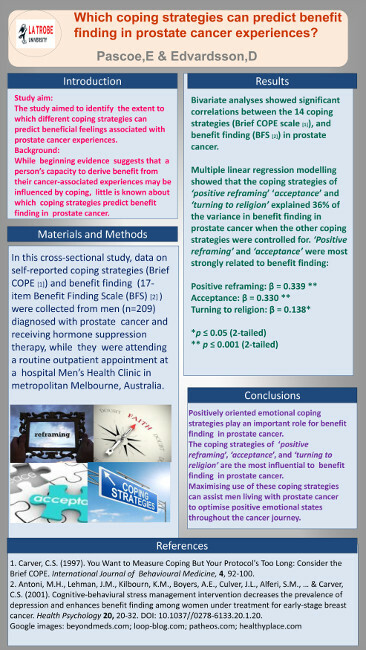 Which coping strategies can predict benefit finding in prostate cancer experiences? 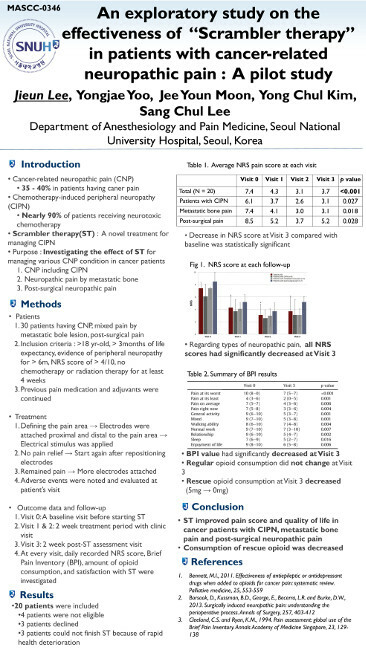 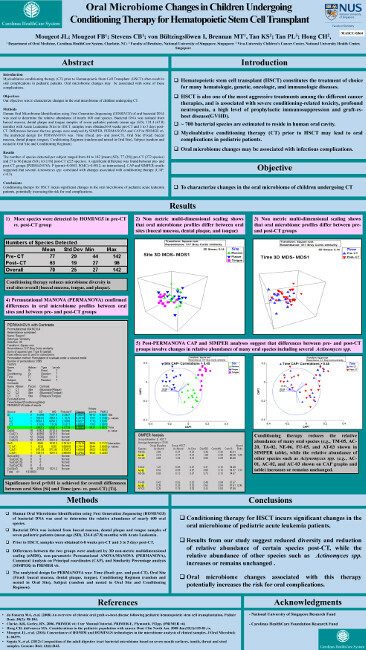 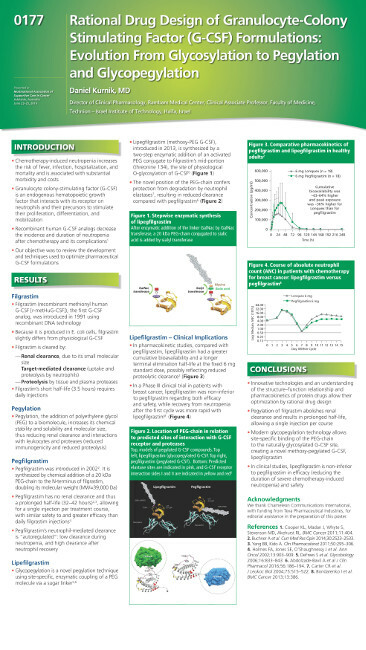 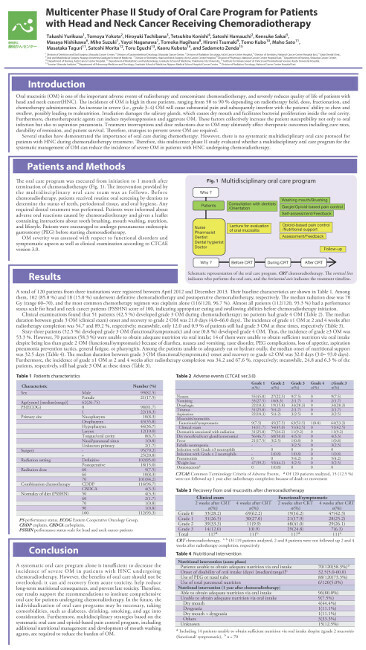 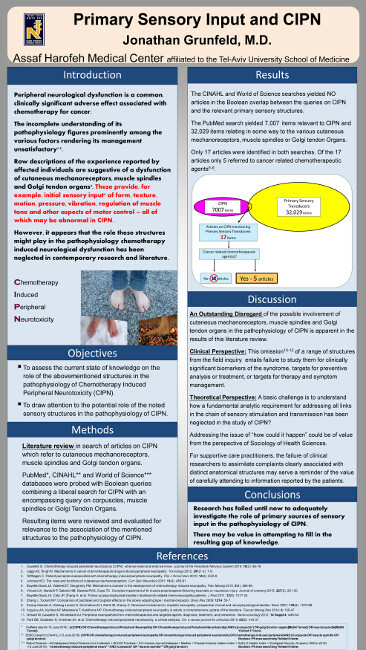 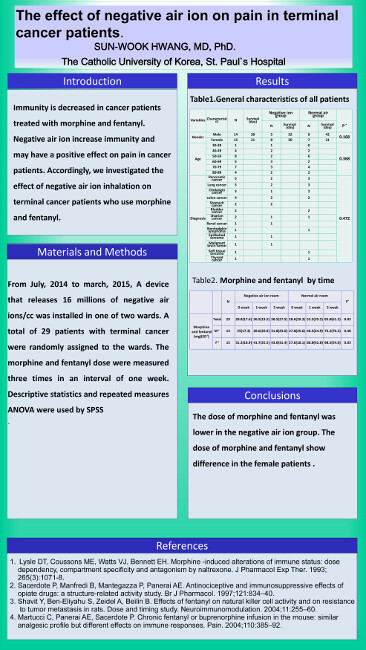 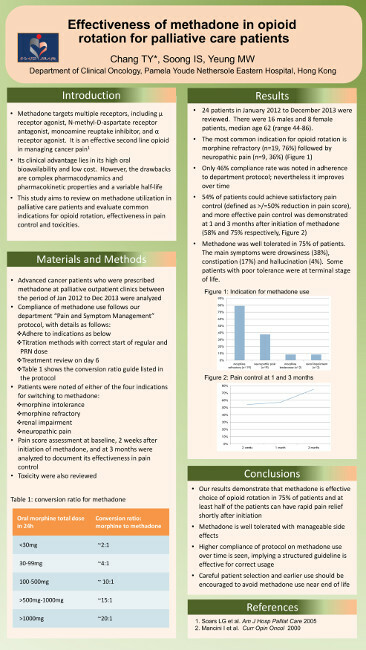 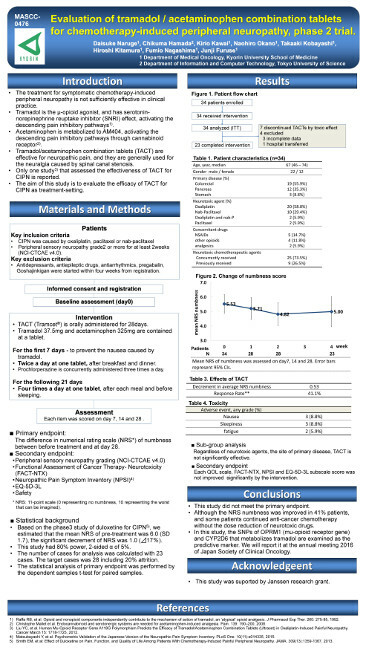 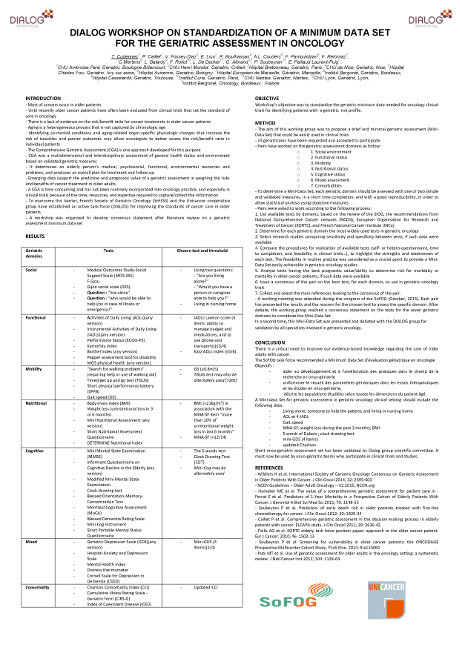 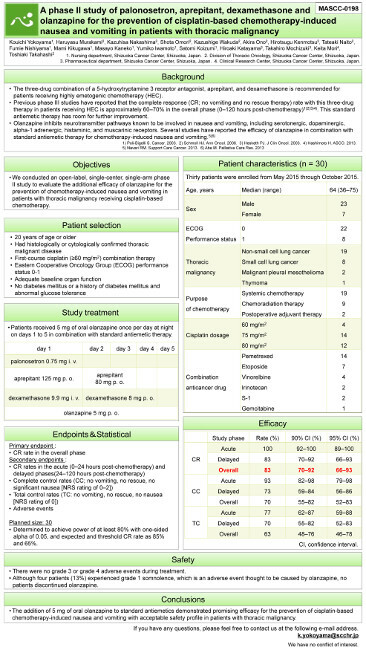 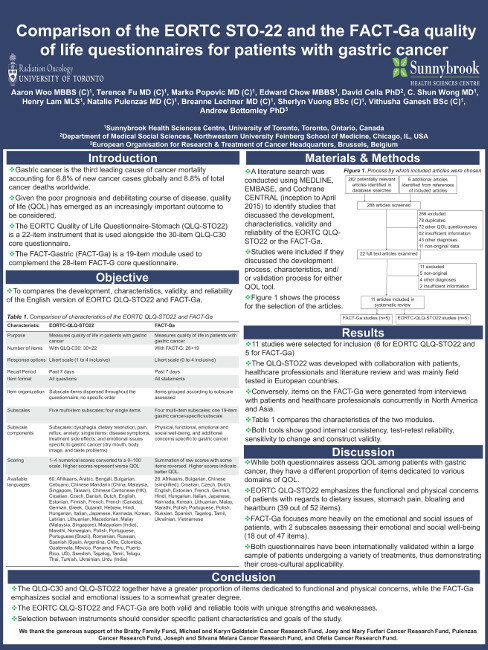 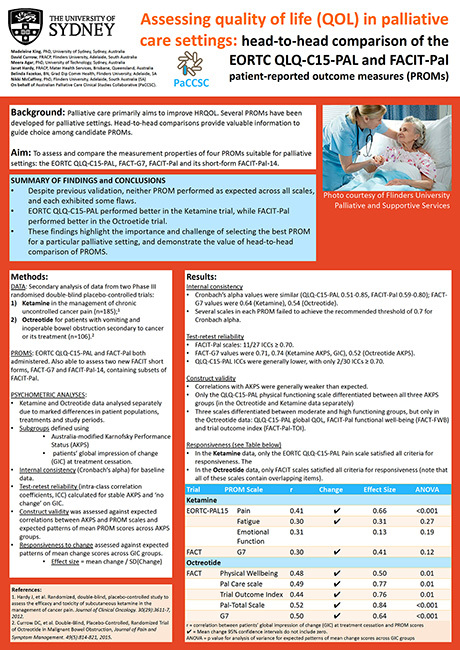 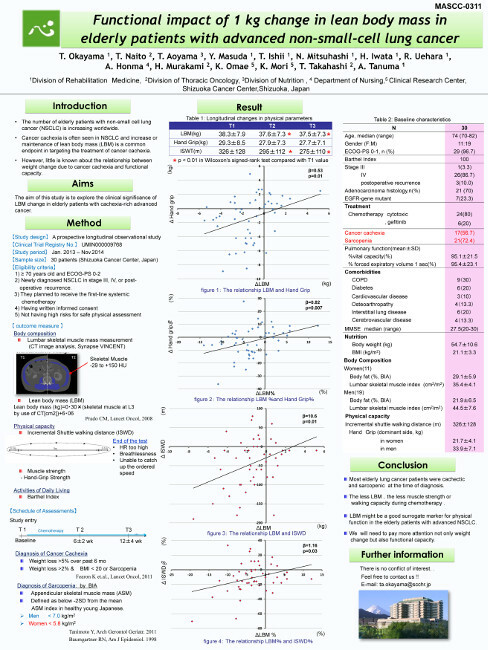 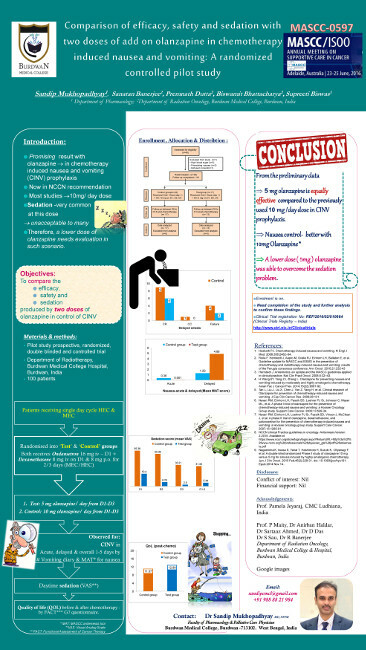 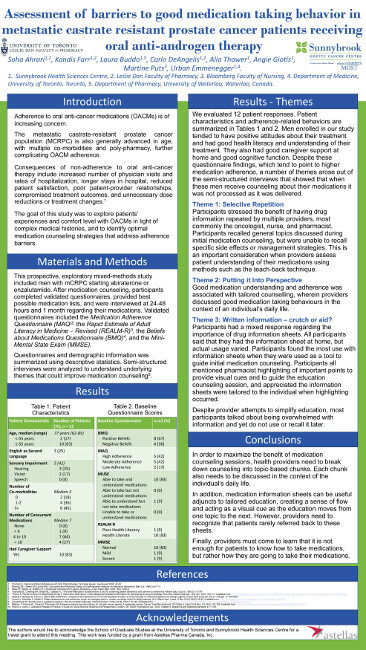 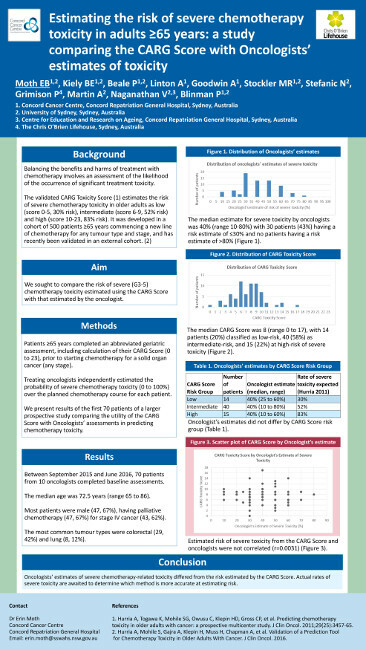 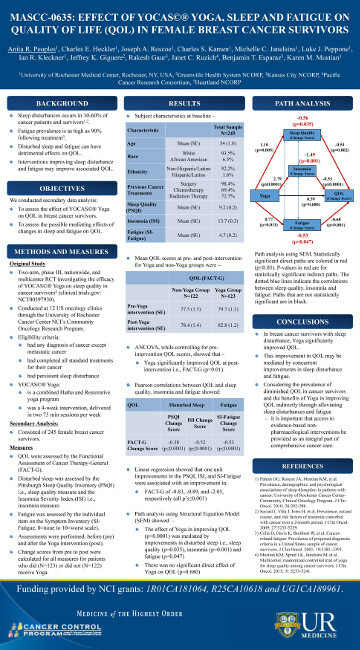 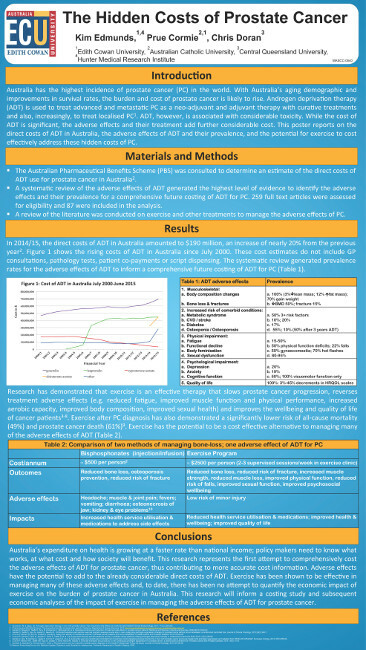 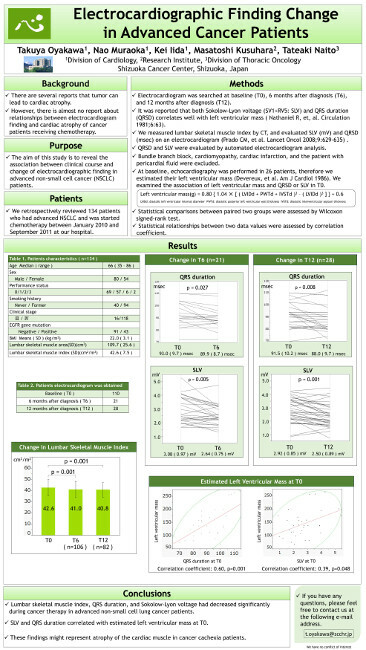 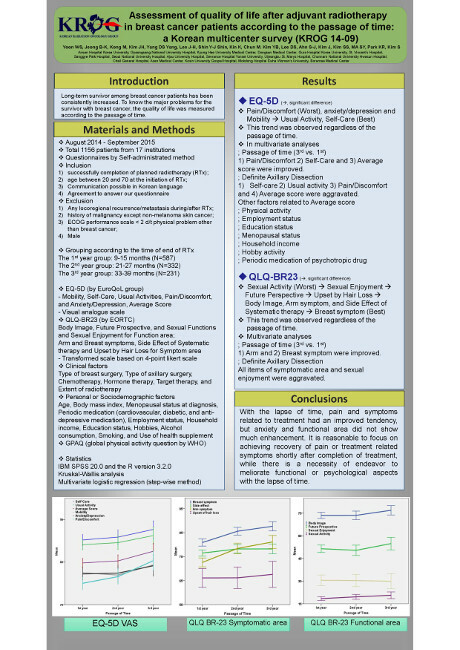 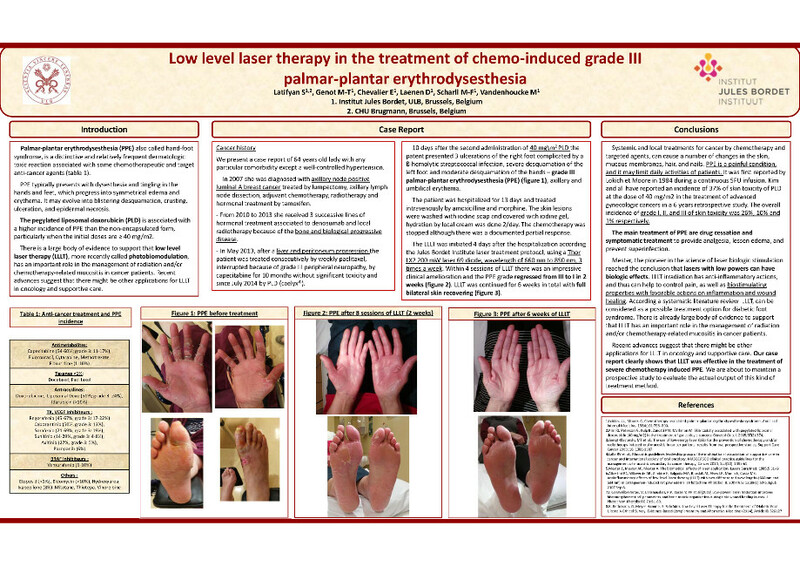 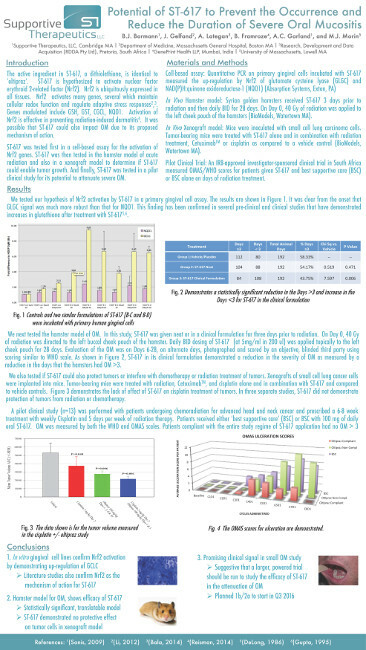 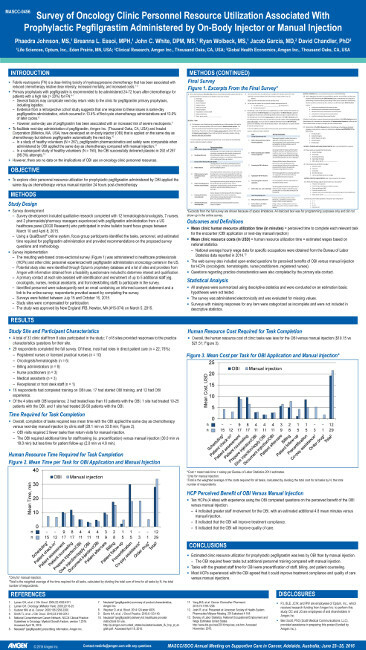 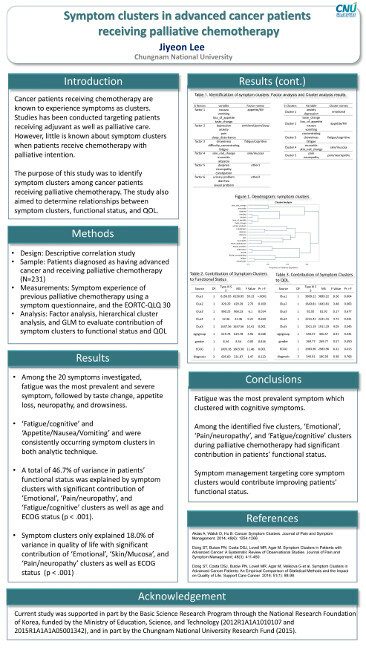 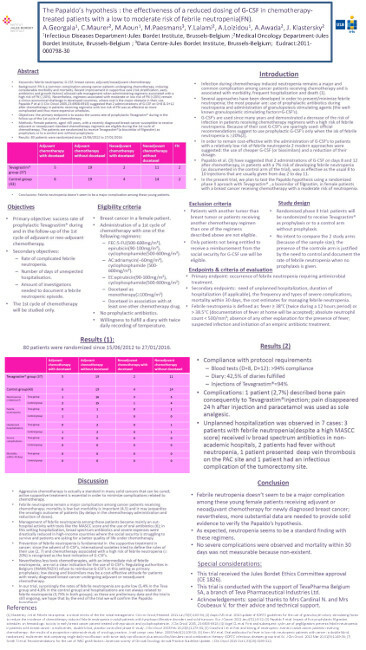 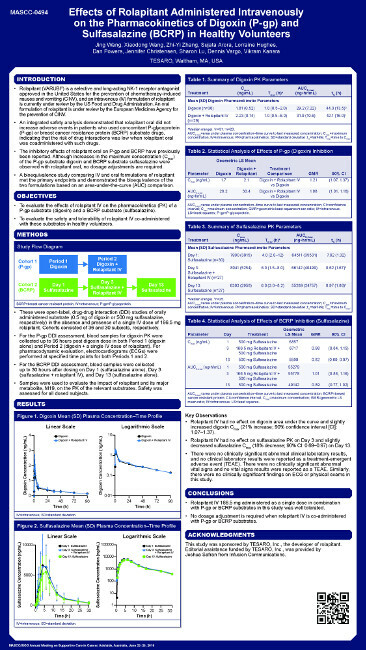 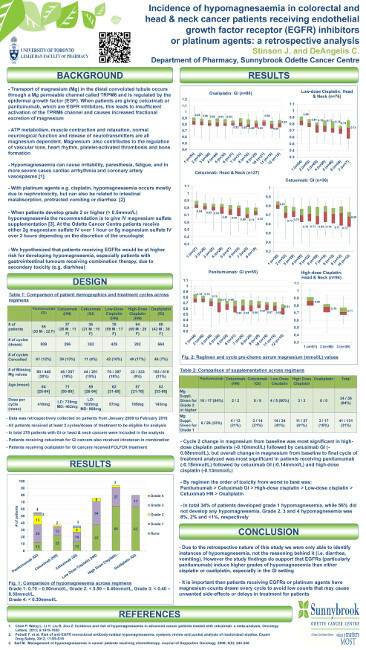 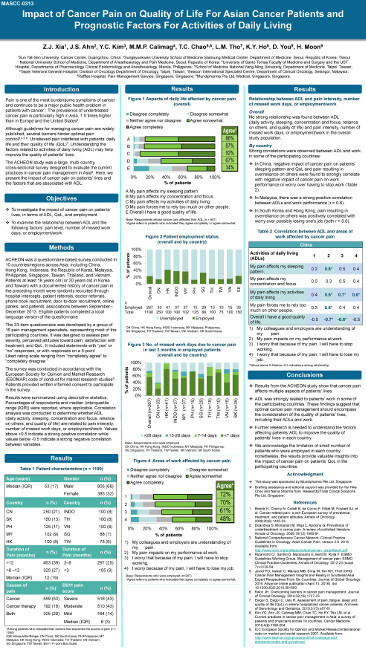 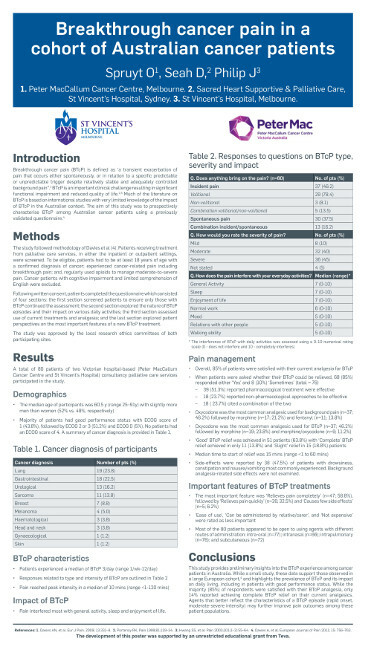 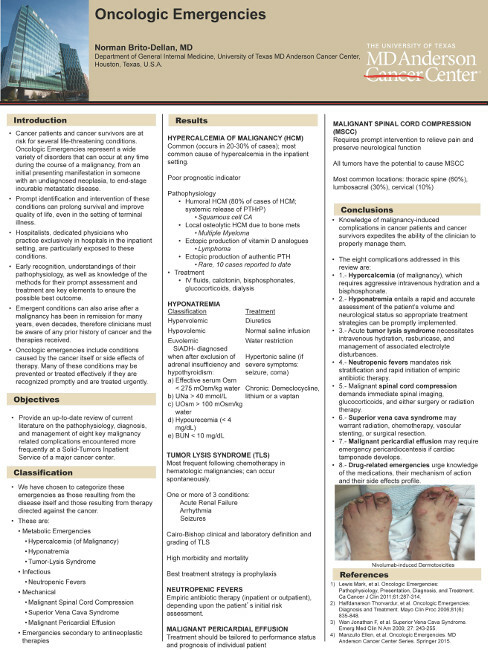 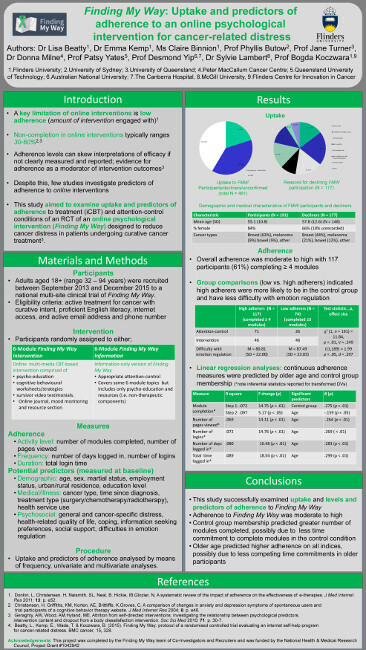 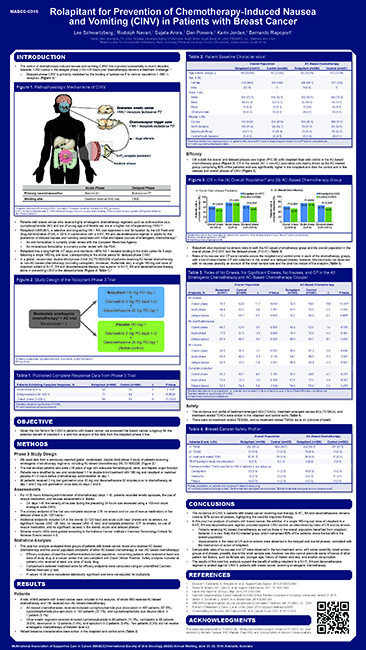 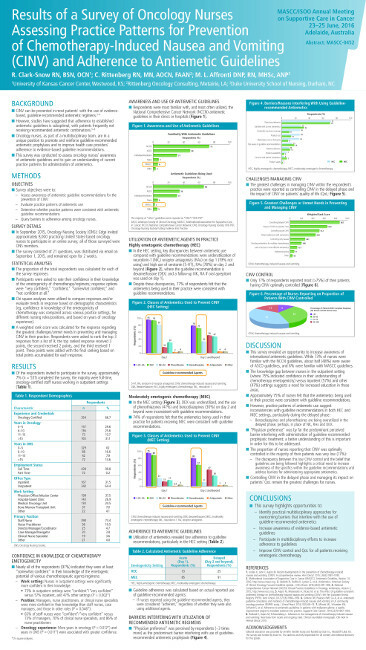 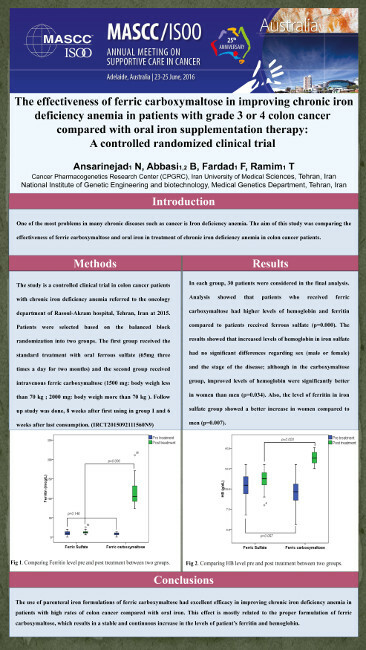 Evaluation of tramadol / acetaminophen combination tablets for chemotherapy induced peripheral neuropathy, phase 2 trial. 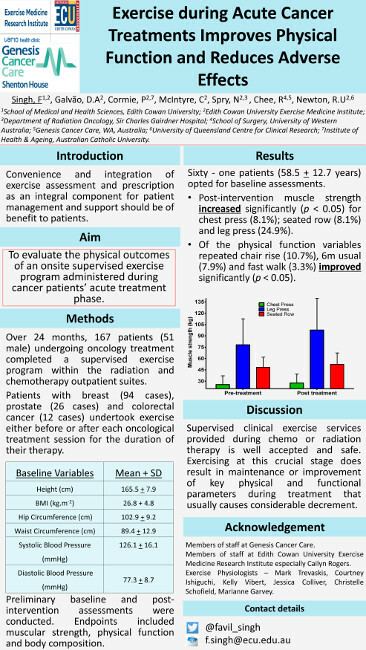 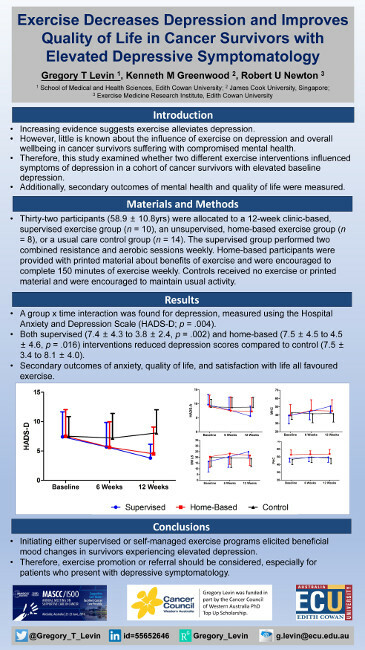 Exercising during acute cancer treatments improves physical function and reduces adverse effects. 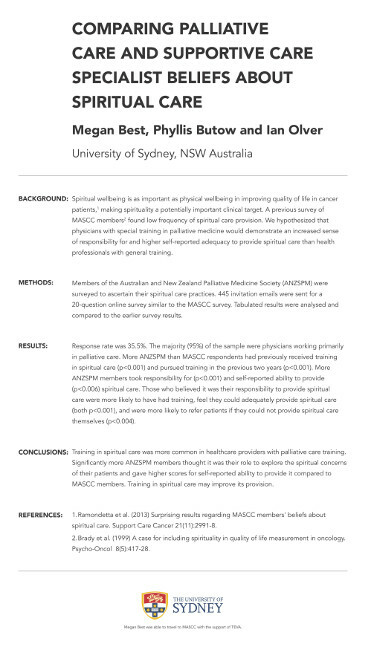 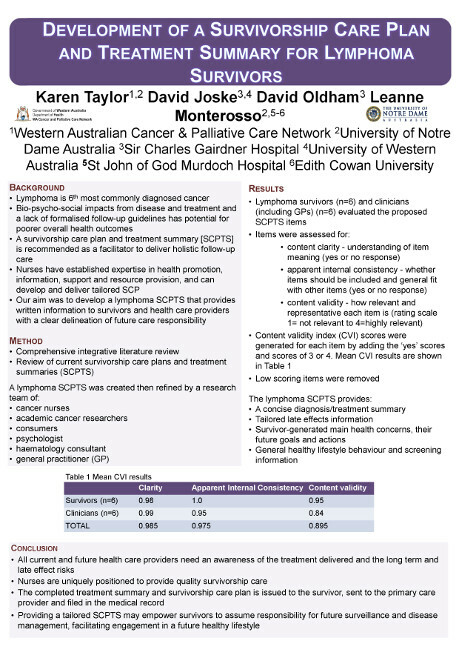 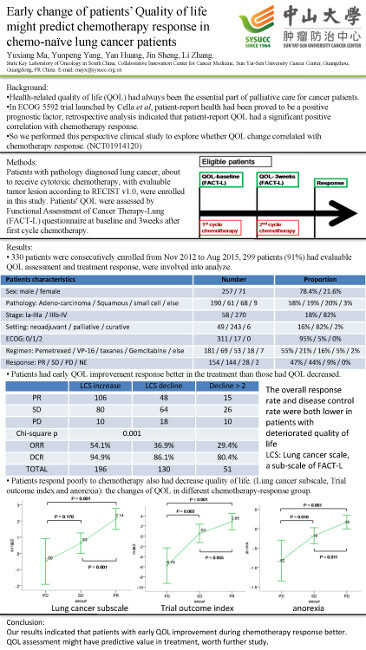 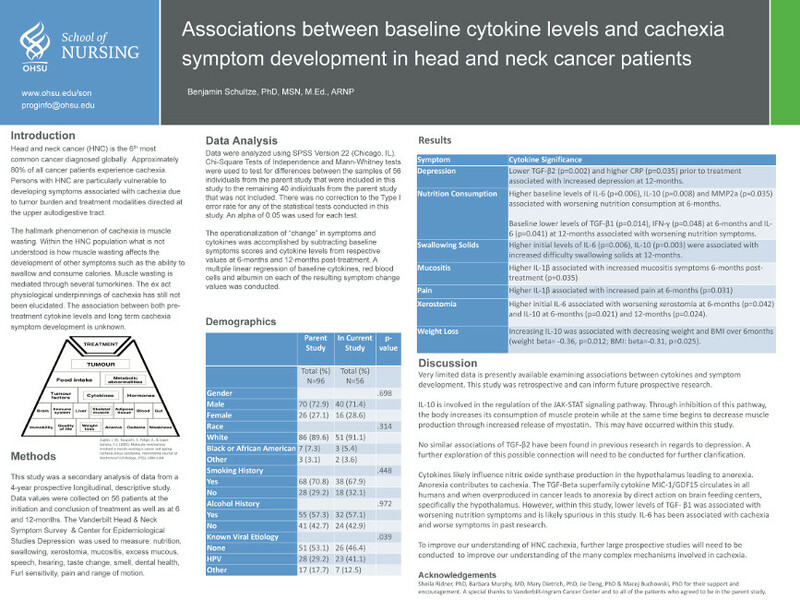 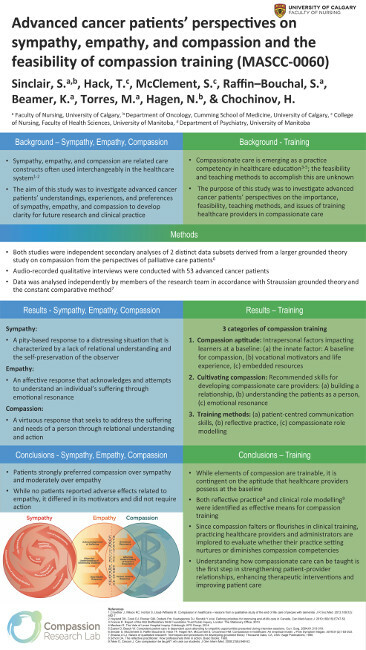 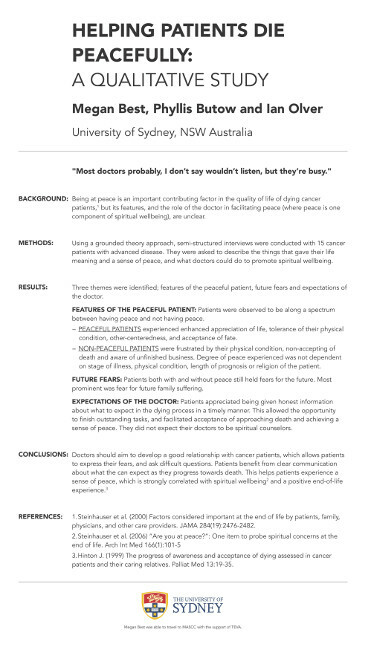 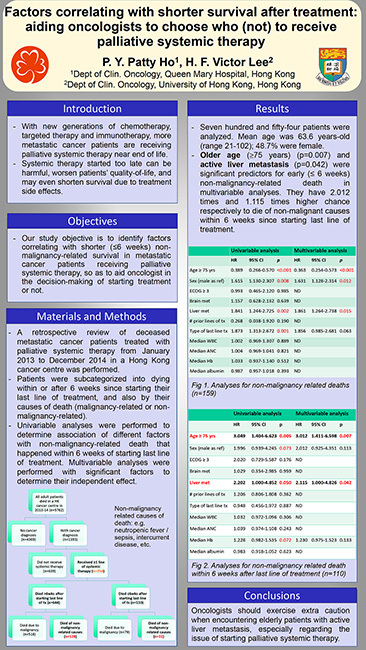 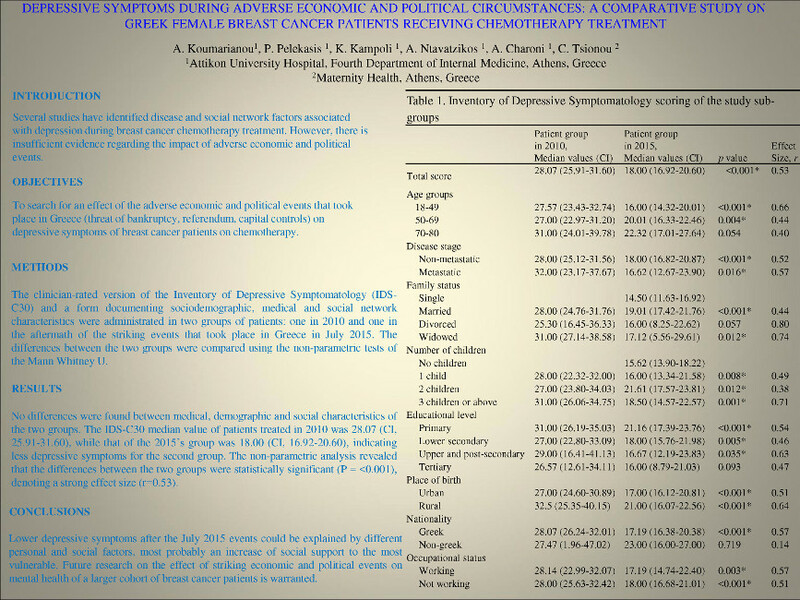 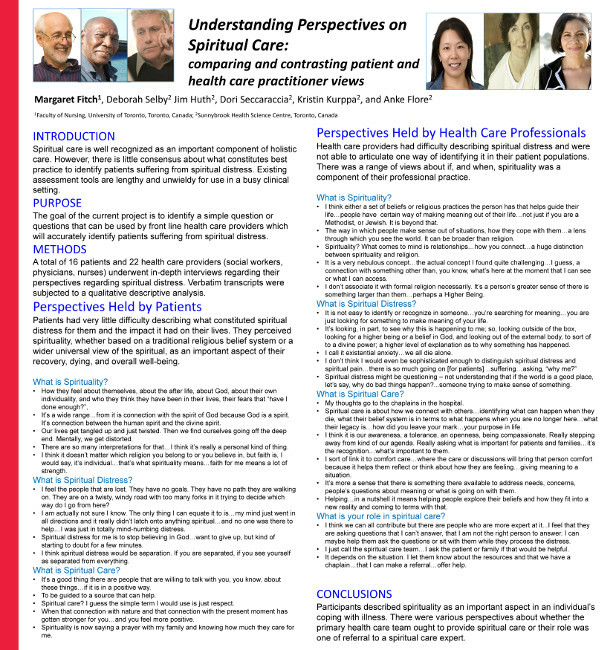 Symptom relief in dying cancer patients â€“ how good are we? 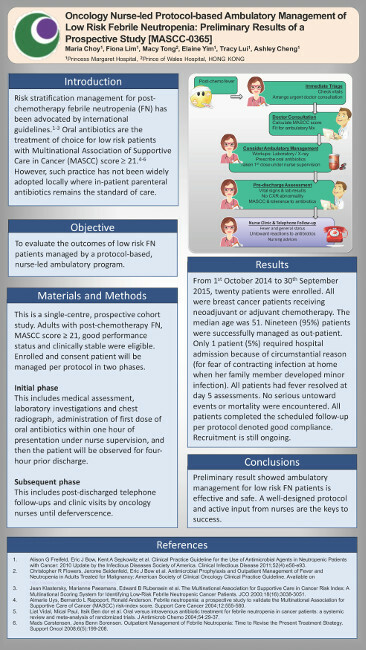 Chemotherapy-induced nausea and vomiting : an oncology-day unit experience. 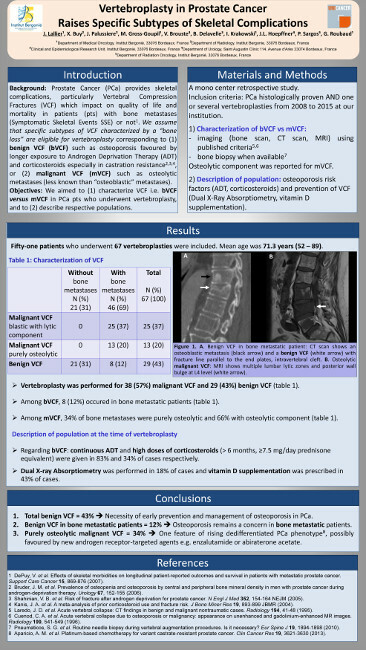 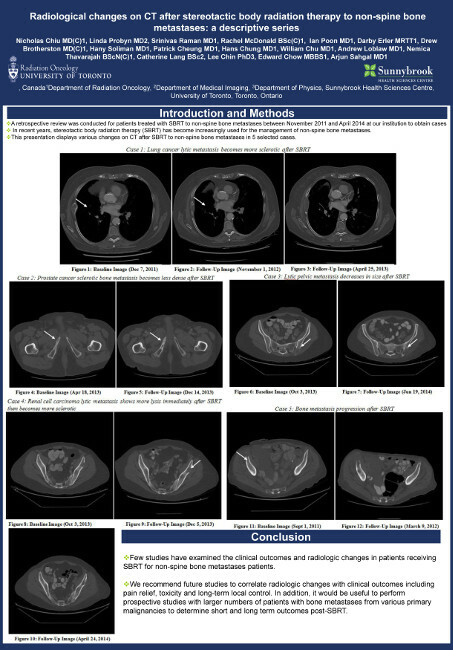 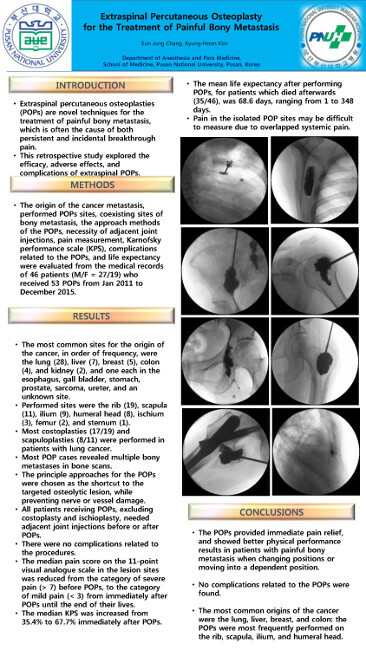 Vertebroplasty in patients with prostate cancer raises specific subtypes of skeletal complications. 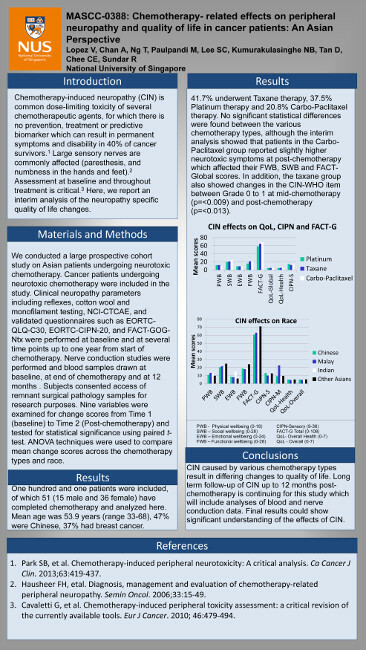 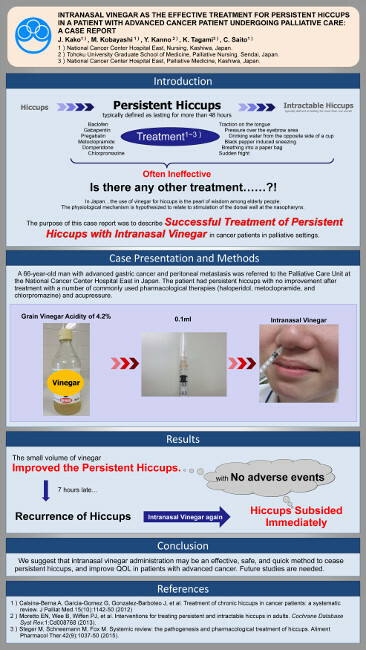 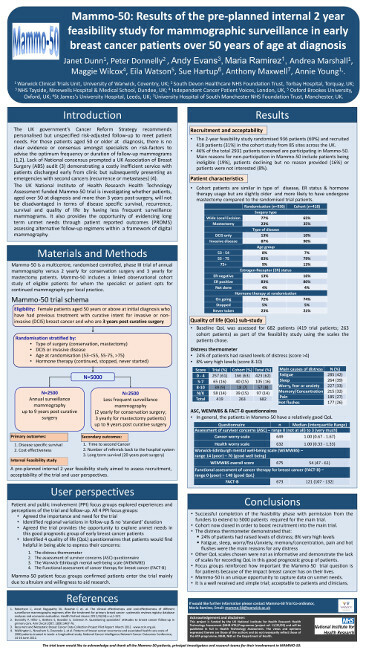 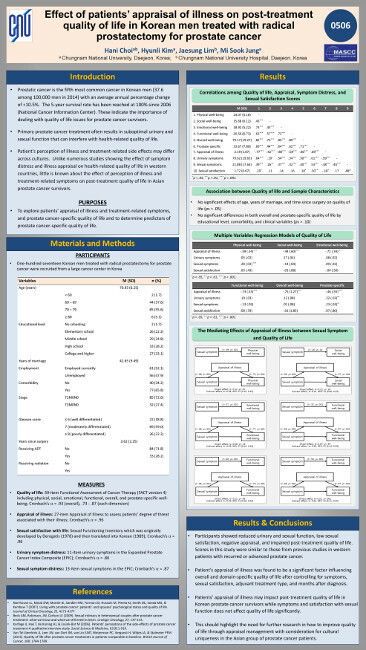 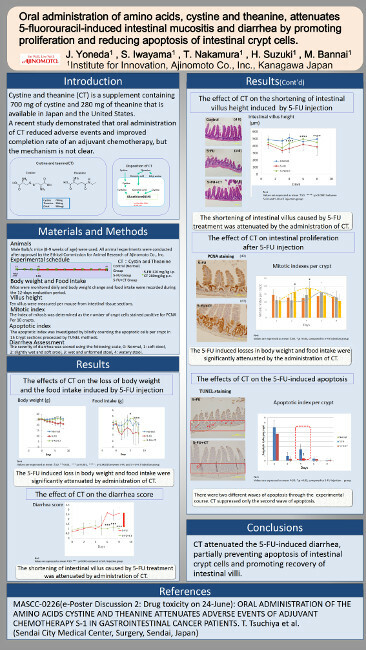 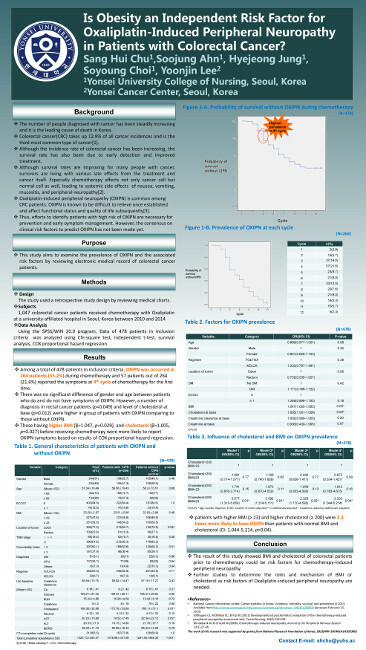 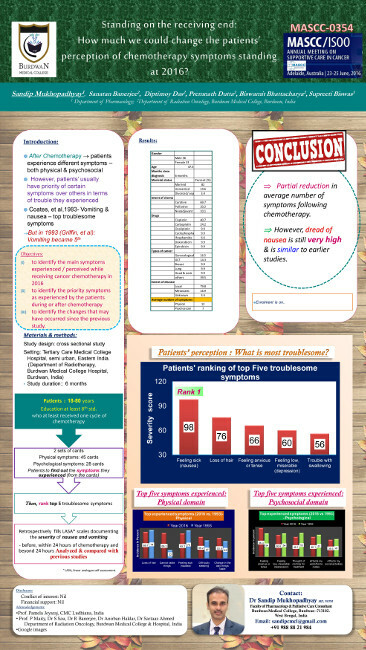 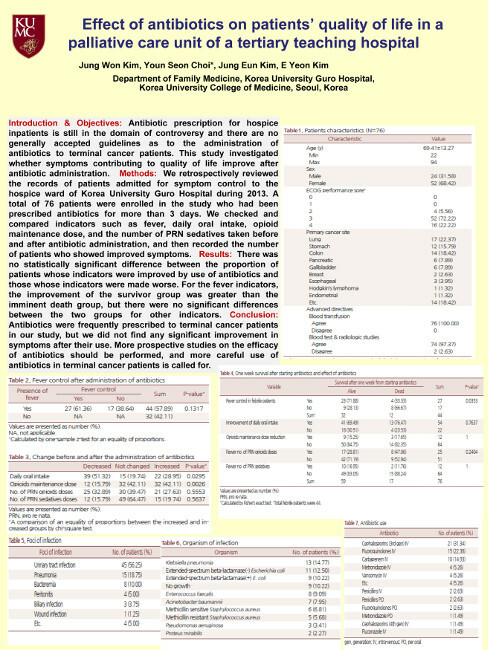 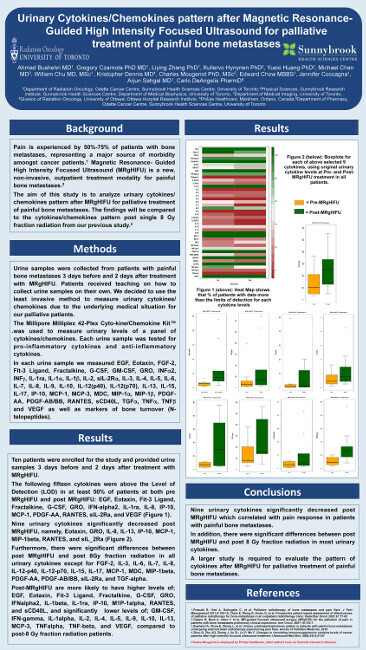 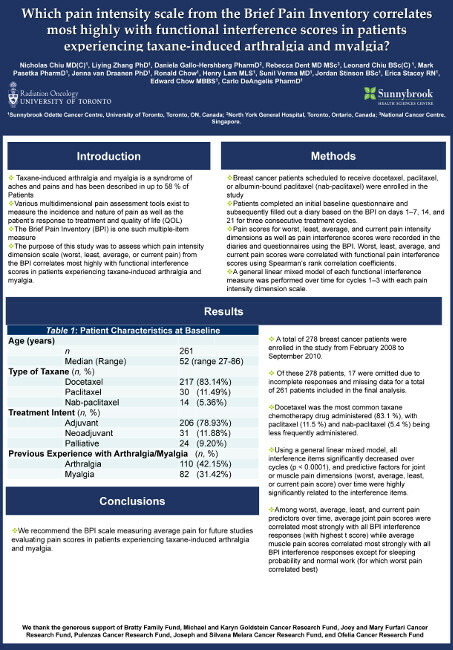 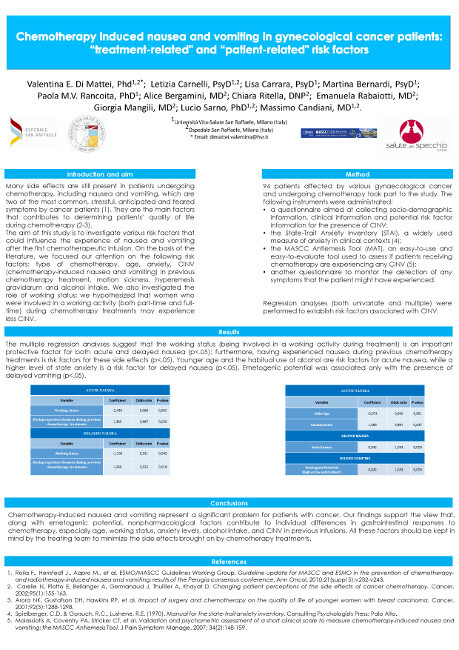 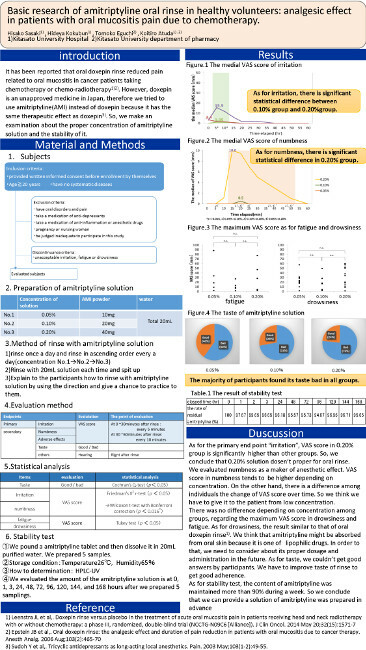 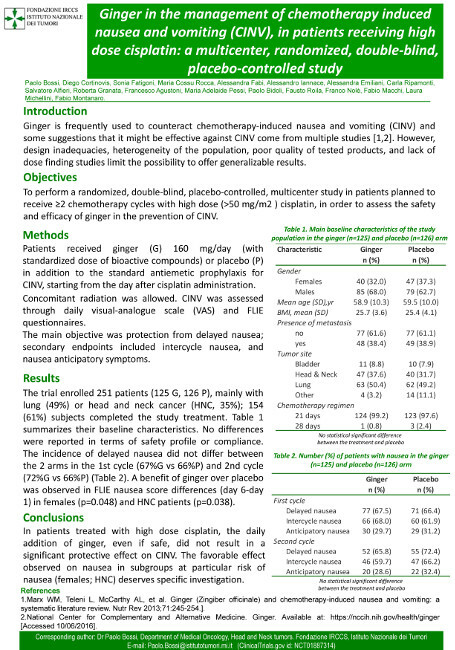 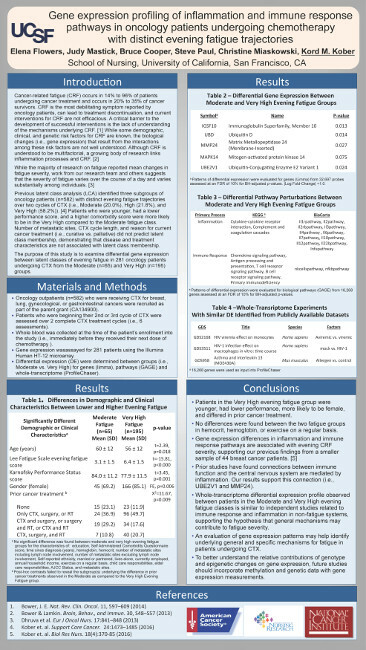 Basic research of amitriptyline oral rinse in healthy volunteers: analgesic effect in patients with oral mucositis pain due to chemotherapy. 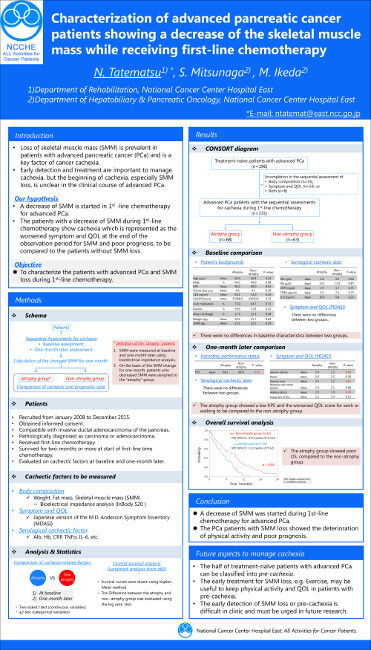 Nicotinamide adenine dinucleotide: A new therapeutic option for cisplatin-associated adverse effects. 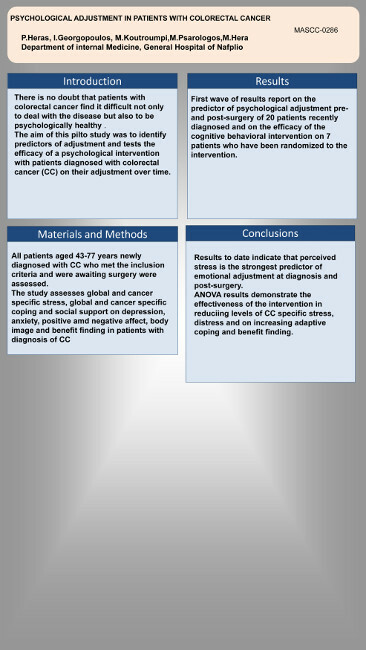 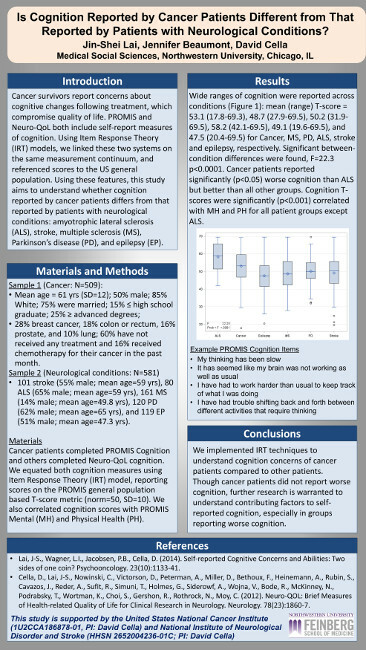 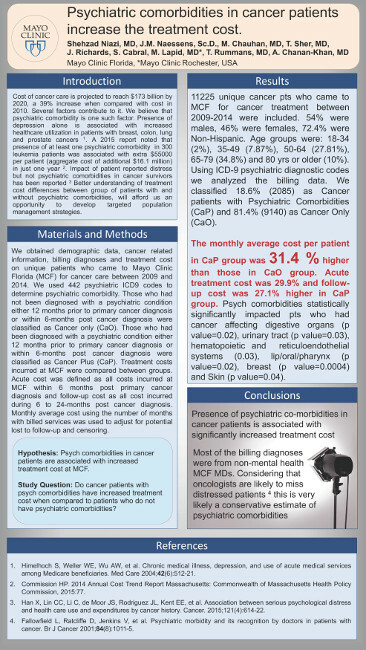 Is cognition reported by cancer patients different from that reported by patients with neurological conditions? 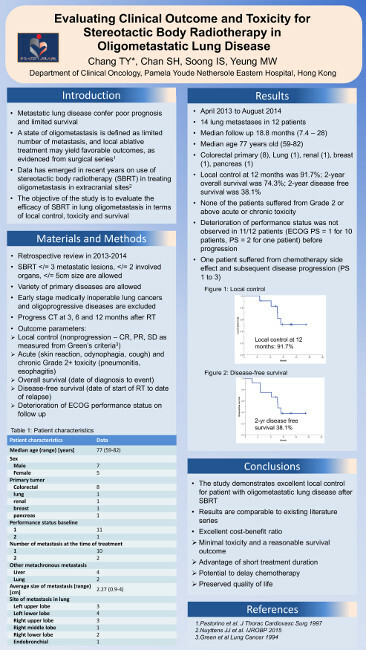 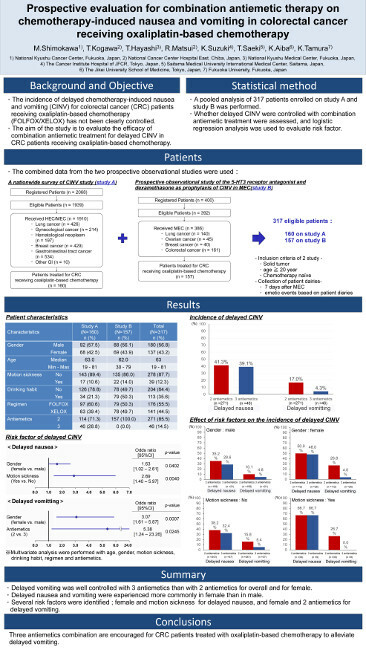 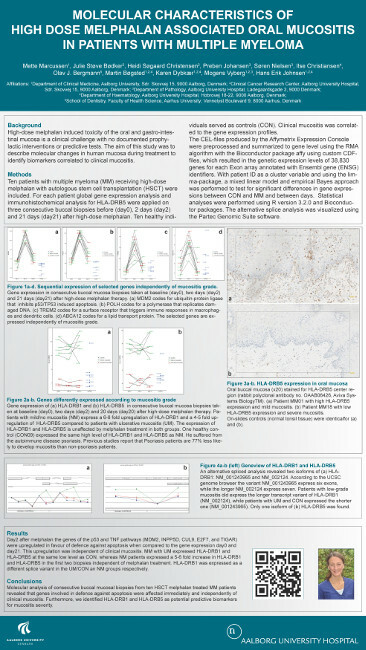 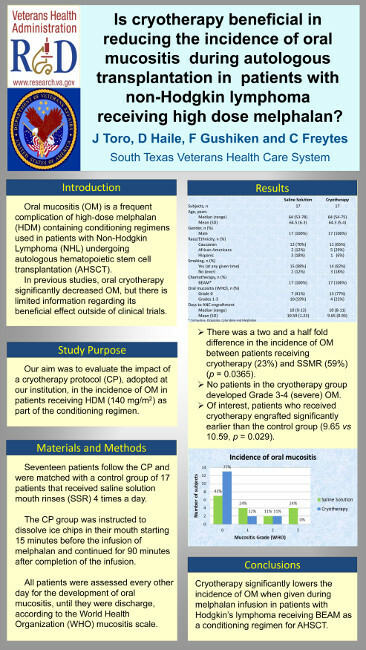 IS CRYOTHERAPY BENEFICIAL IN REDUCING THE INCIDENCE OF ORAL MUCOSITIS DURING AUTOLOGOUS TRANSPLANTATION IN PATIENTS WITH NON-HODGKIN LYMPHOMA RECEIVING HIGH DOSE MELPHALAN? 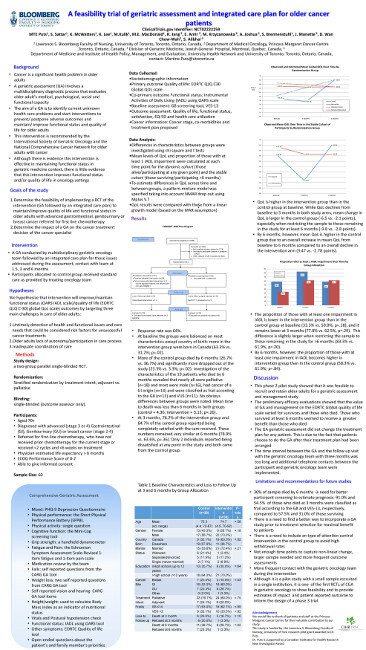 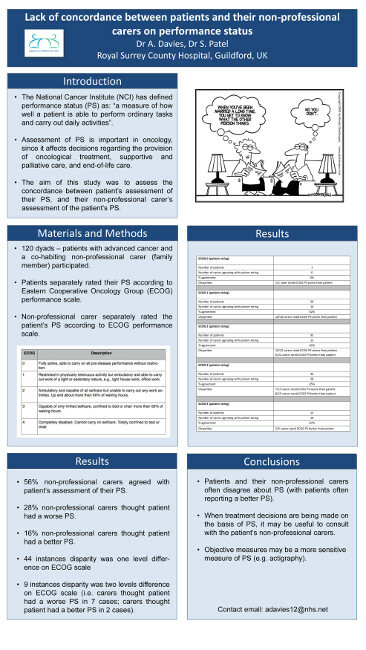 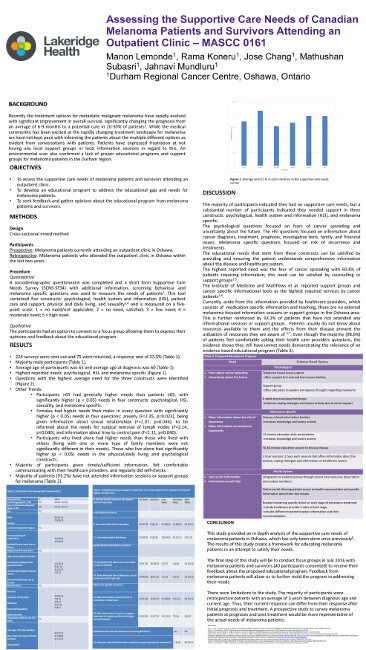 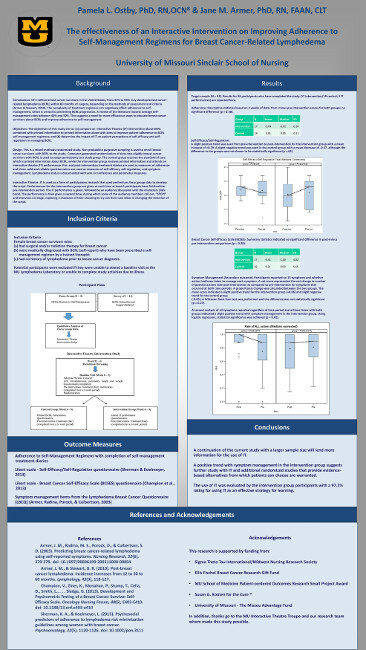 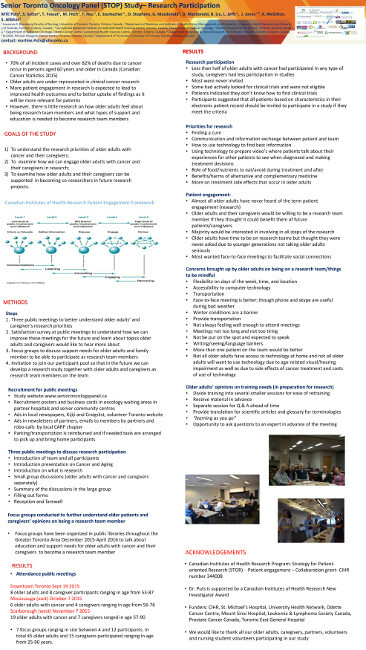 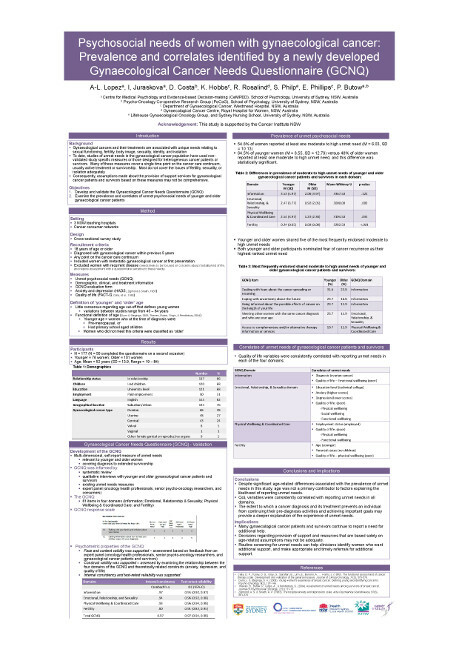 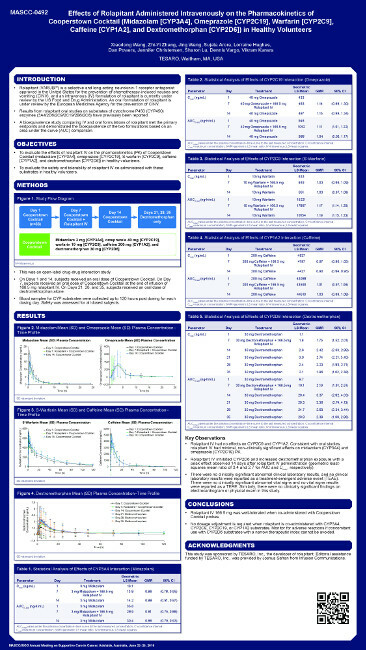 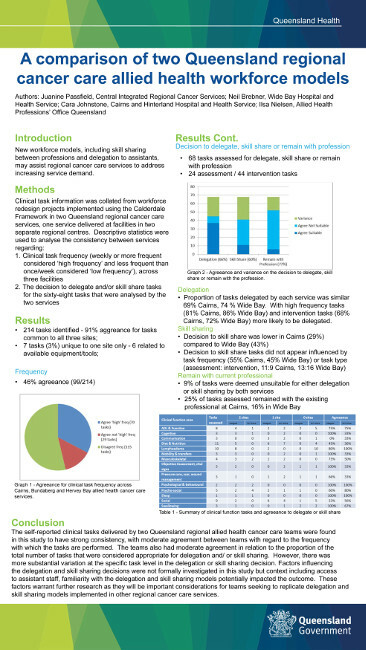 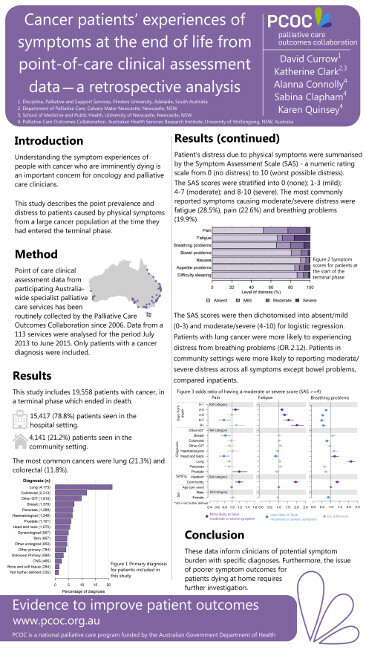 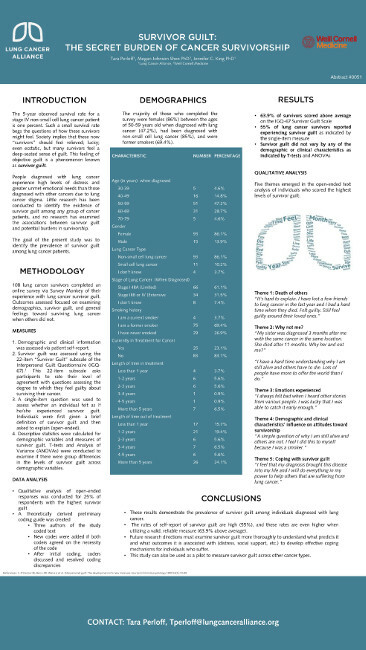 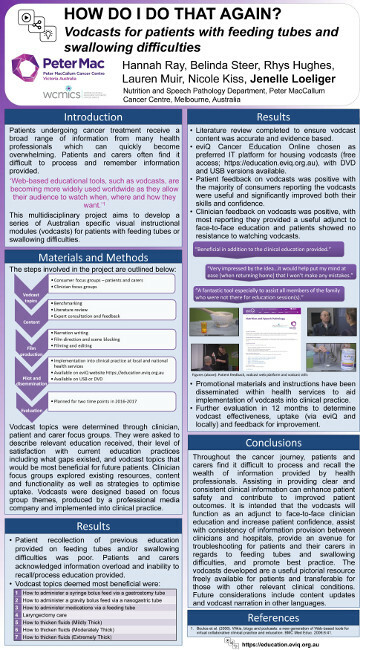 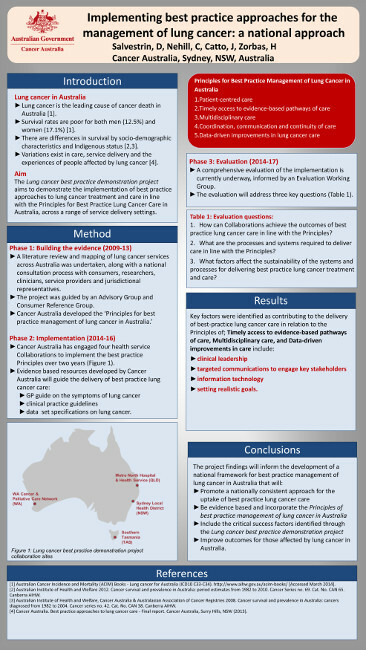 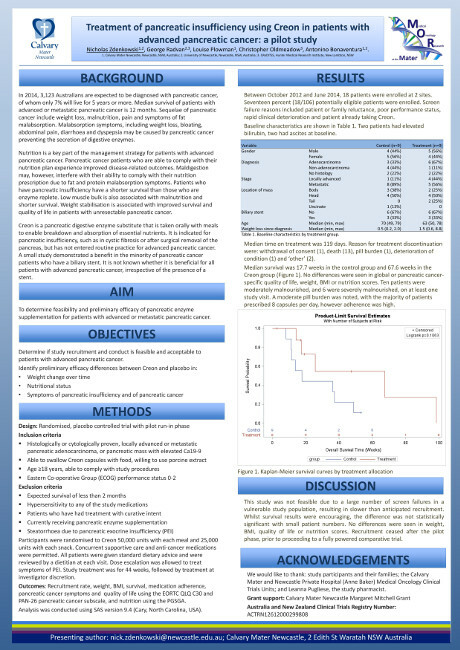 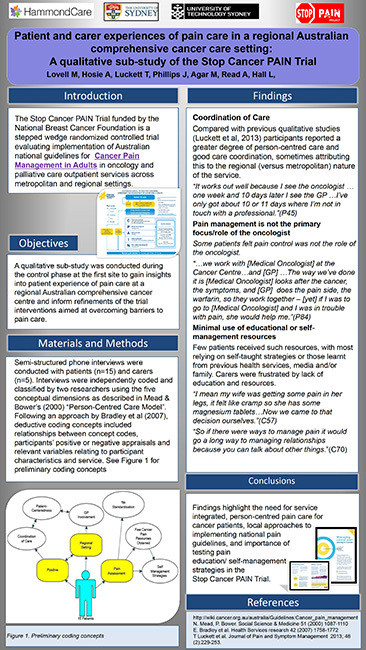 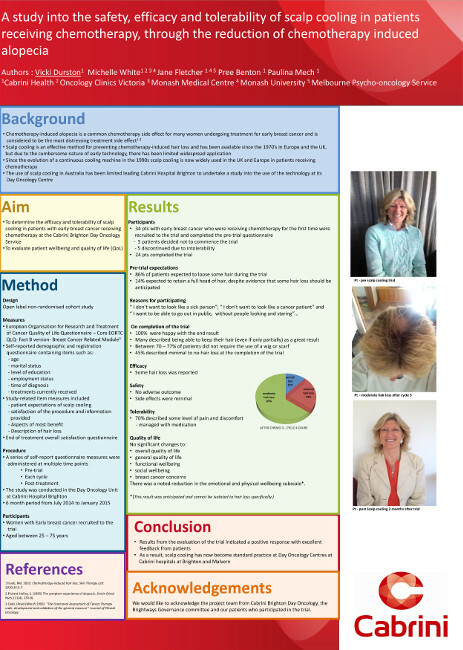 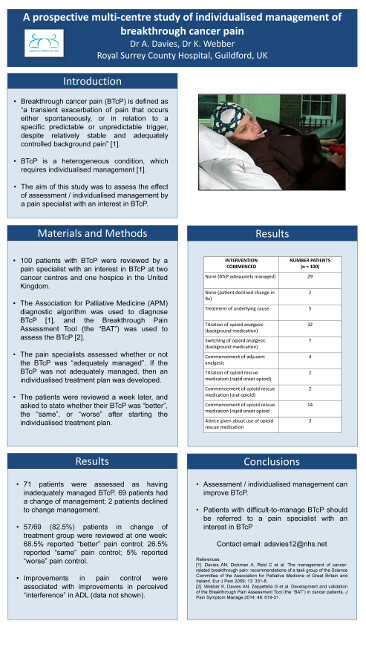 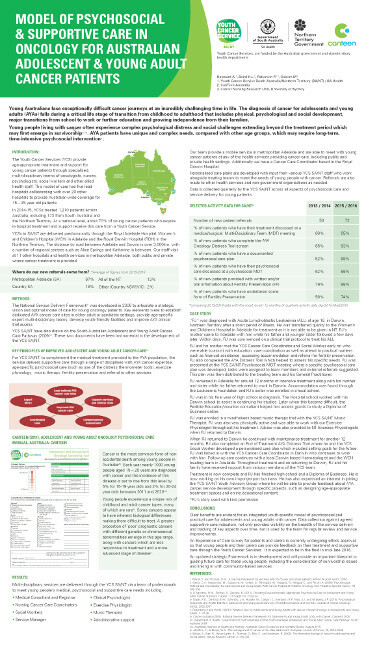 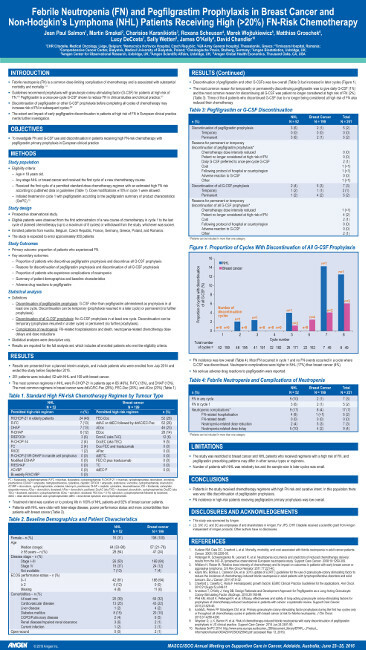 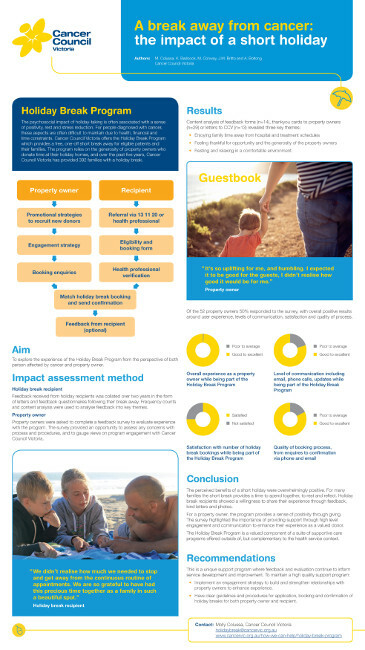 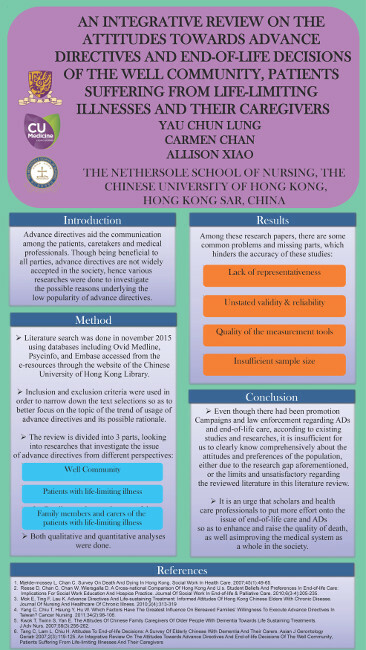 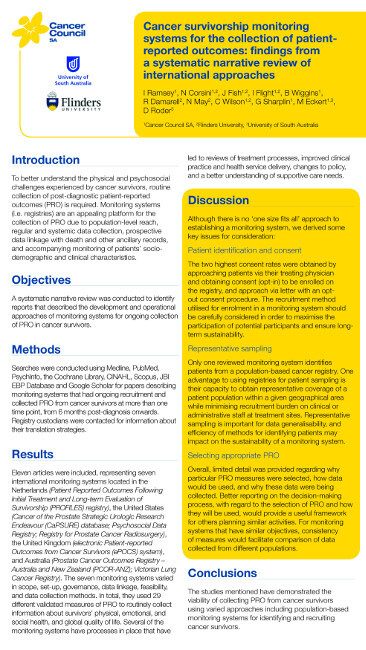 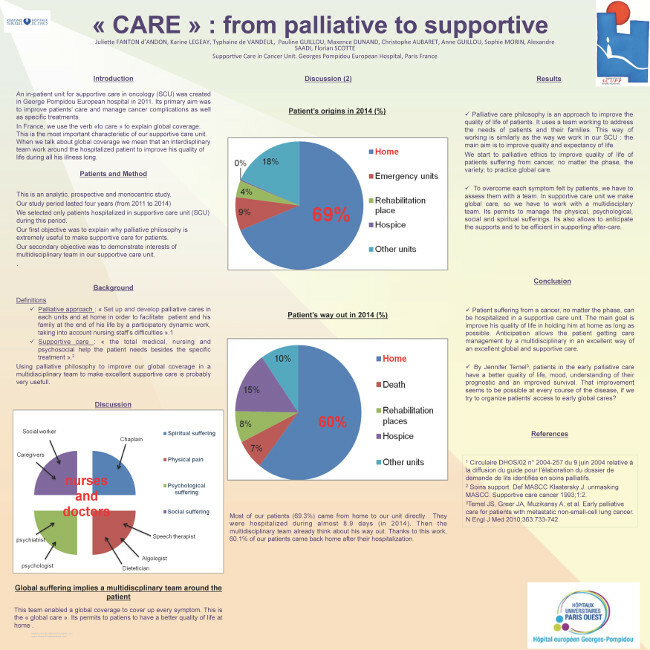 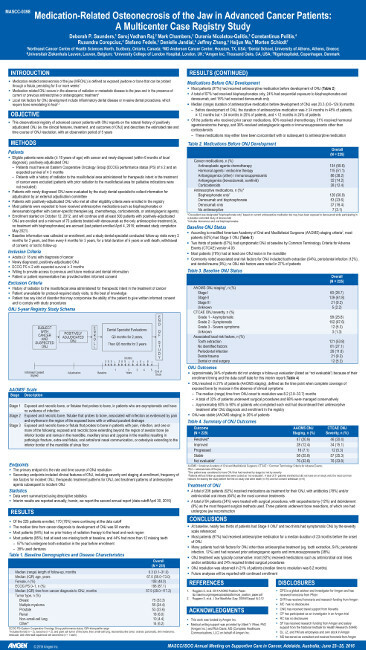 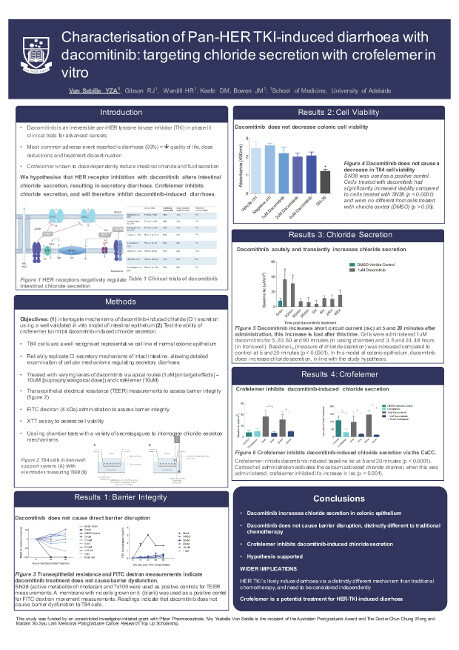 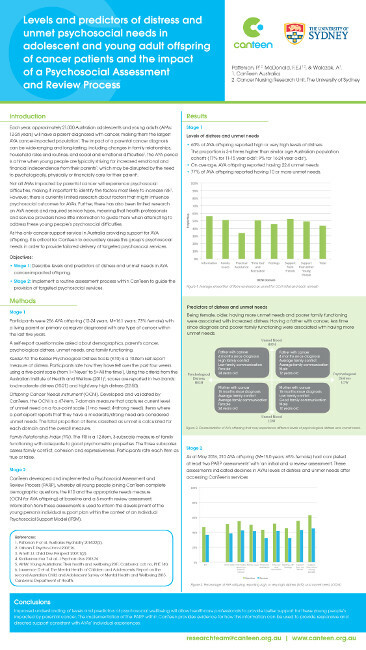 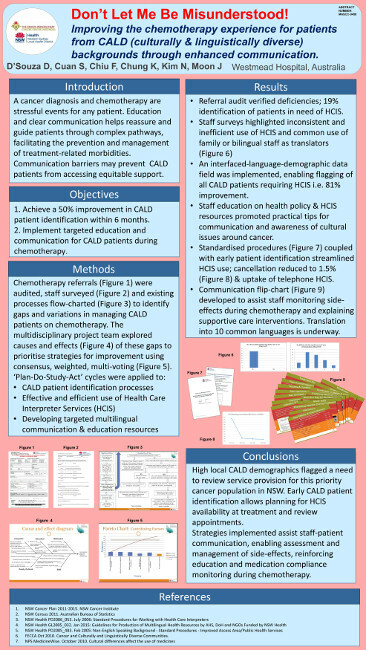 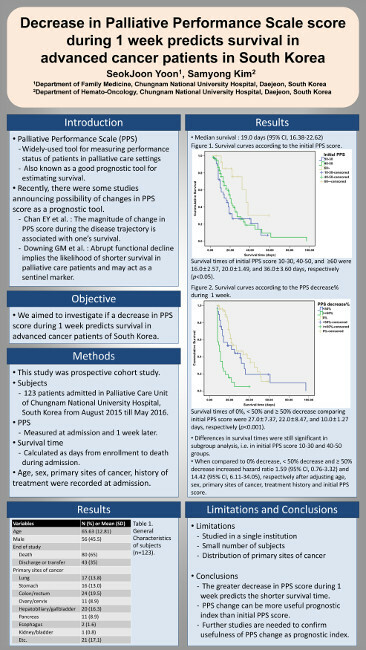 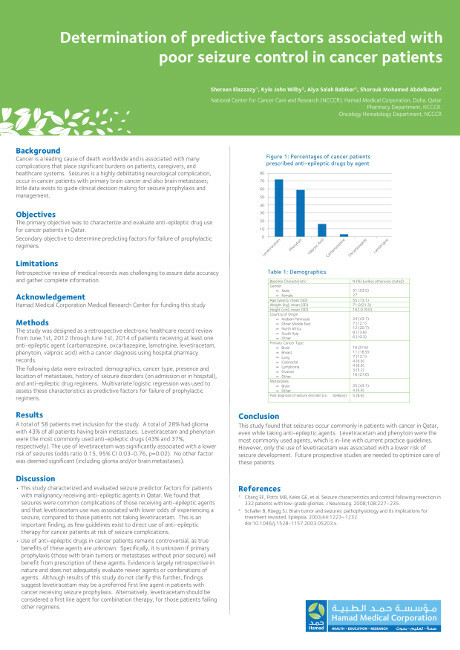 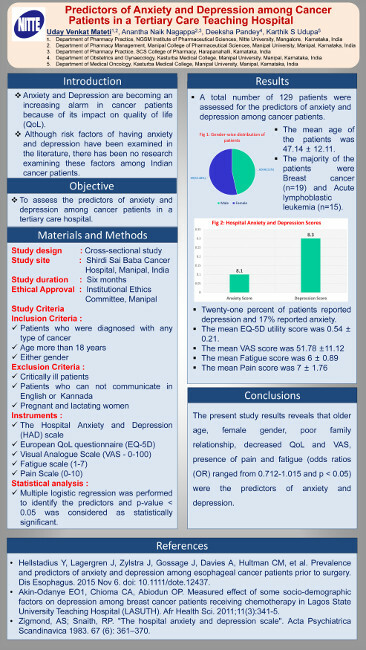 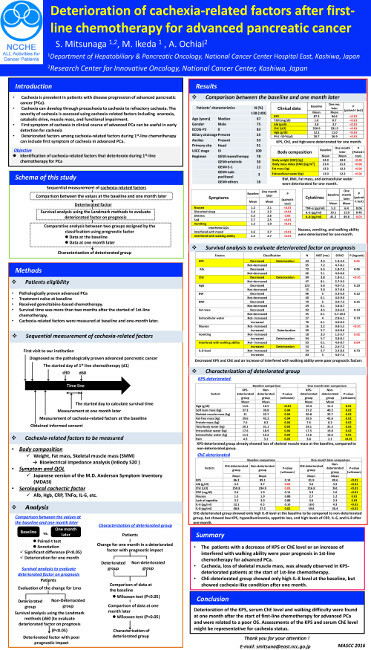 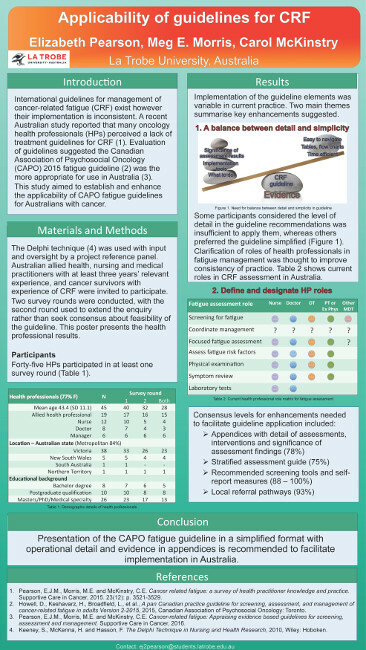 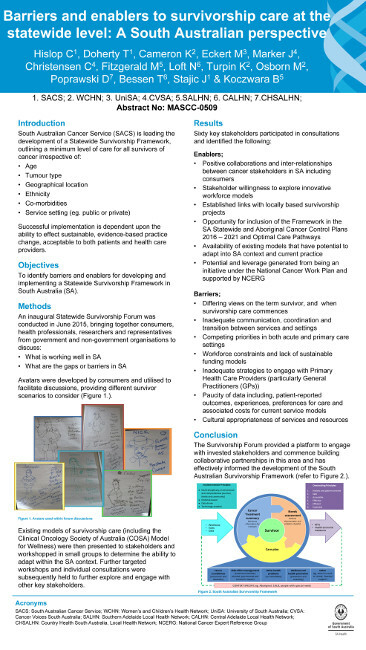 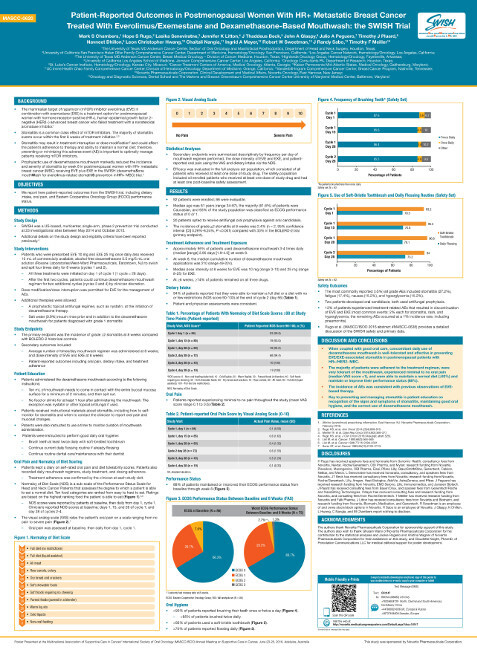 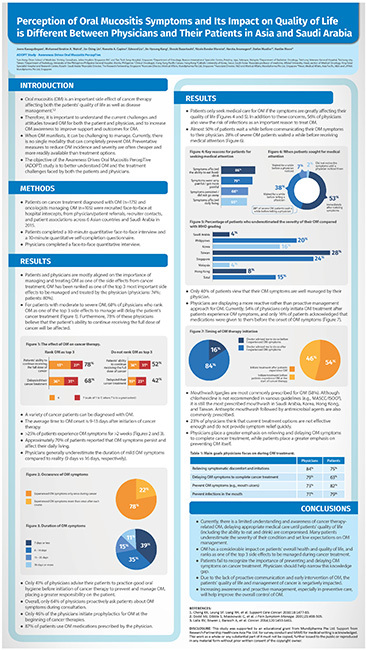 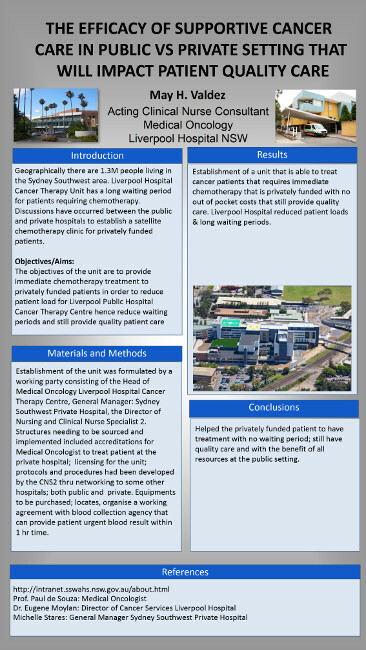 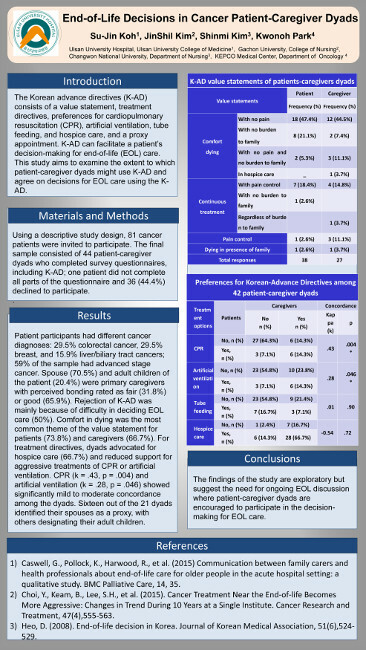 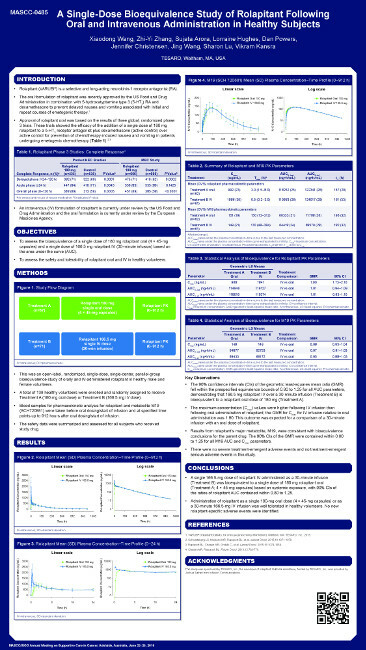 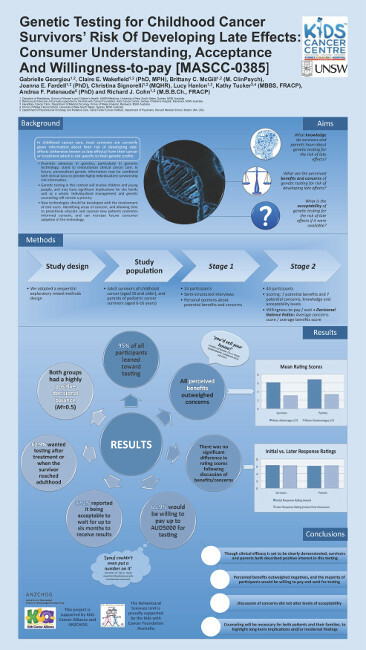 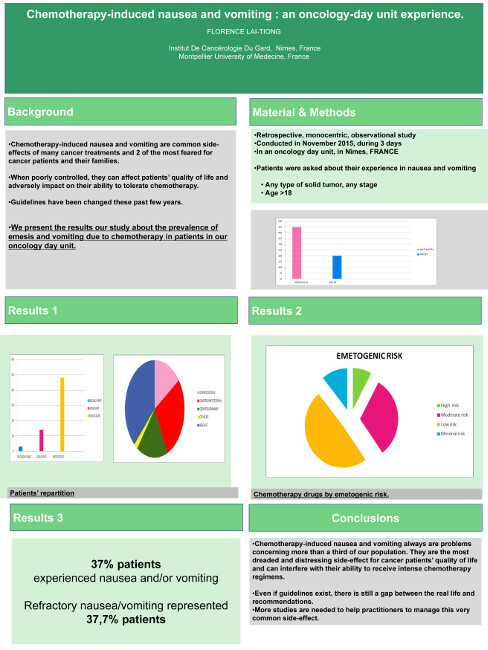 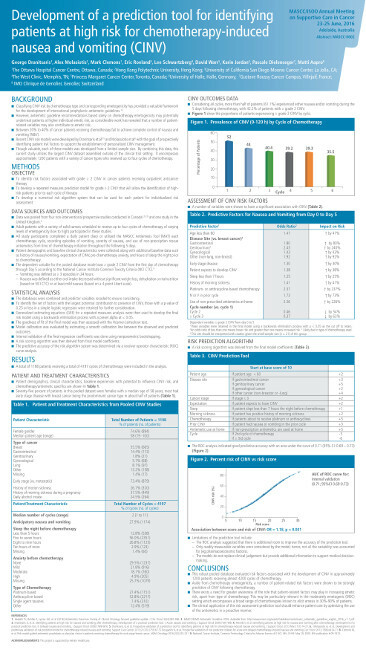 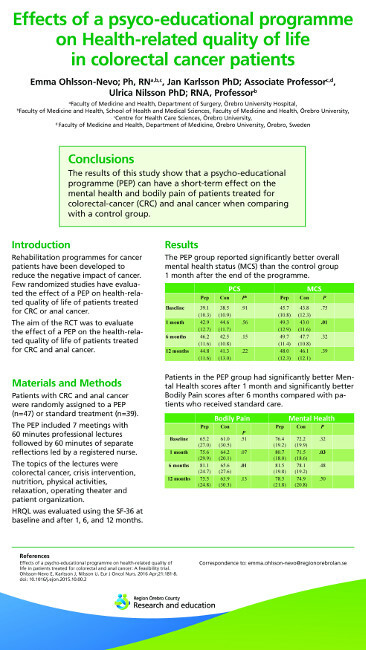 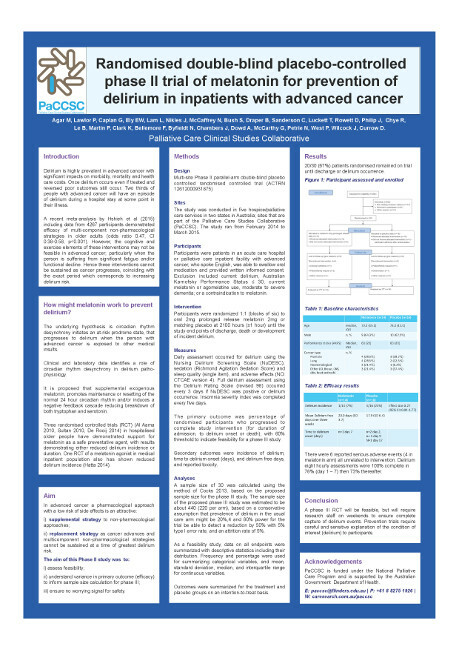 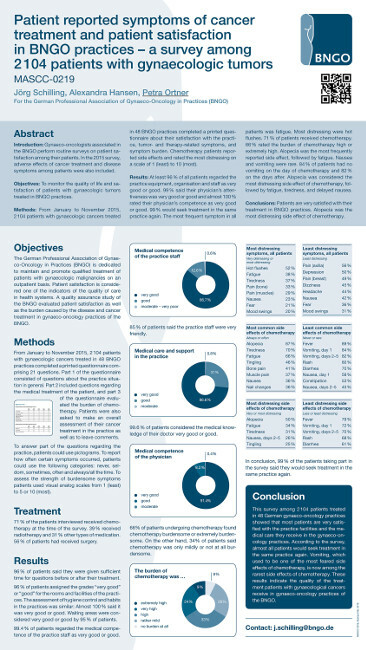 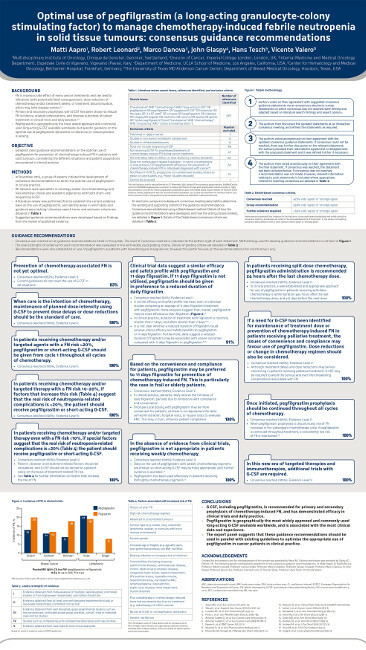 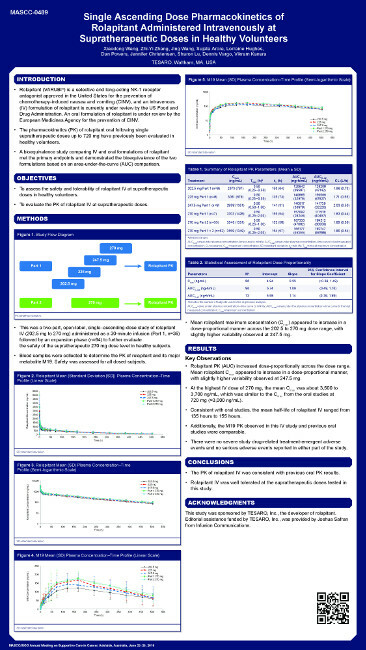 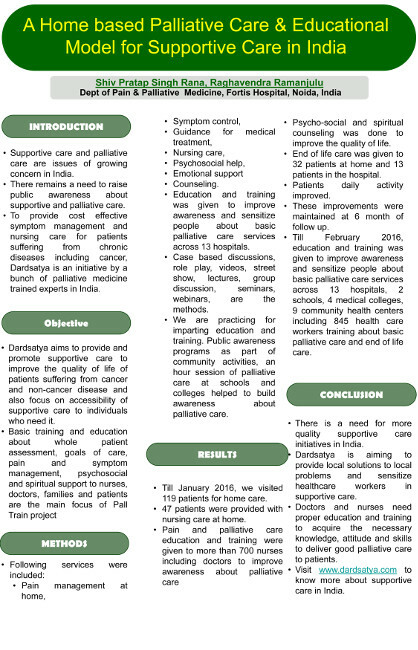 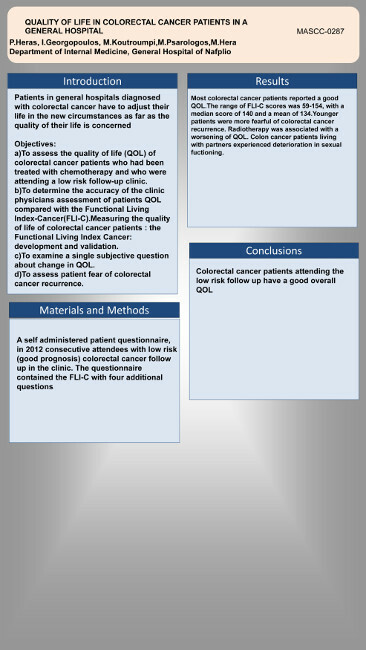 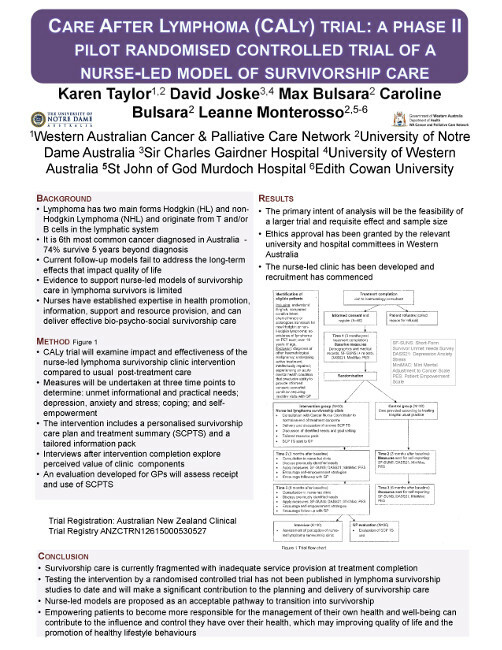 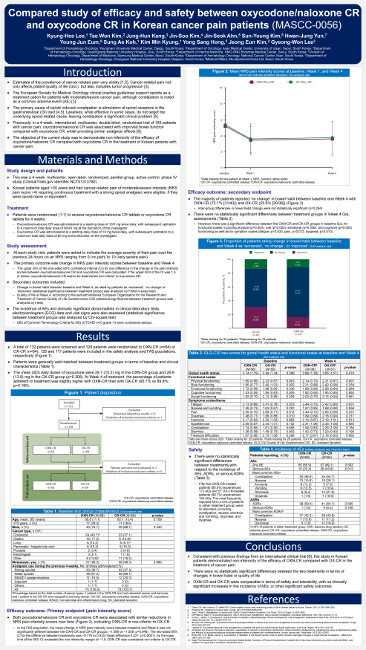 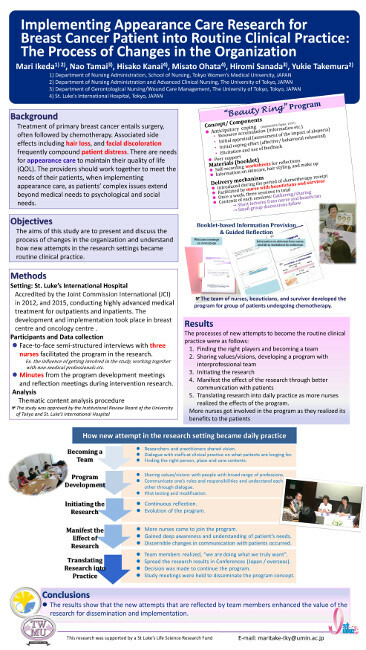 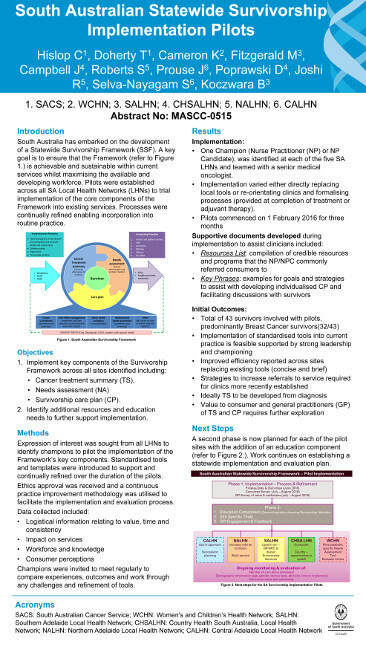 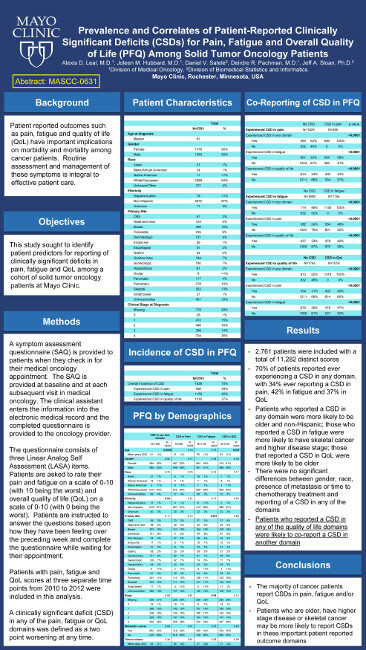 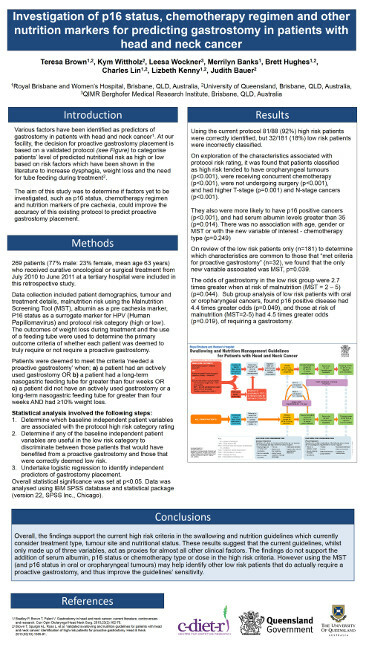 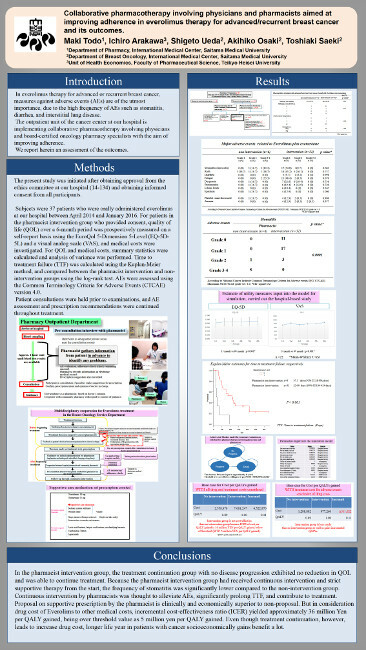 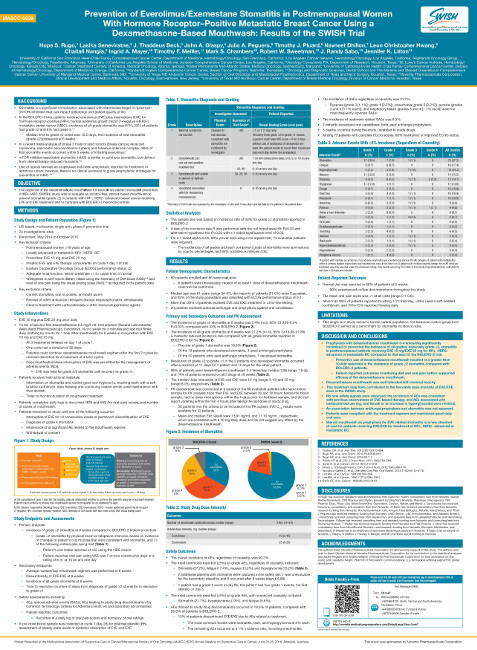 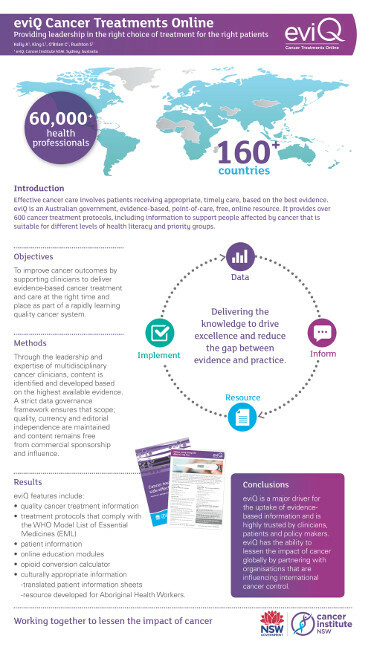 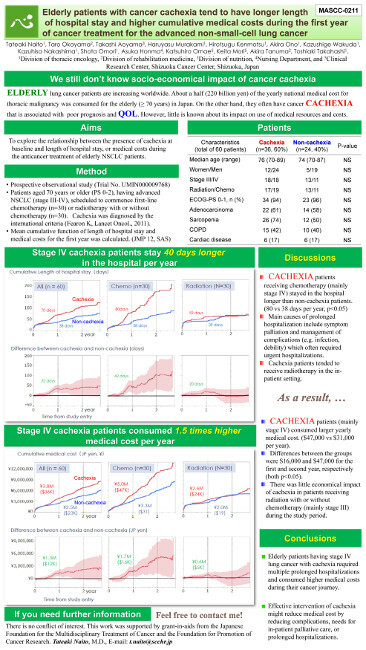 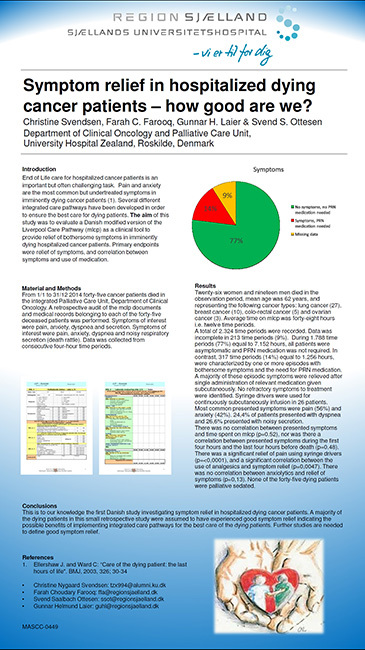 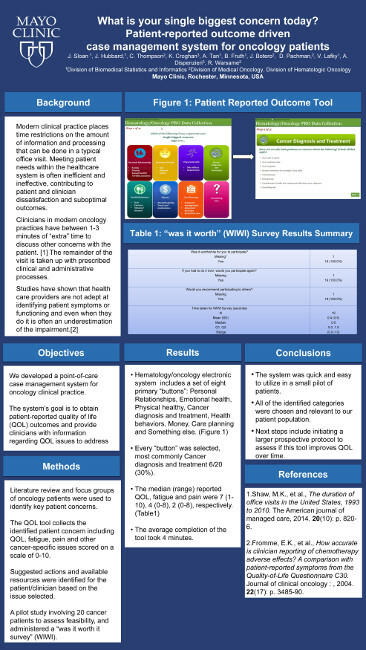 Development of a phase II pilot randomised controlled trial of a lymphoma nurse-led model of survivorship care: Care After Lymphoma (CALy) Trial. 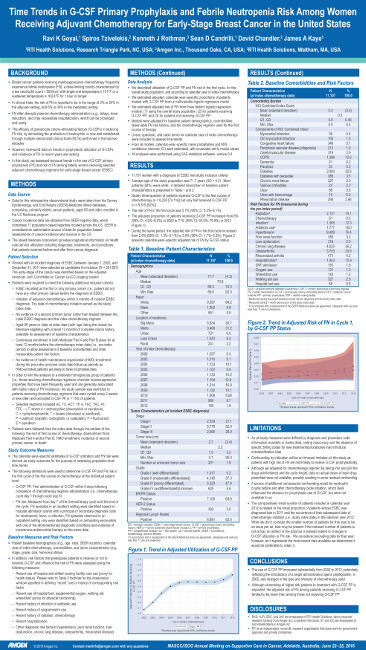 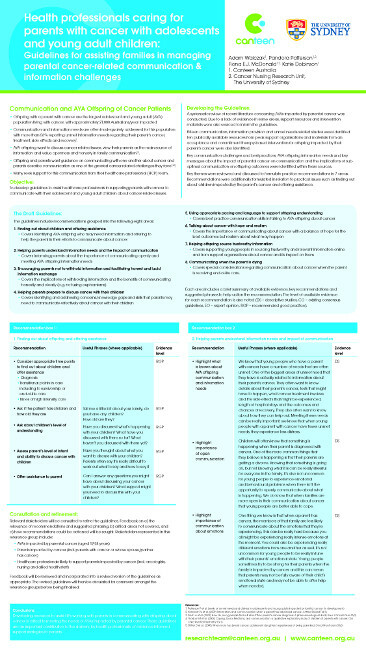 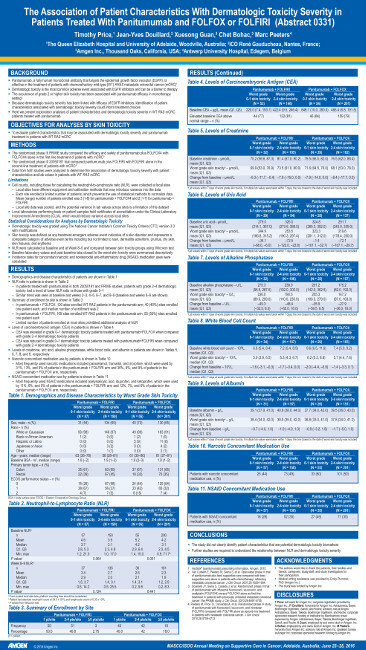 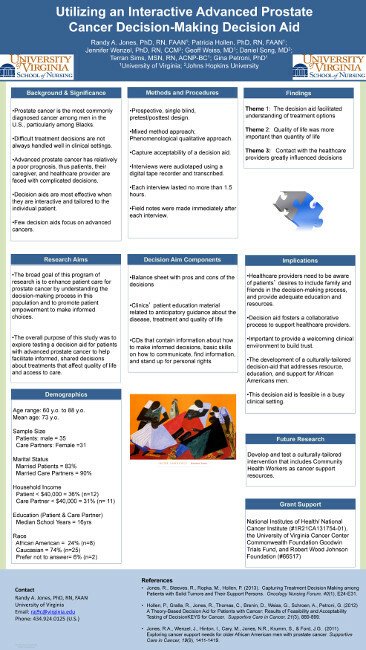 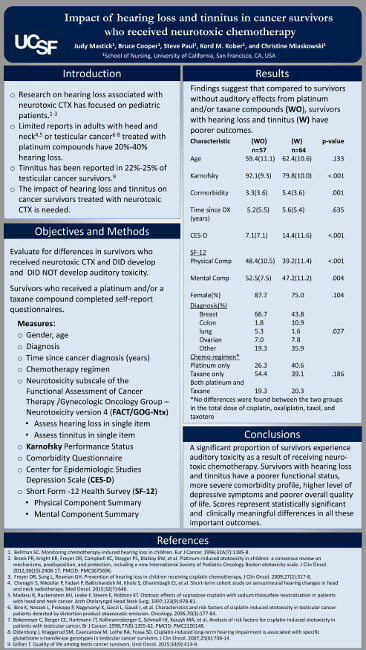 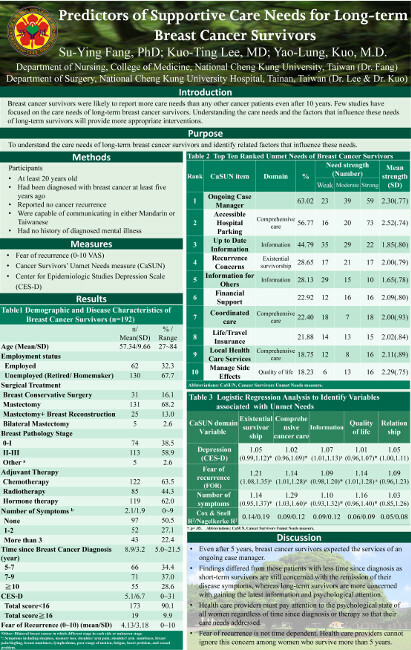 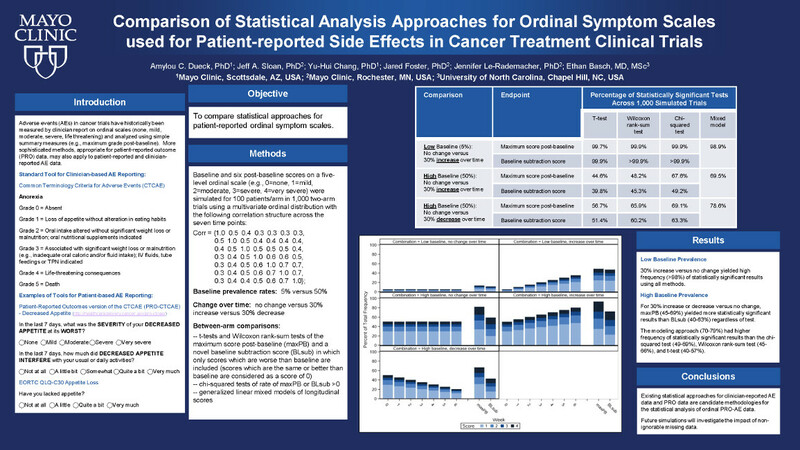 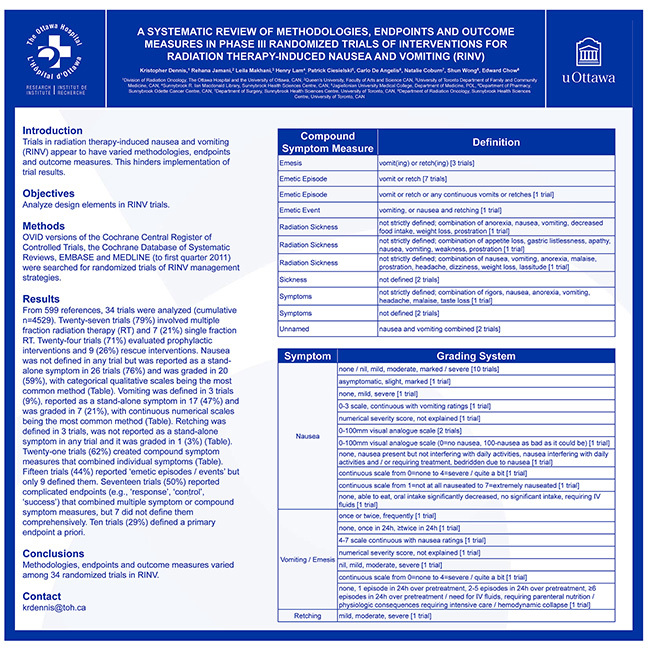 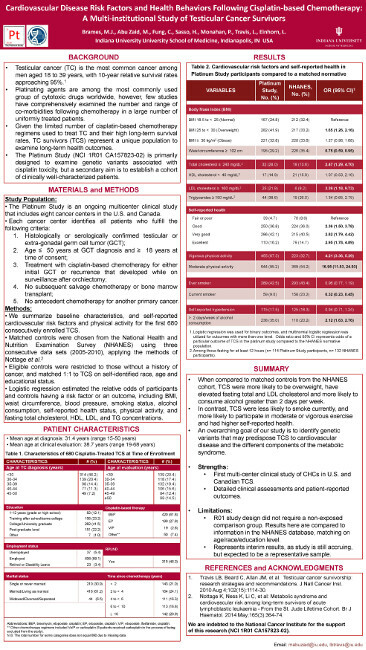 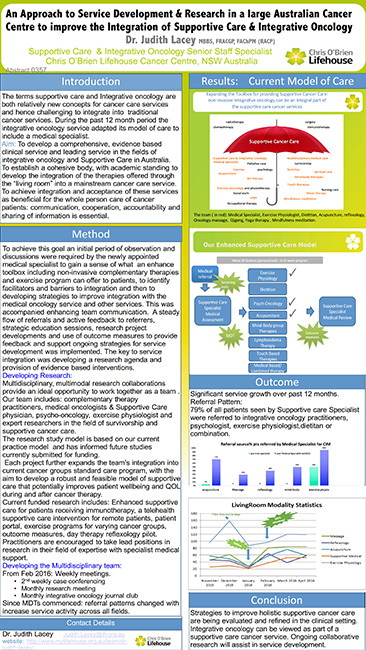 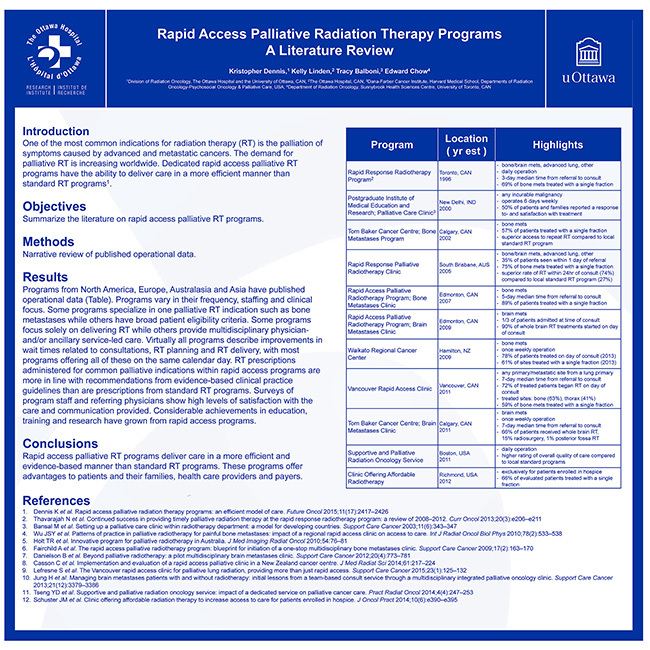 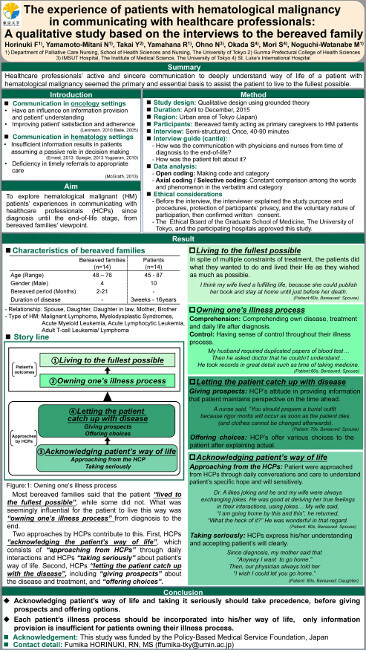 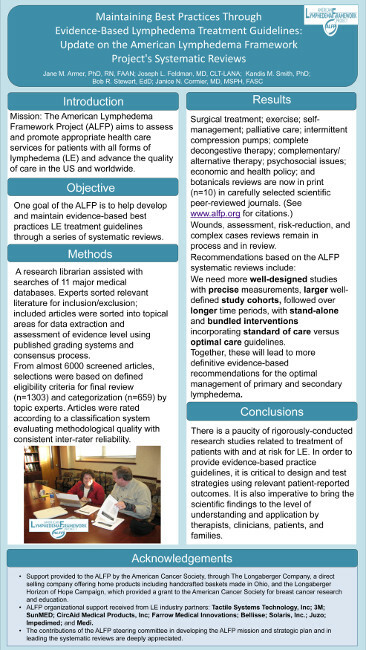 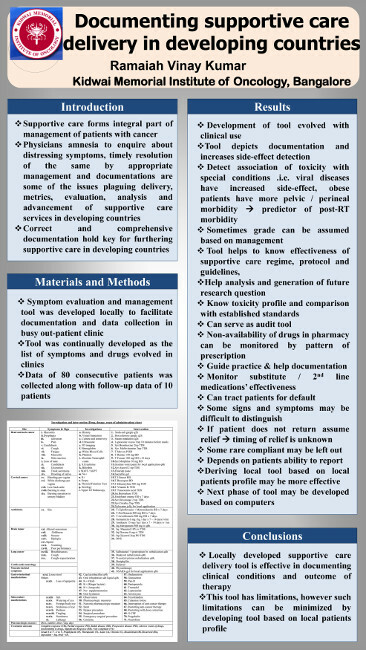 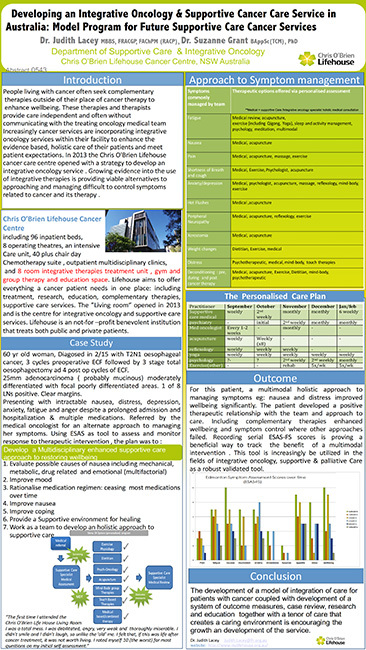 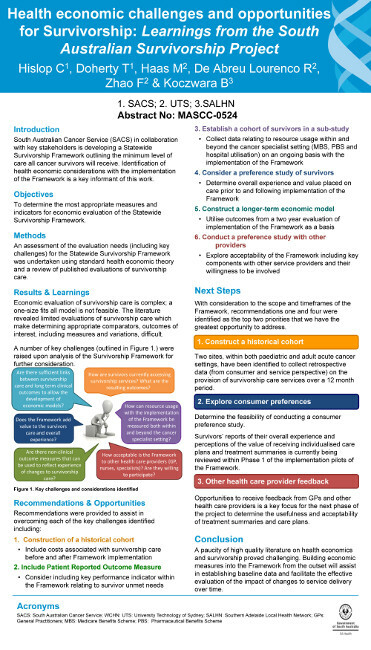 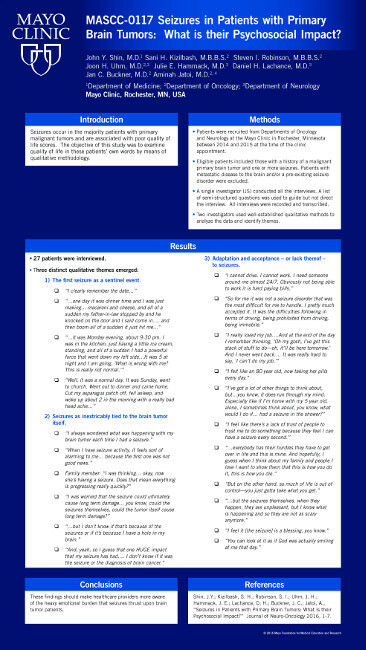 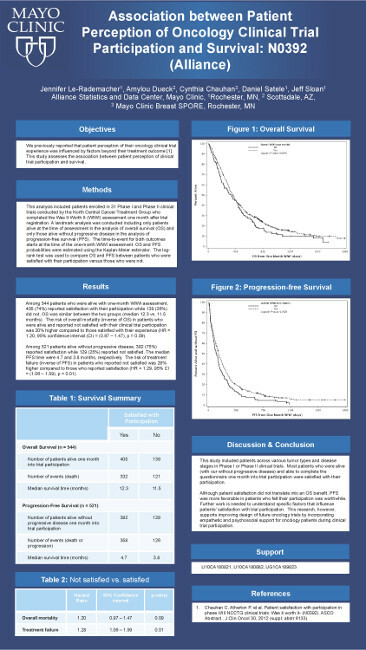 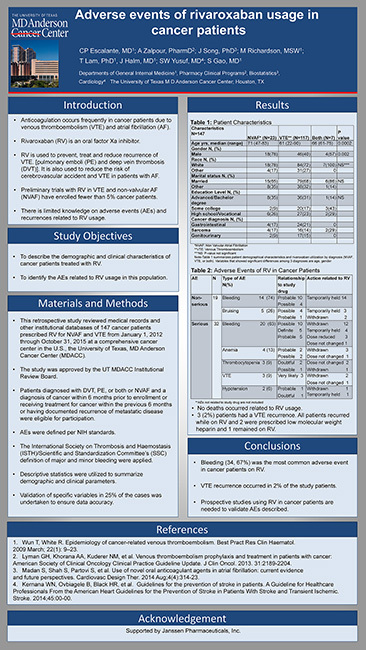 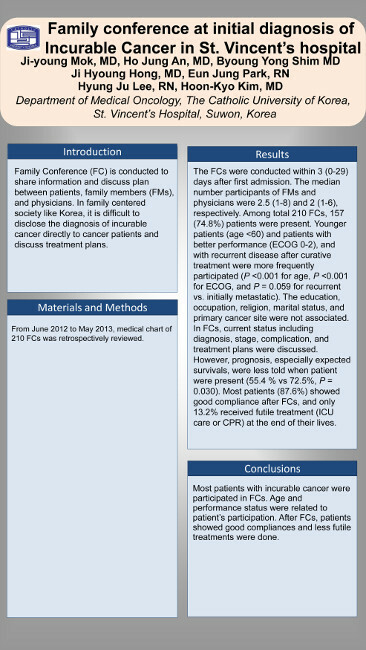 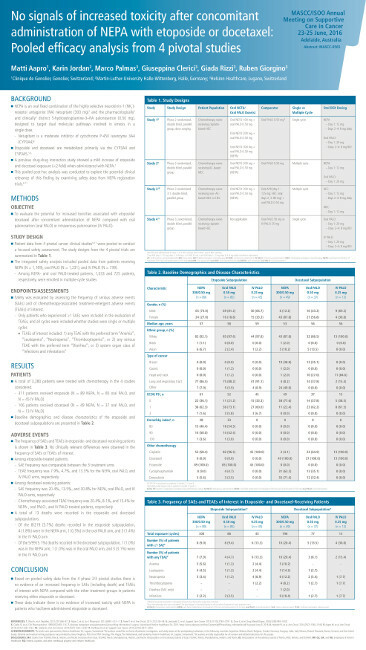 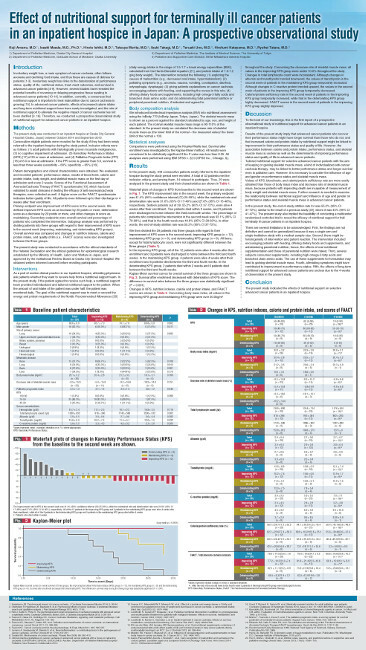 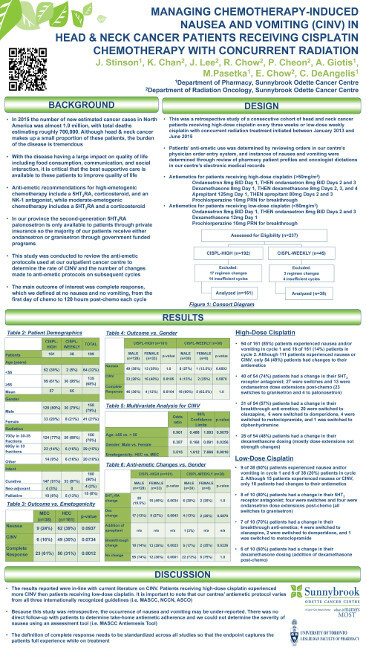 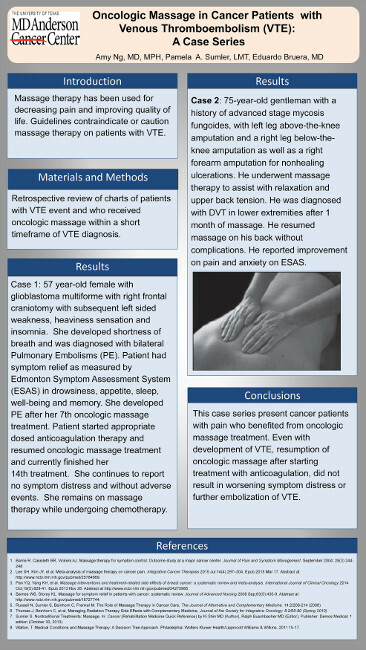 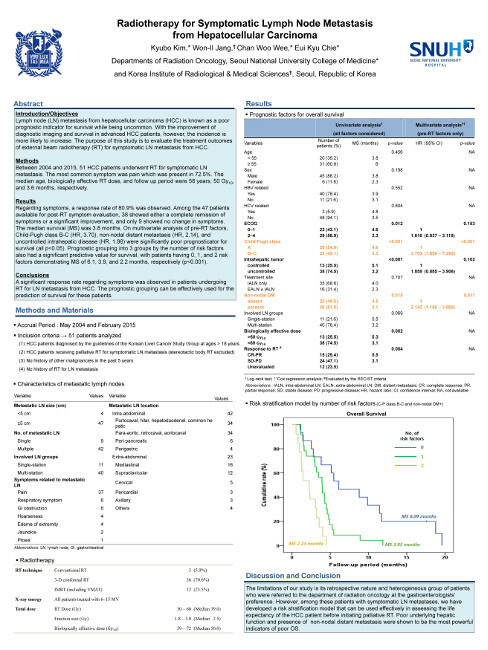 Development of a Survivorship Care Plan and Treatment Summary for Lymphoma Survivors. 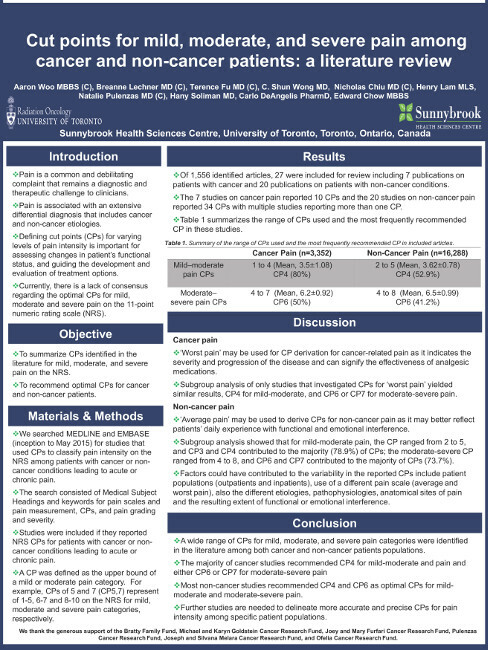 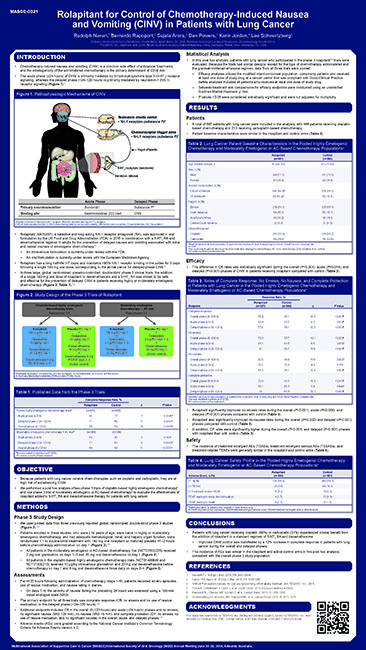 IS OBESITY AN INDEPENDENT RISK FACTOR FOR OXALIPLATIN-INDUCED PERIPHERAL NEUROPATHY IN PATIENTS WITH COLORECTAL CANCER? 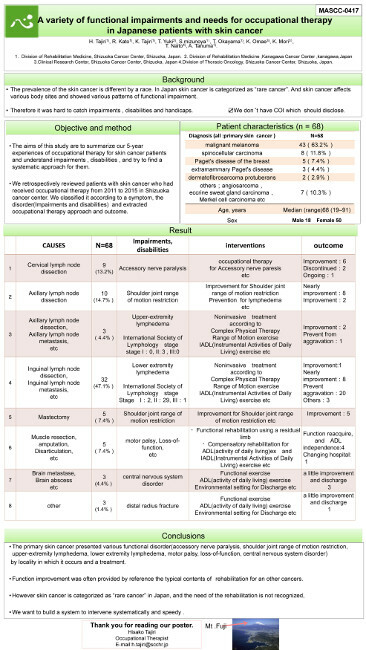 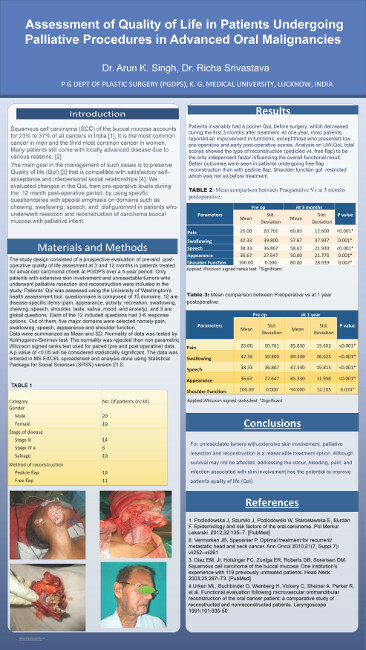 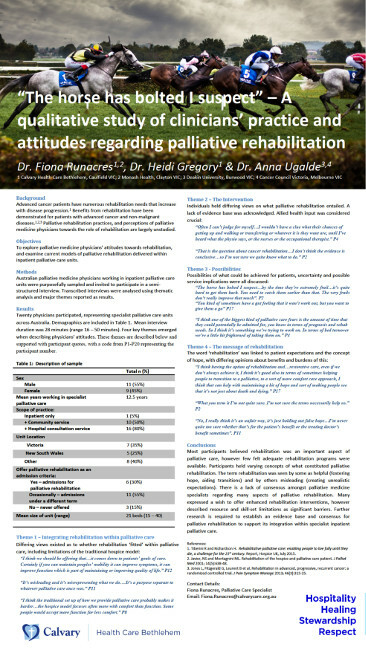 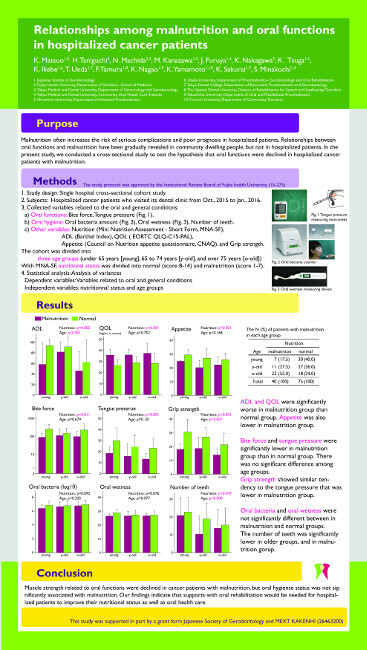 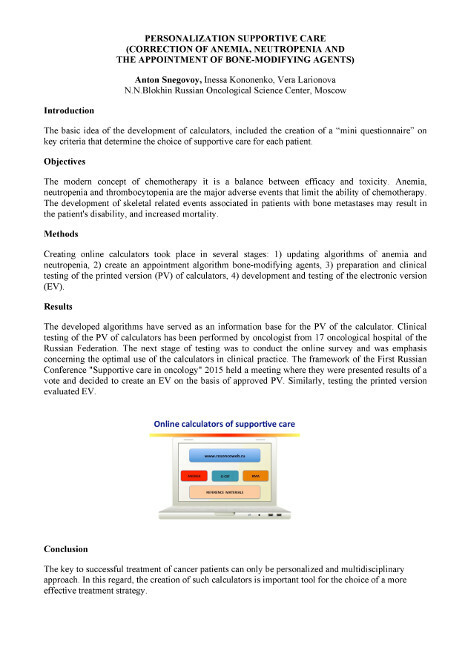 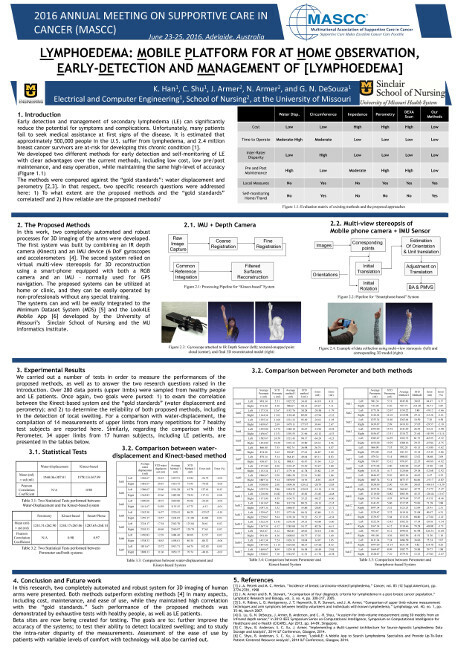 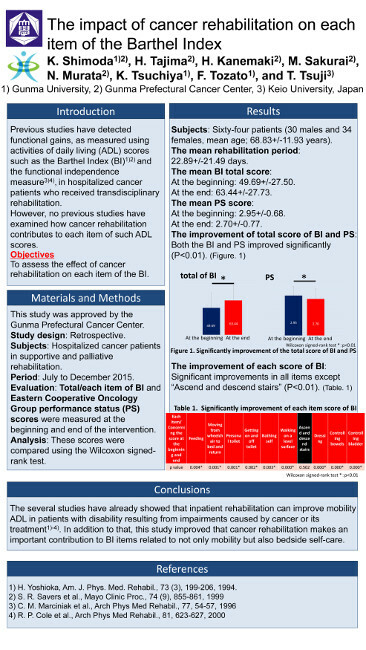 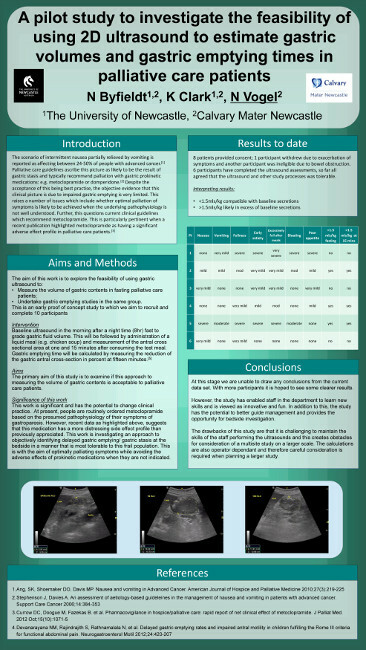 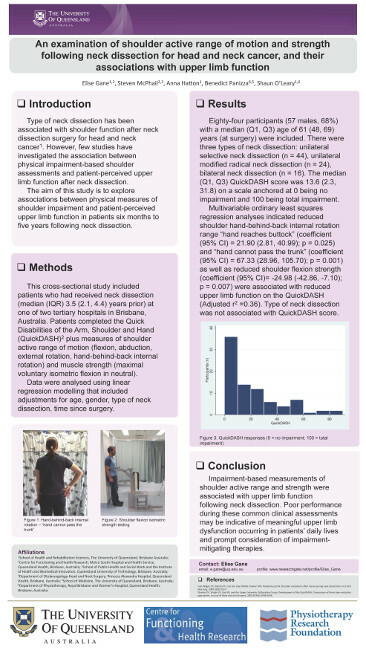 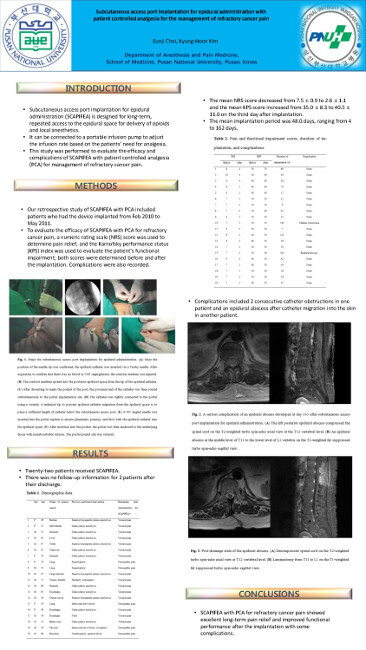 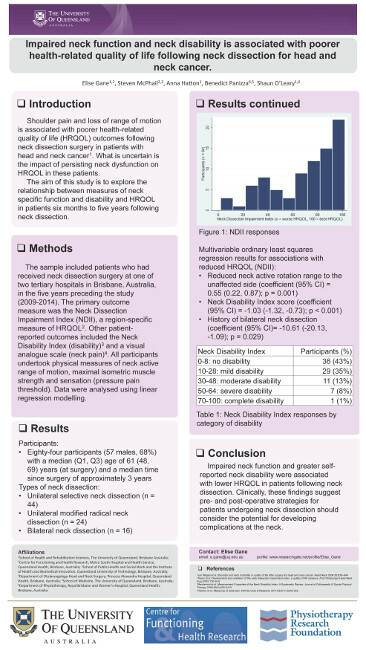 Evaluation of function in various stages of prosthetic rehabilitation with obturator following maxillectomy. 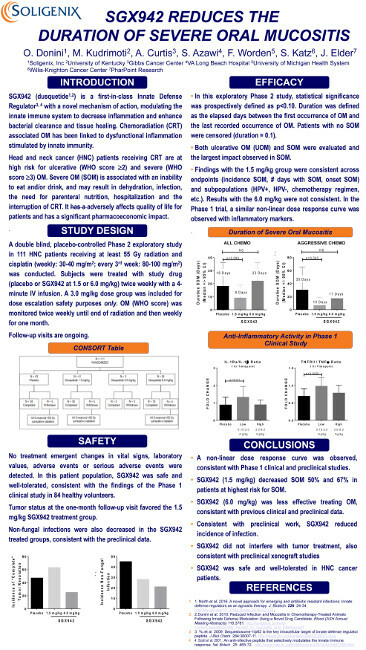 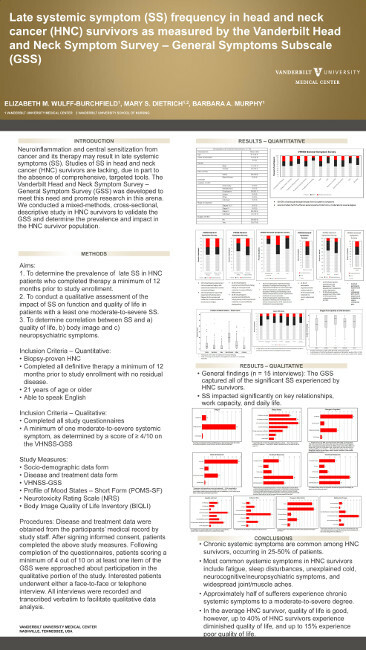 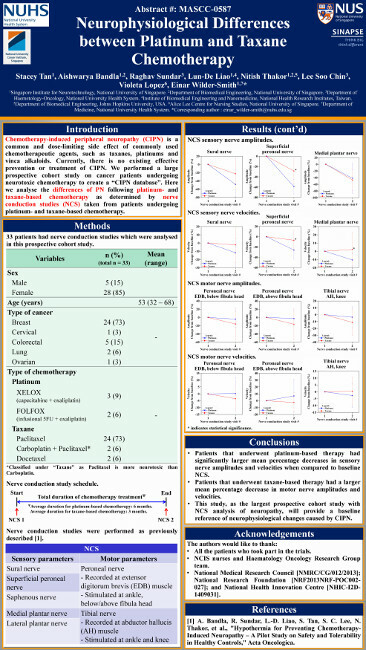 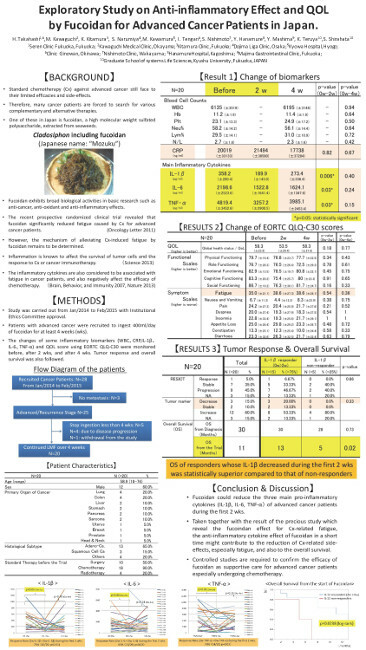 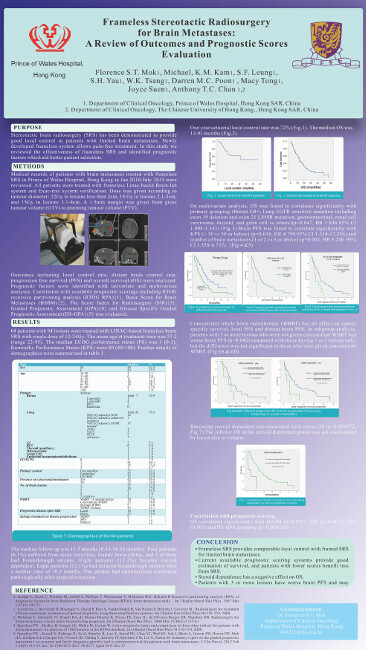 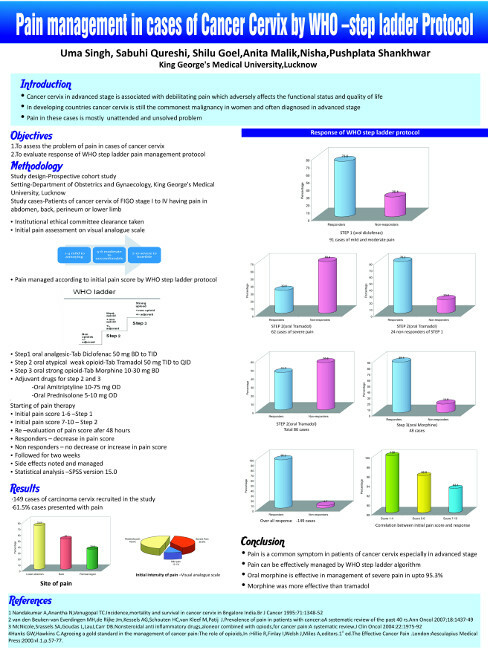 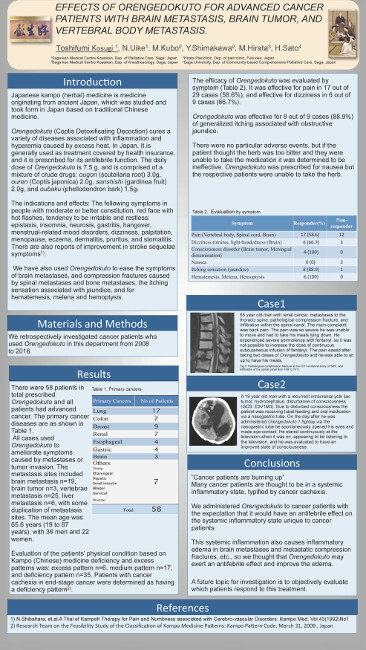 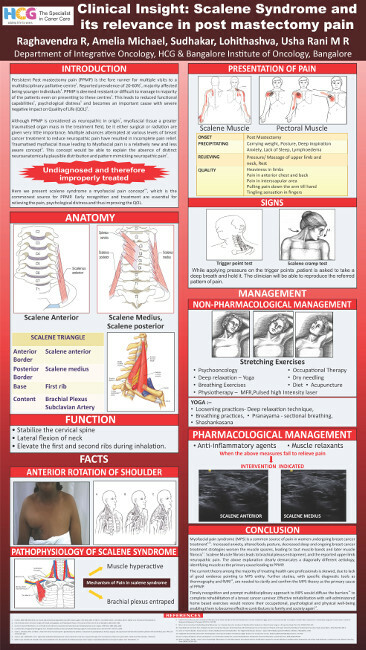 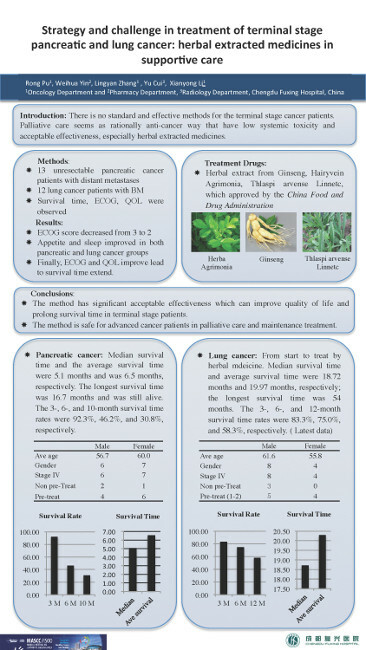 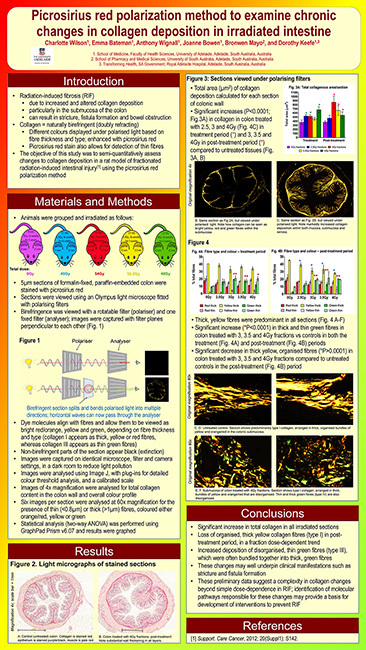 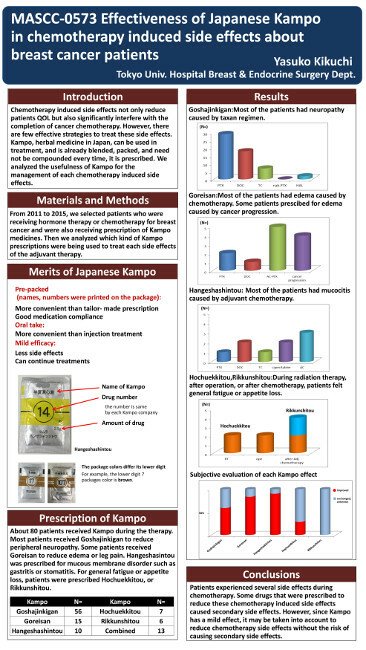 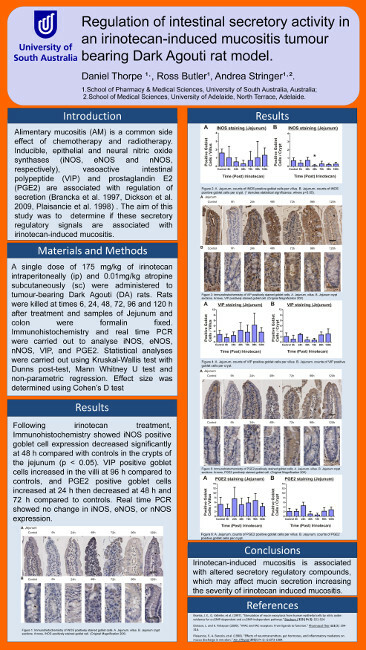 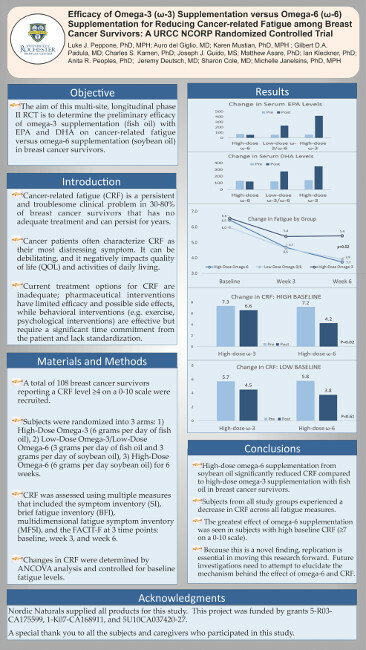 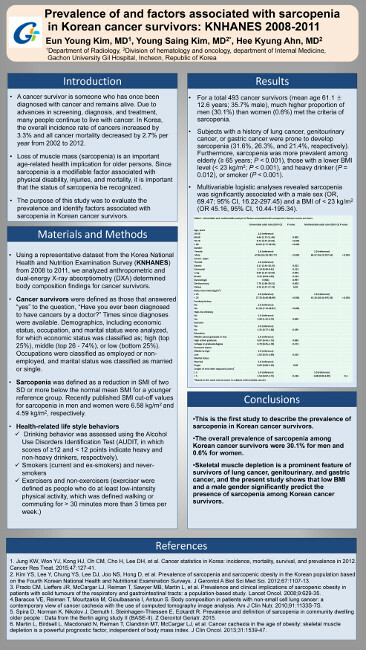 Effects of orengedokuto for advanced cancer patients with brain metastasis, brain tumor, and vertebral body metastasis. 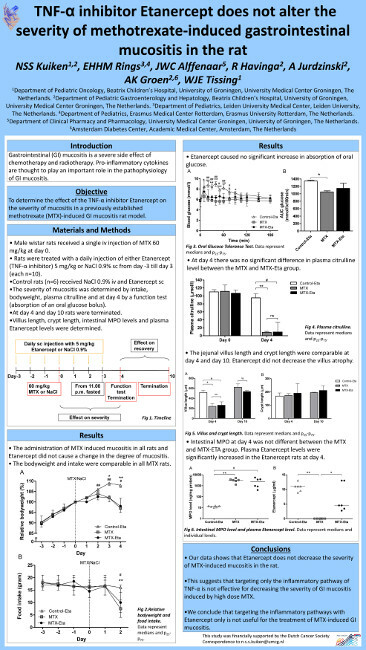 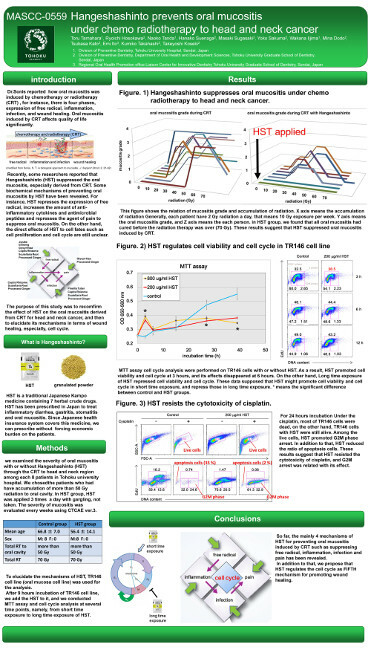 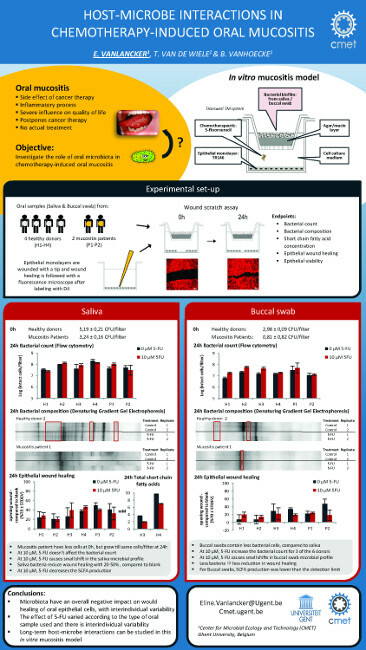 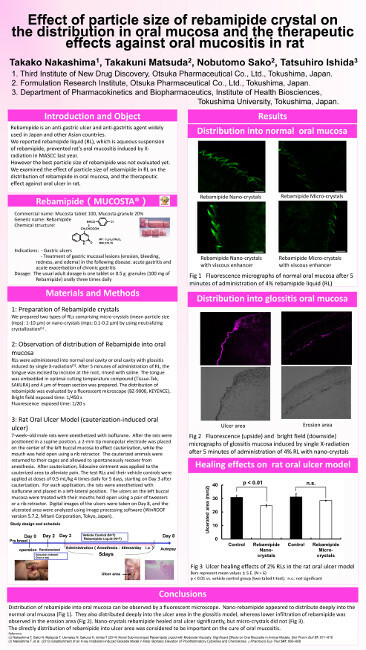 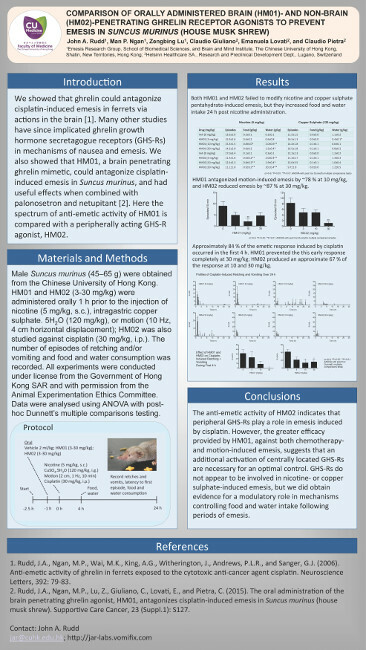 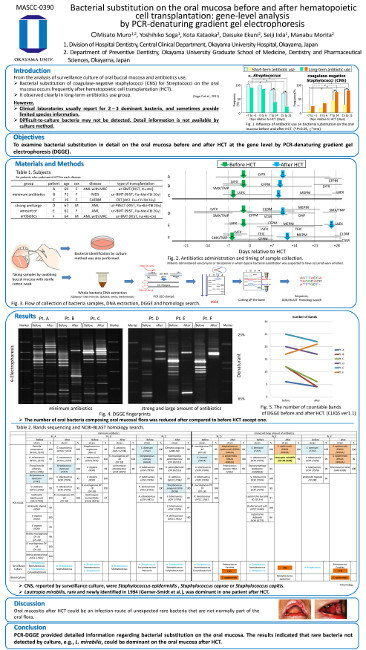 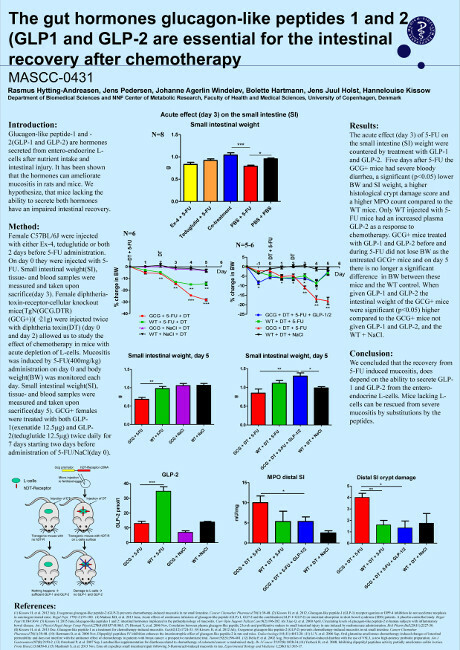 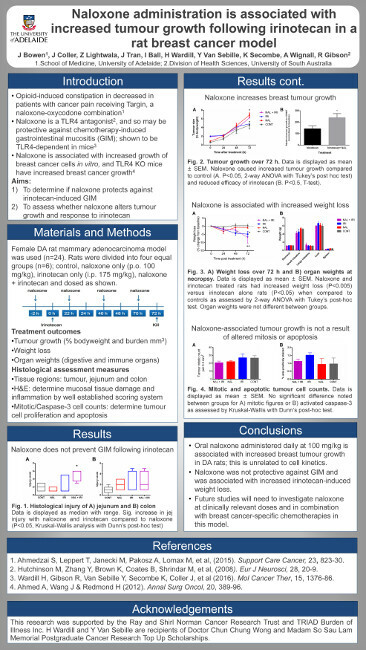 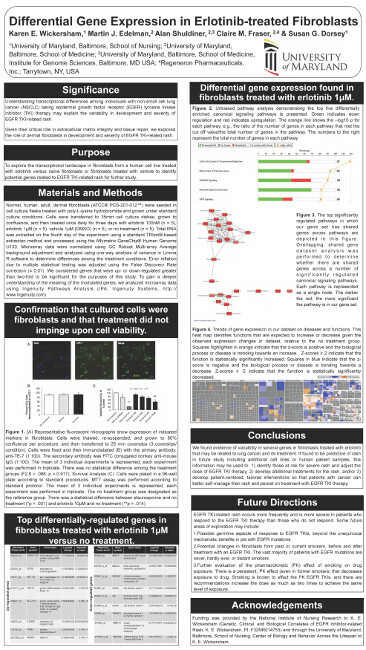 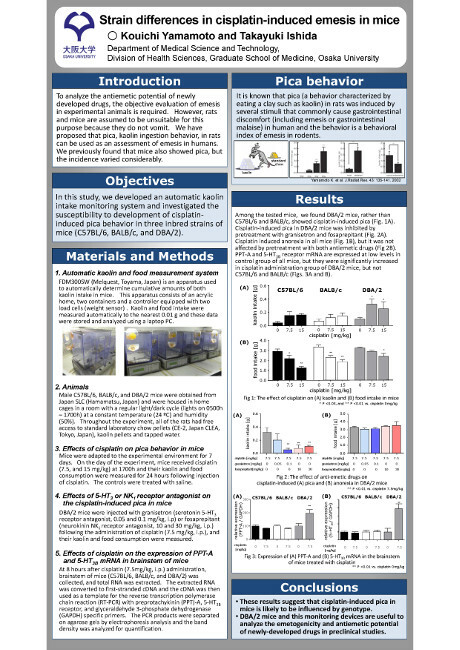 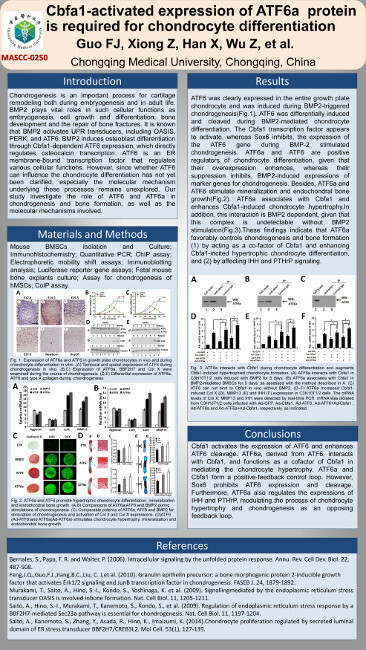 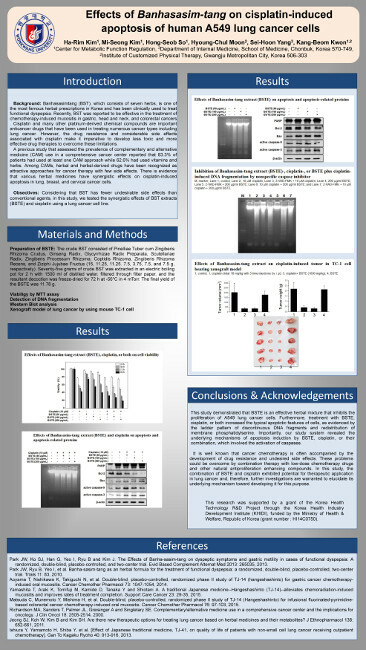 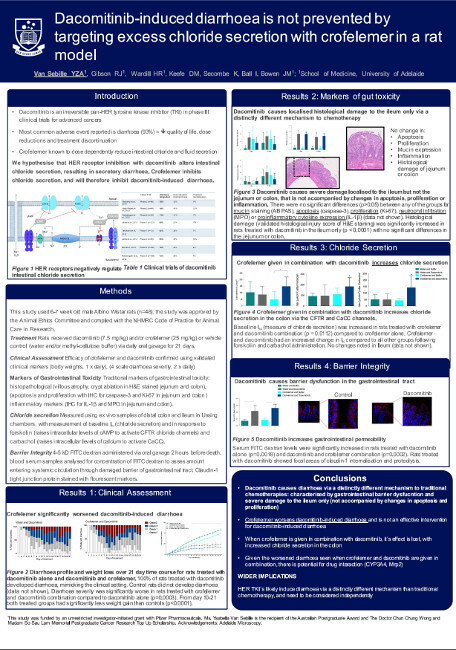 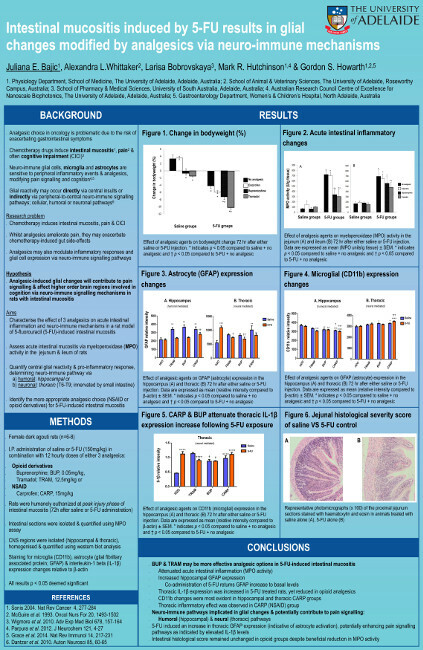 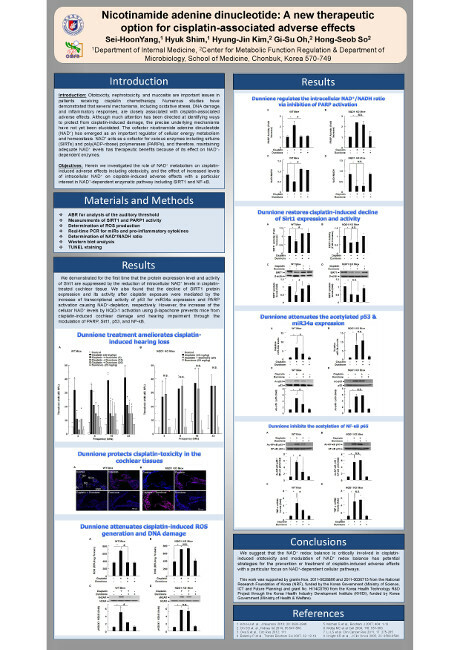 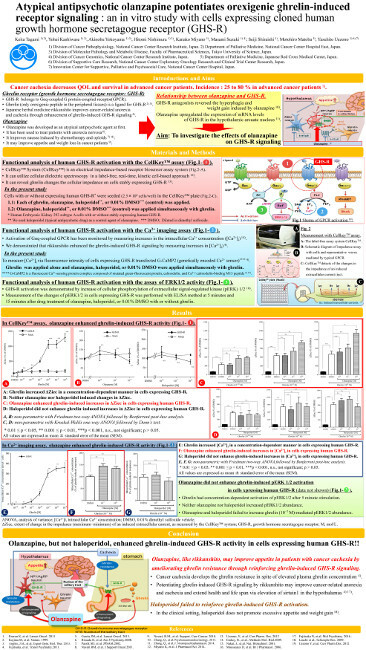 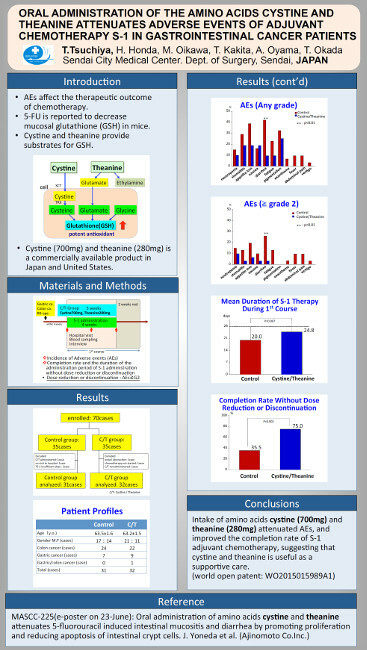 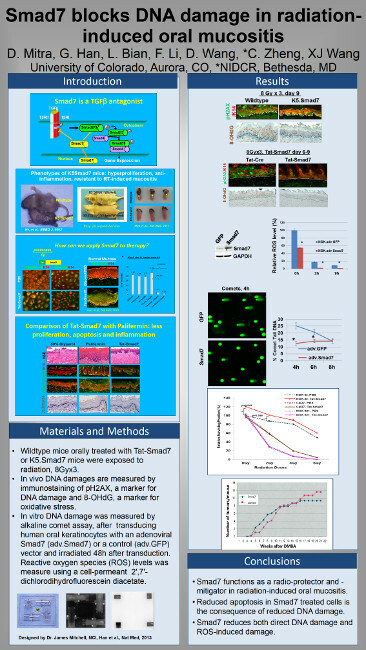 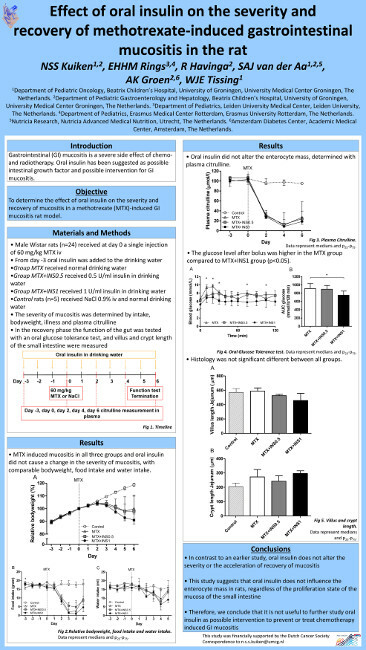 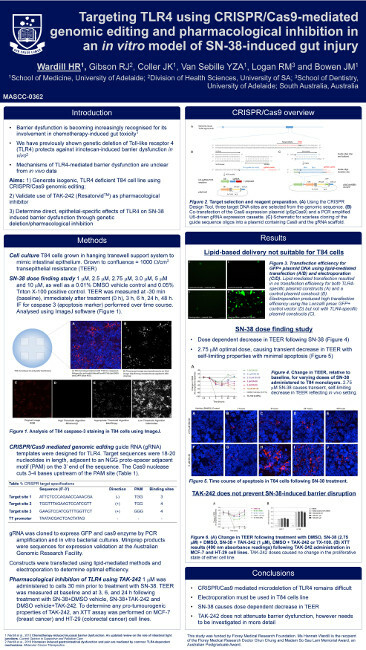 typical antipsychotic olanzapine potentiates orexigenic ghrelin-induced receptor signaling: an in vitro study with cells expressing cloned human growth hormone secretagogue receptor. 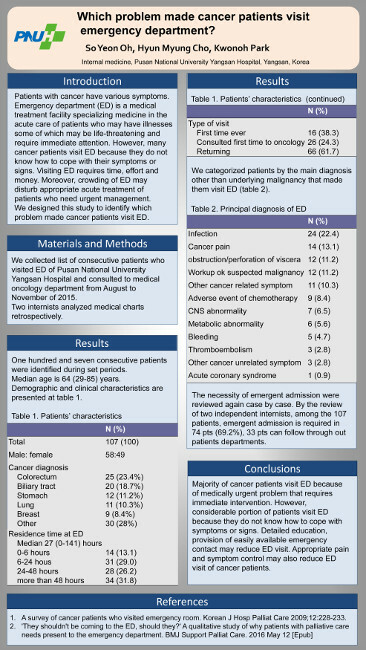 Which problem made cancer patients visit emergency department? 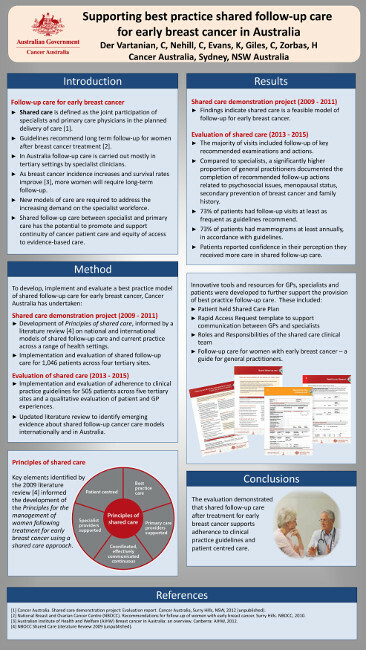 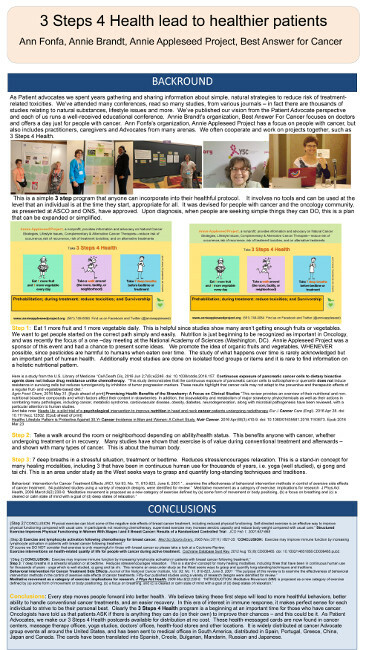 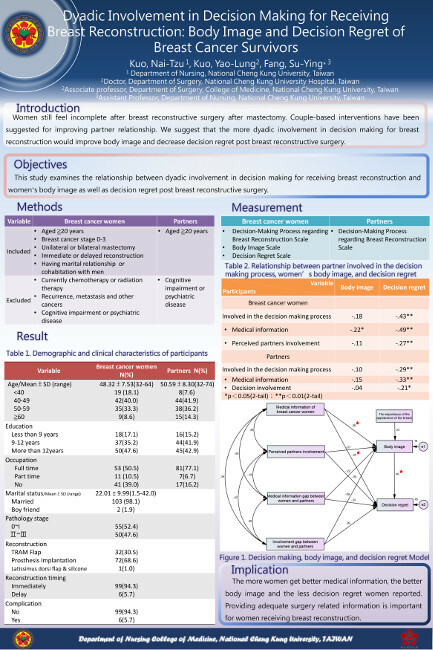 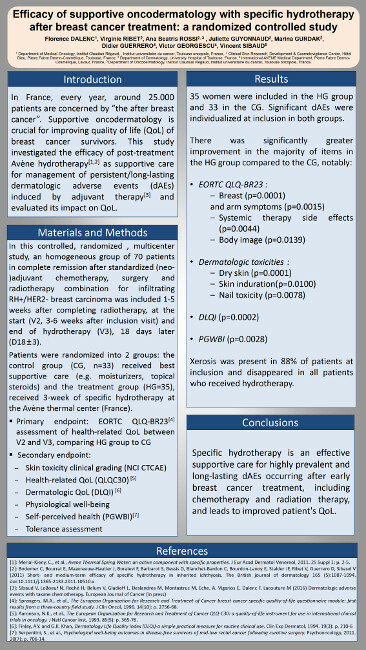 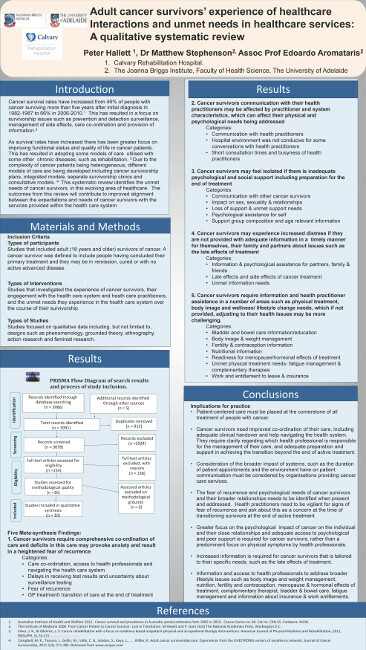 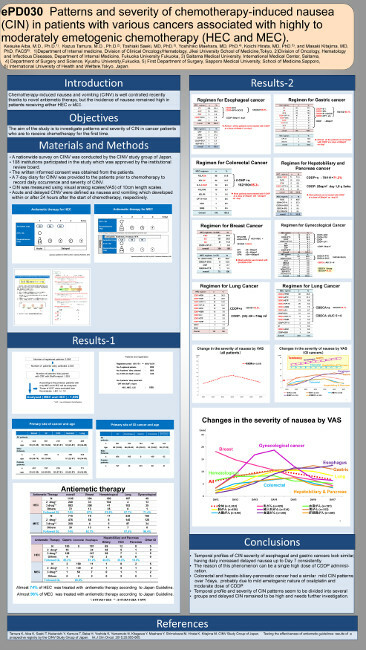 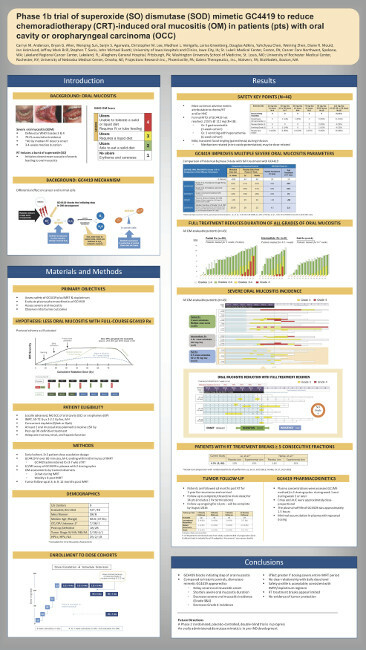 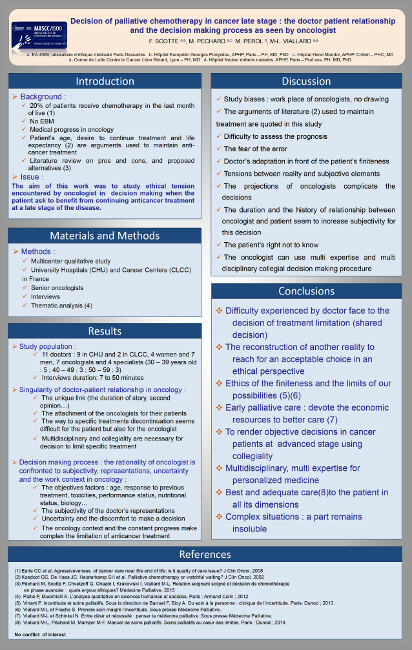 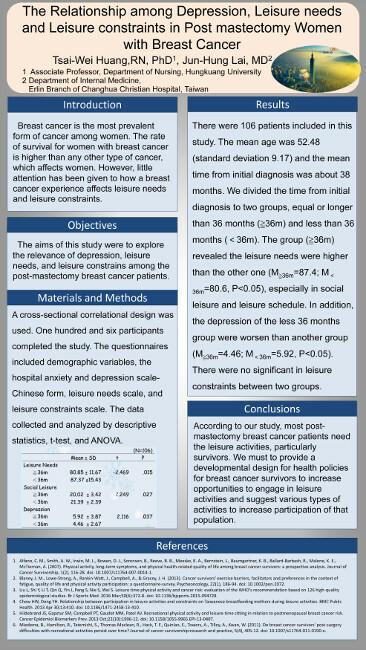 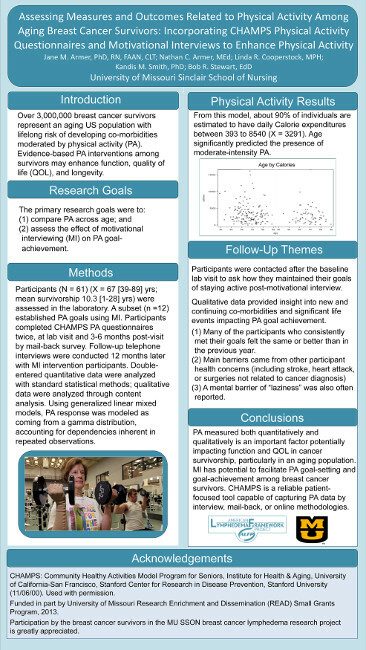 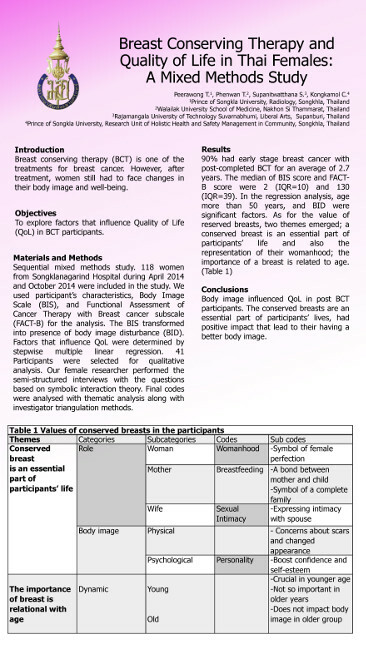 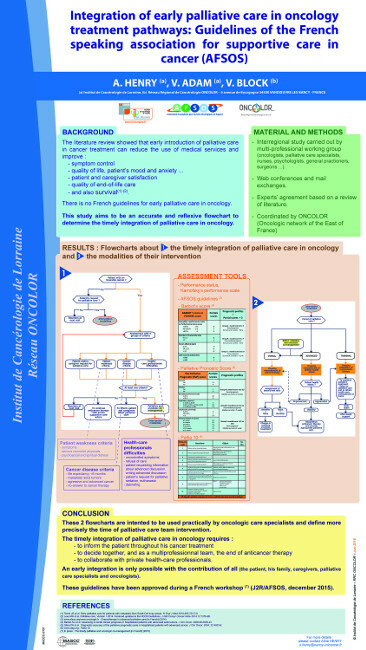 Implementing appearance care research for breast cancer patients into routine clinical practice: The process of changes in the organization. 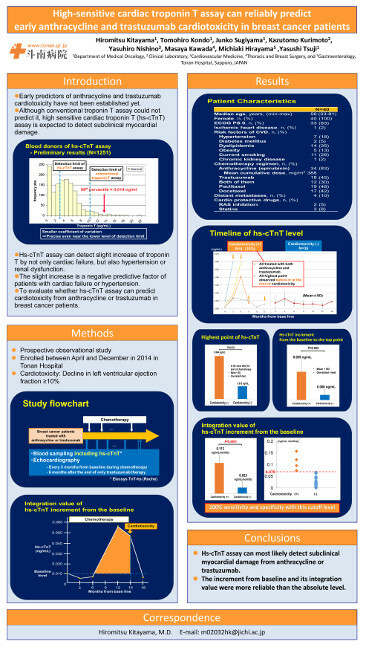 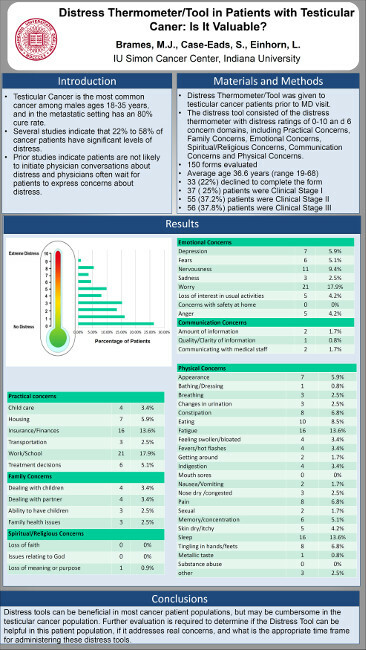 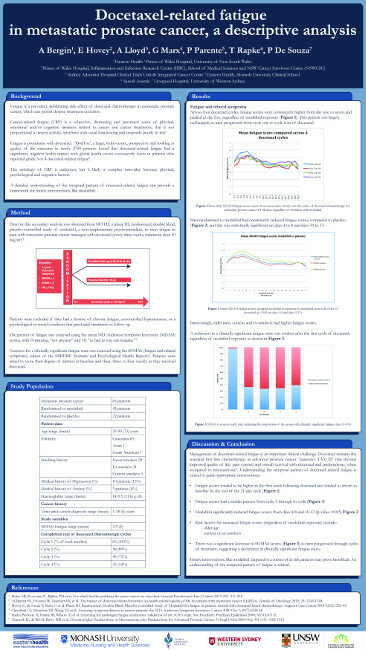 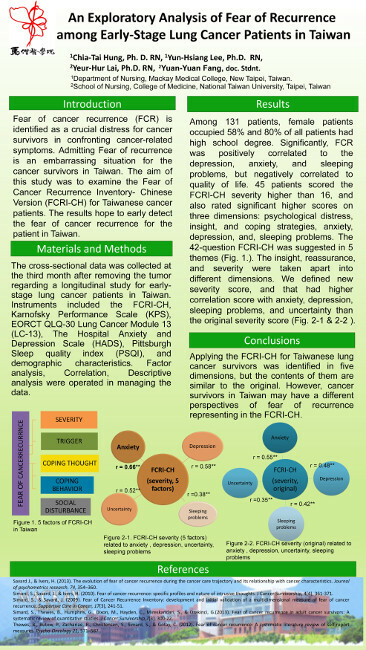 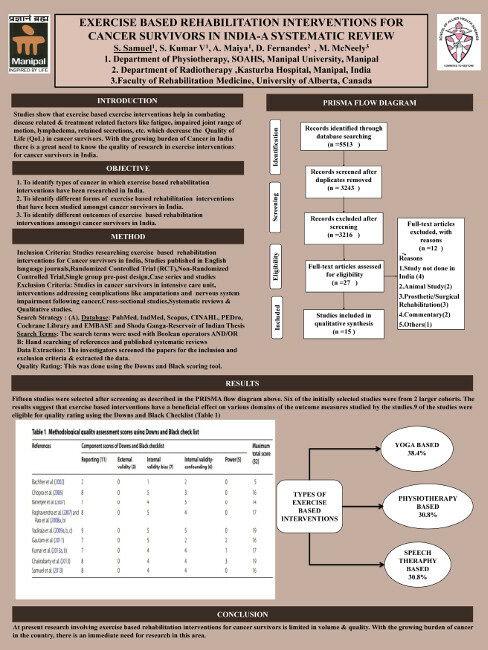 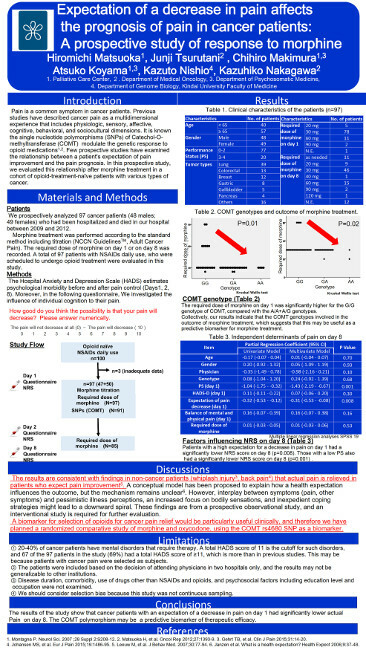 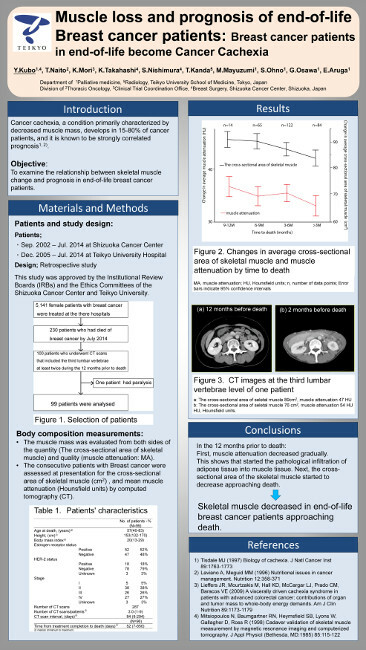 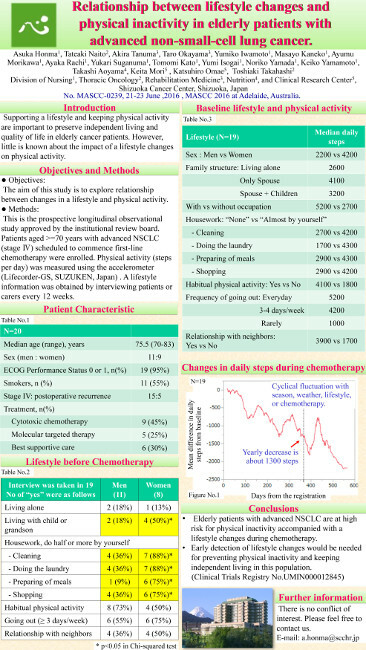 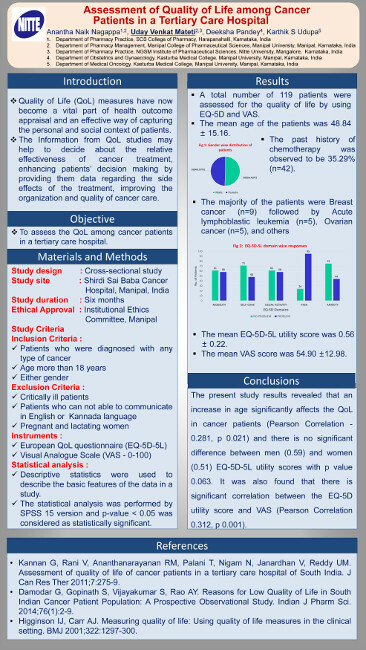 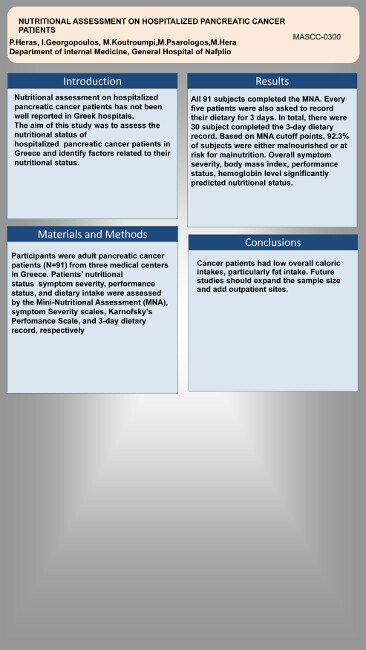 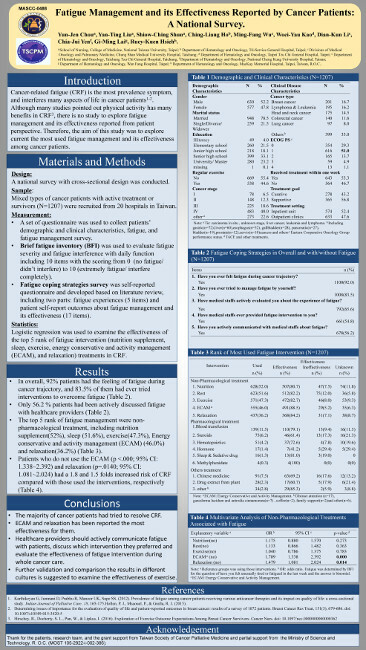 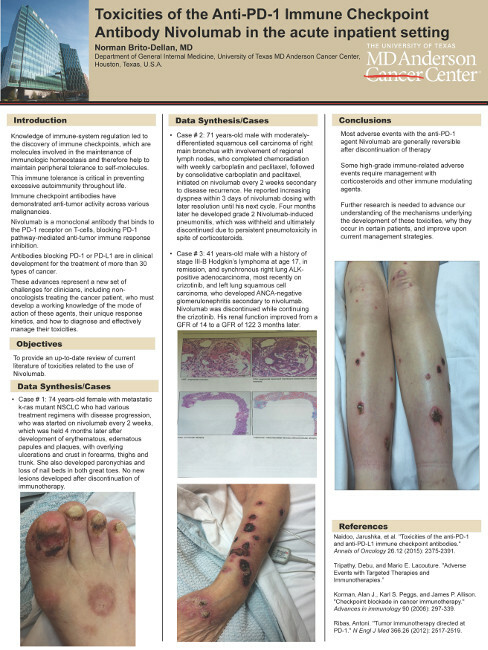 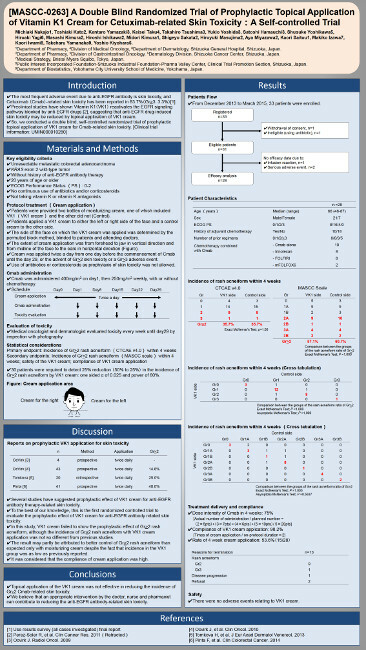 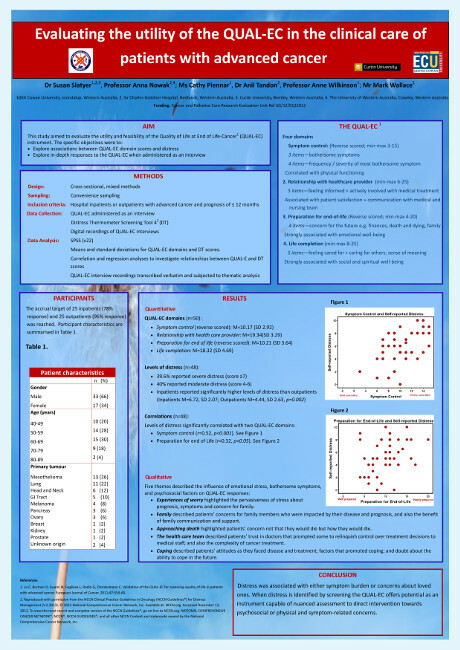 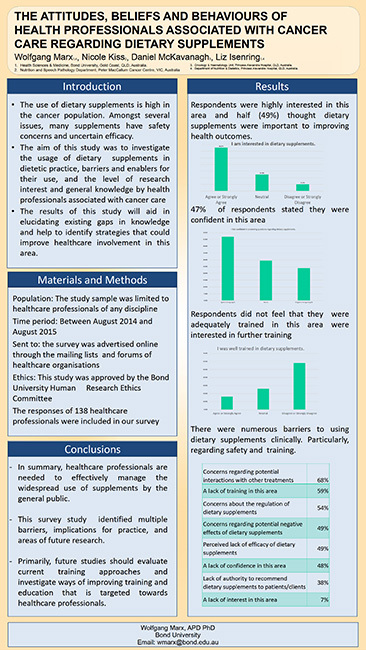 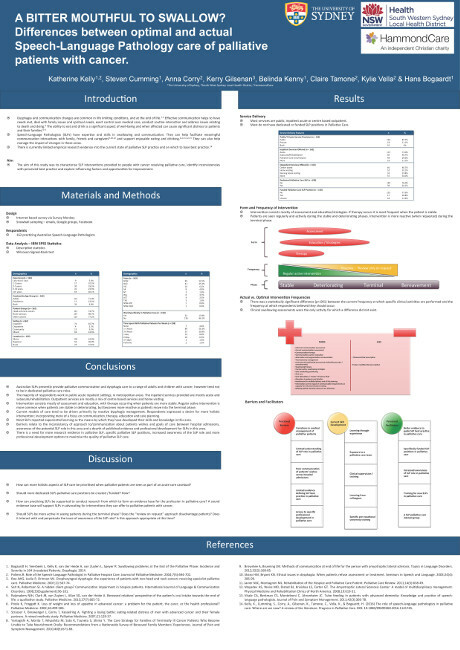 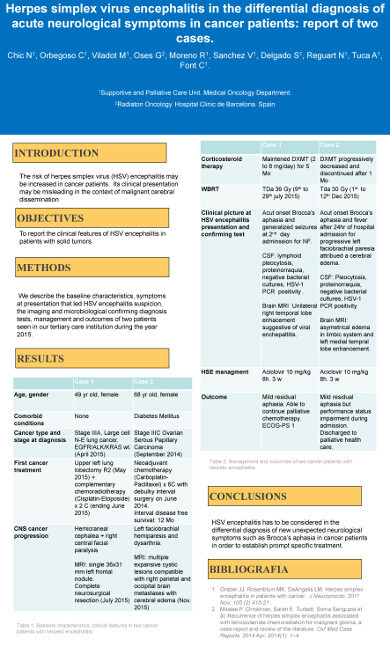 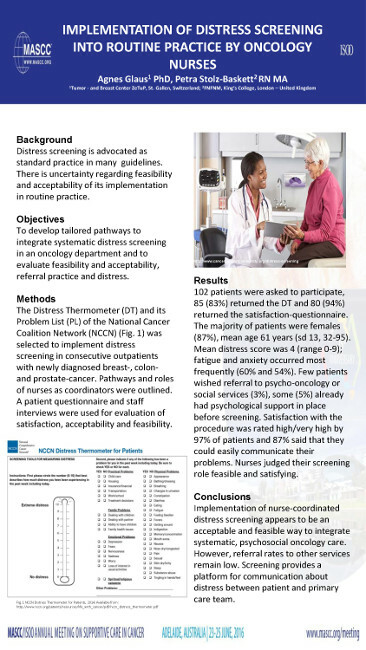 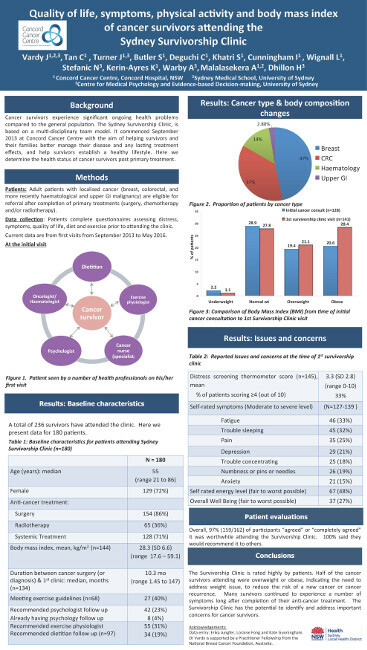 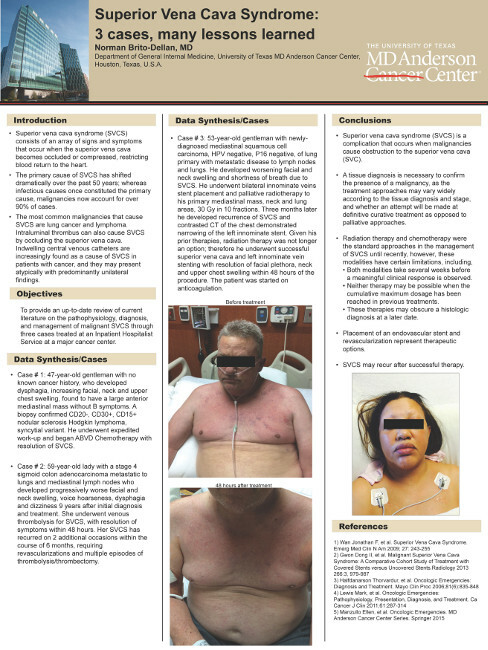 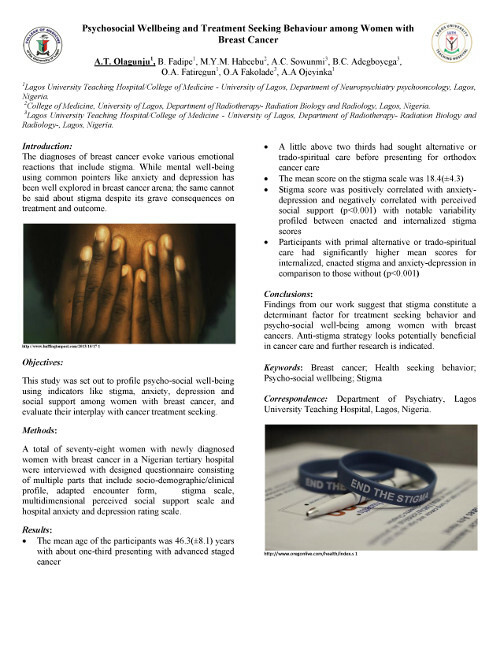 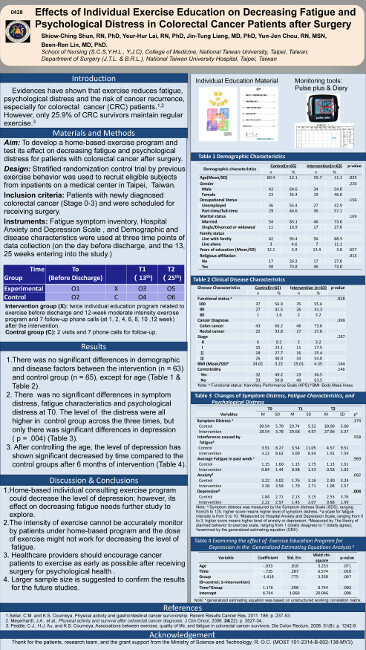 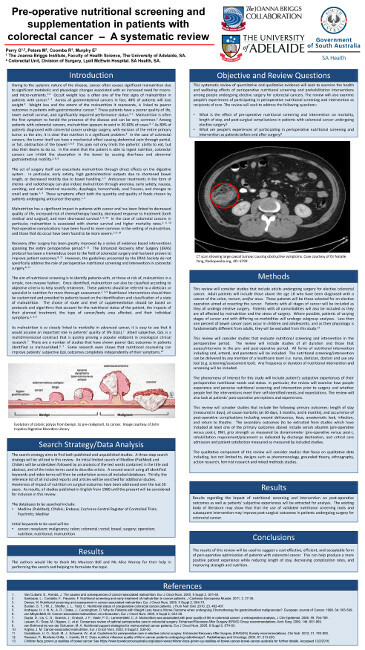 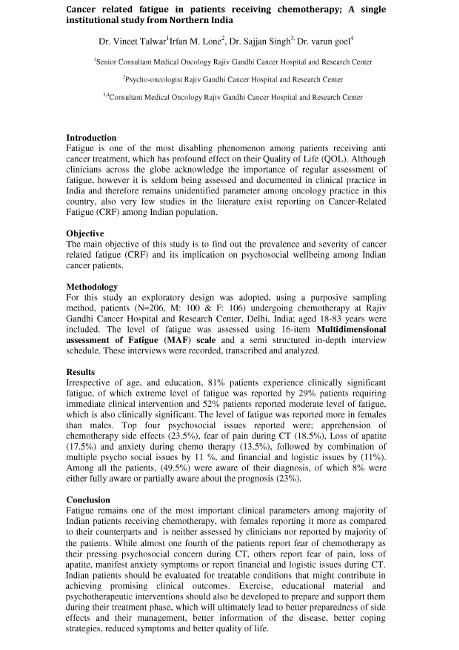 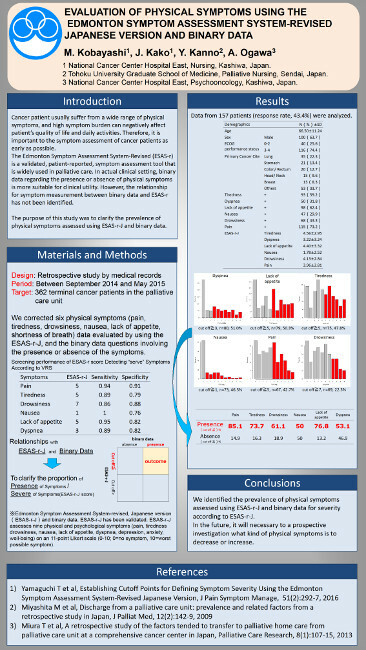 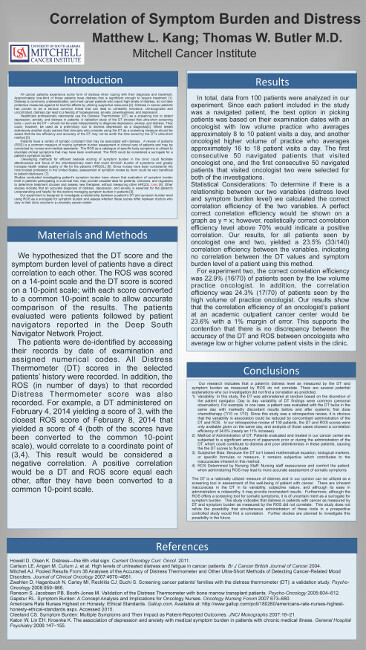 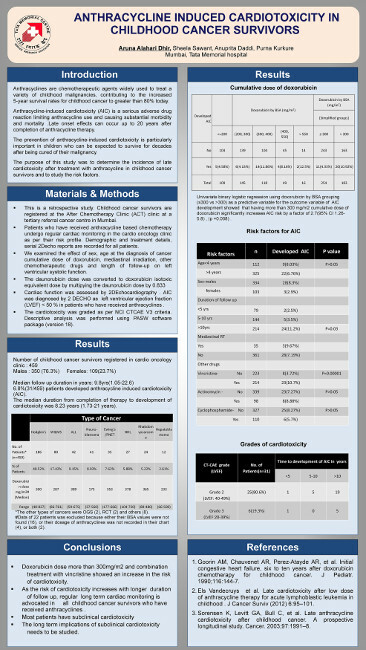 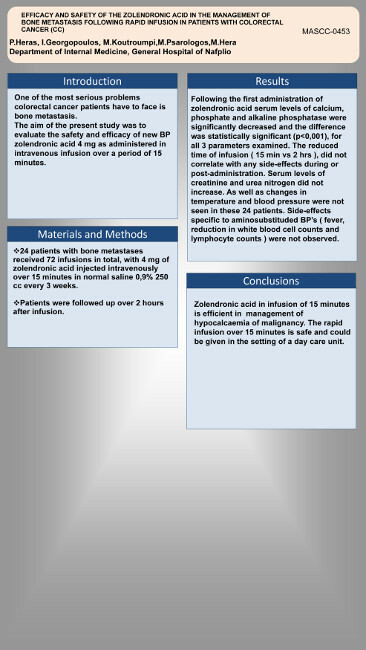 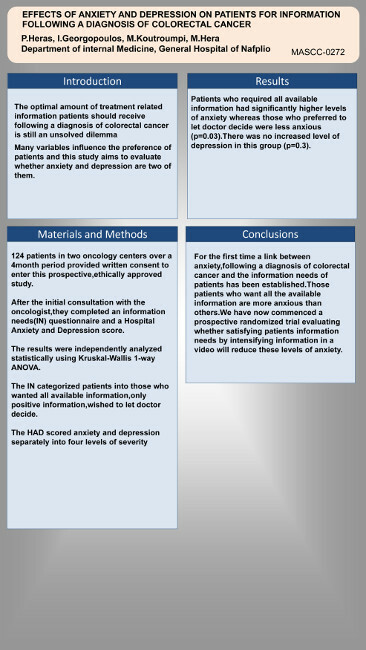 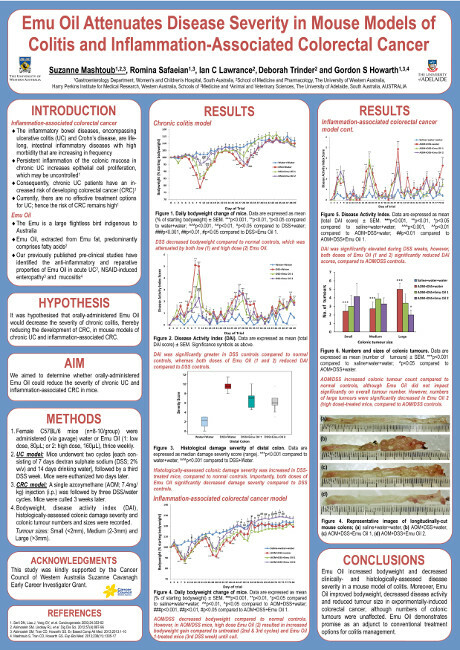 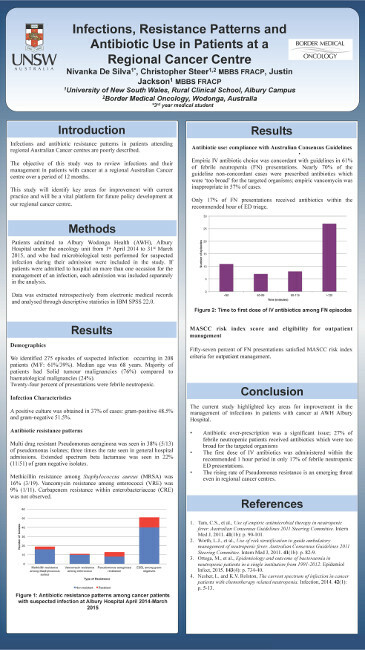 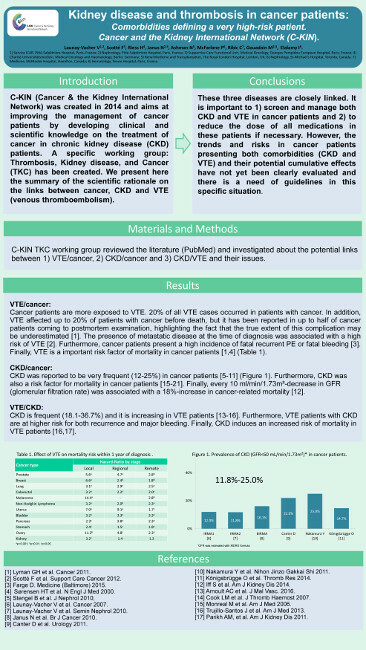 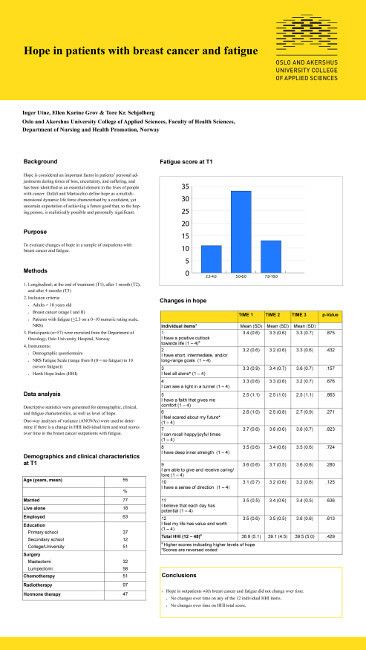 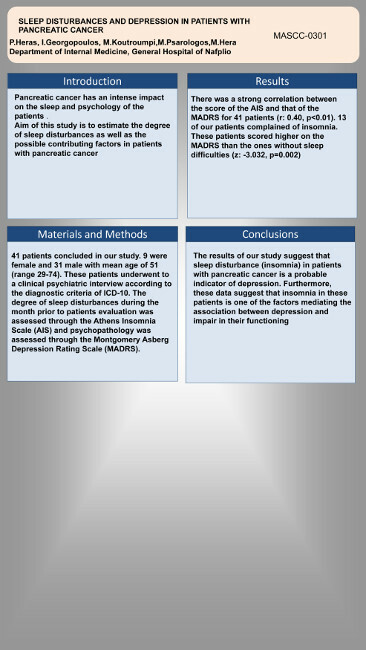 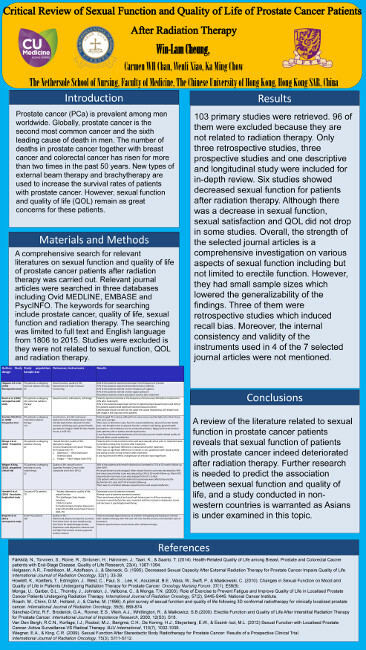 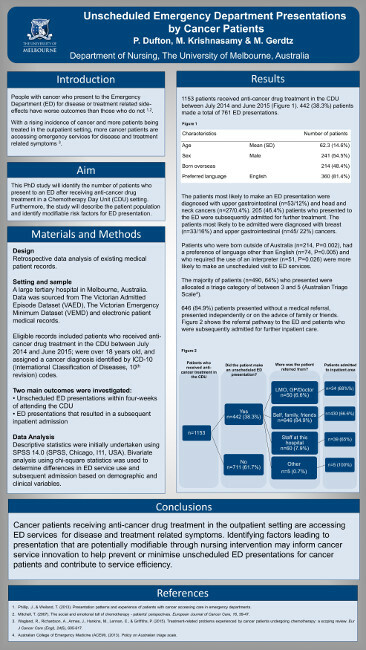 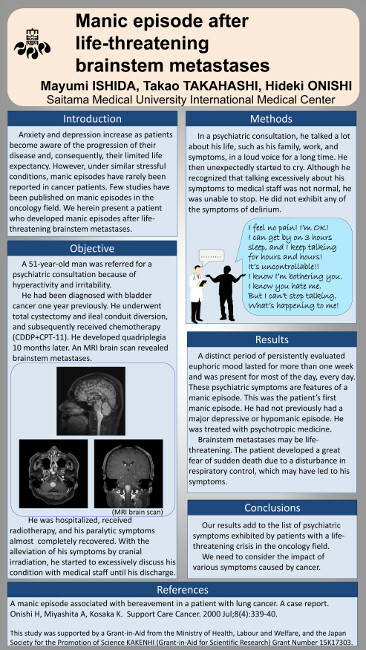 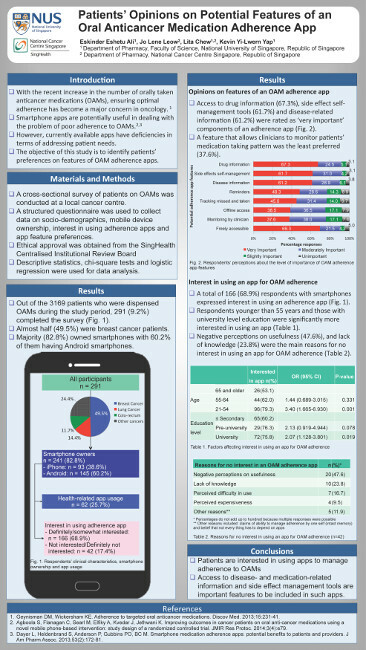 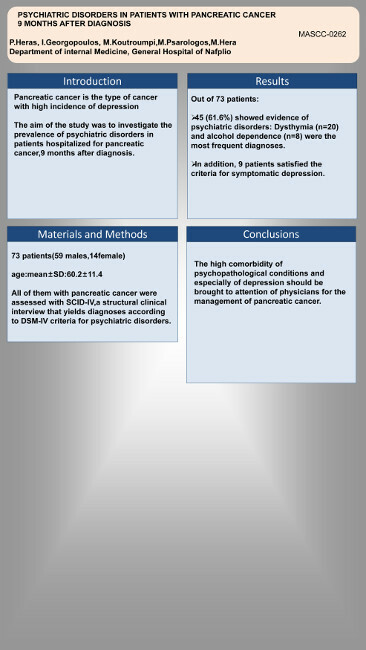 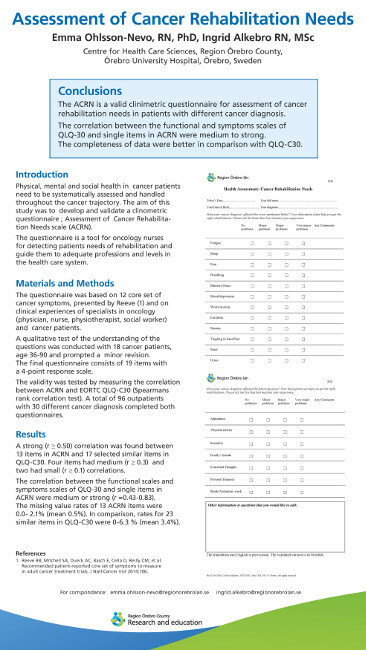 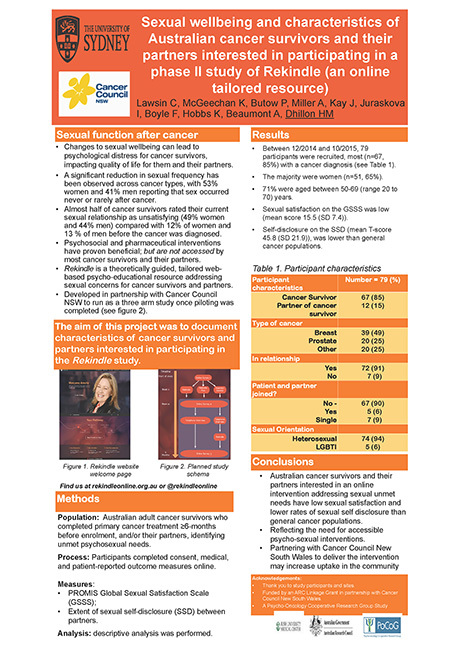 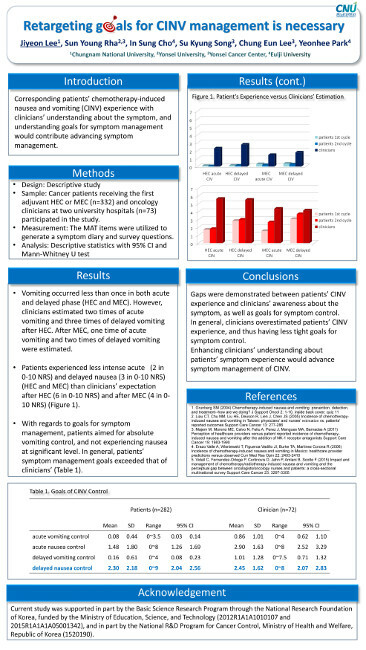 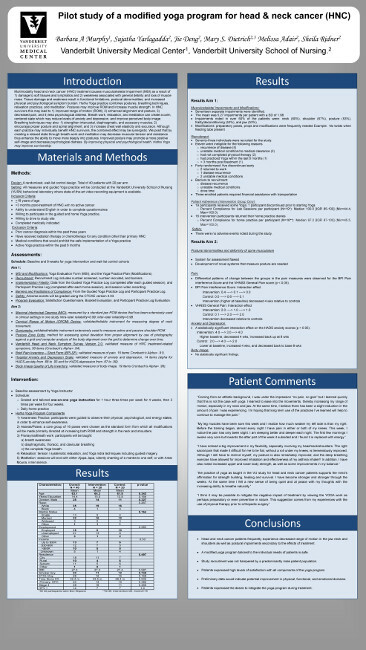 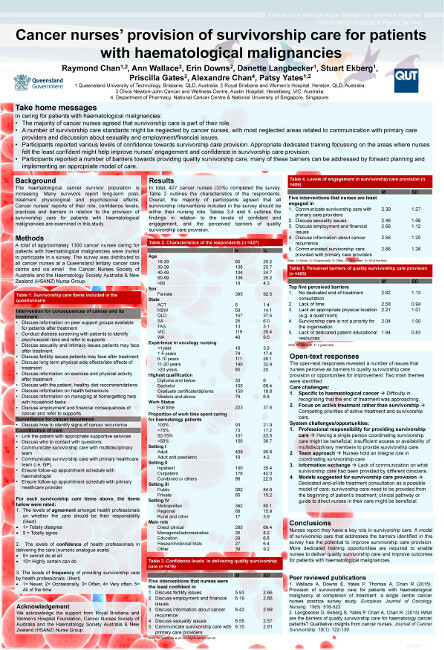 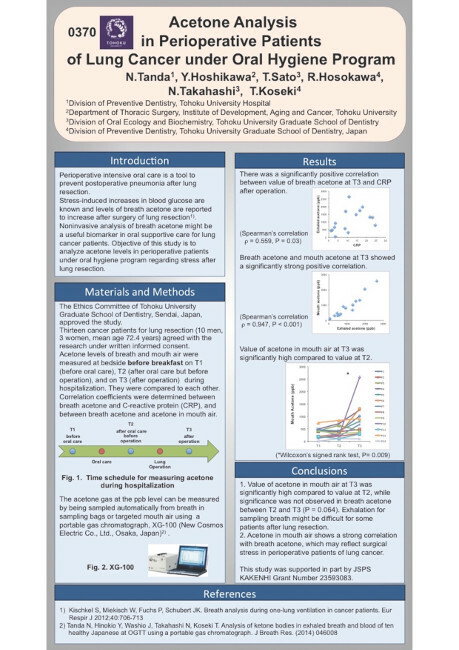 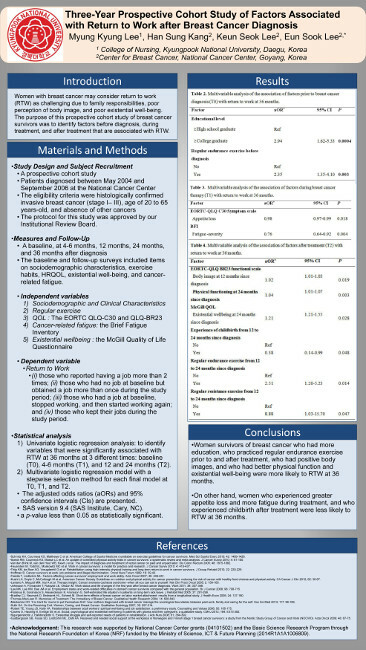 Distress Thermometer/Tool in Patients with Testicular Cancer: Is It Valuable? 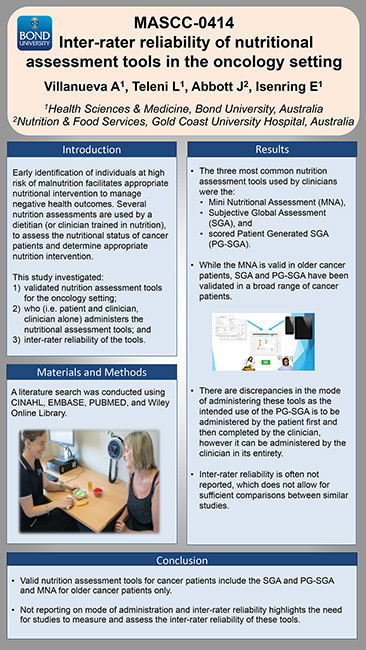 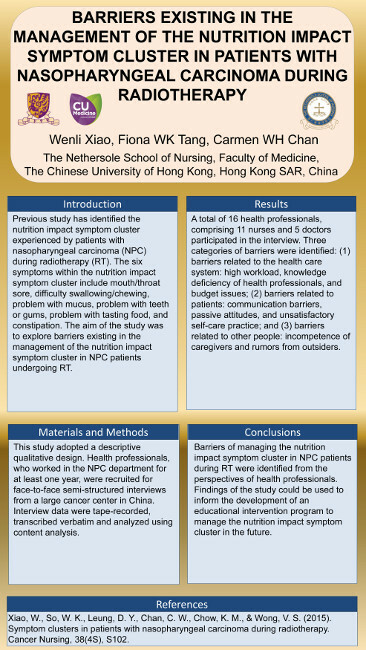 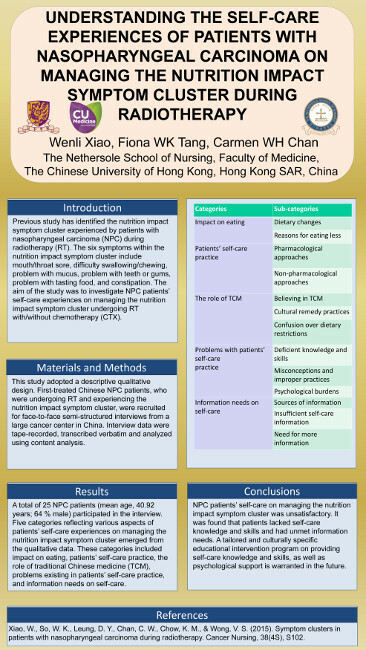 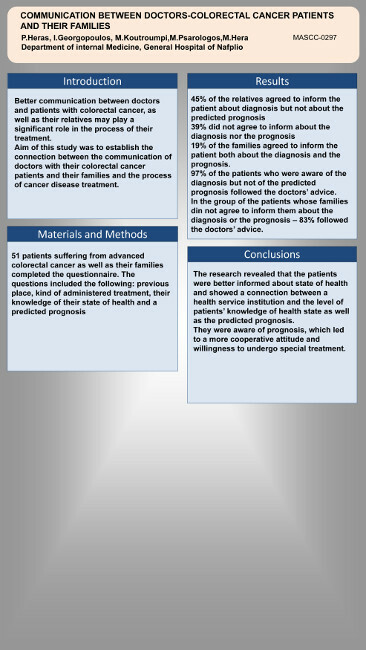 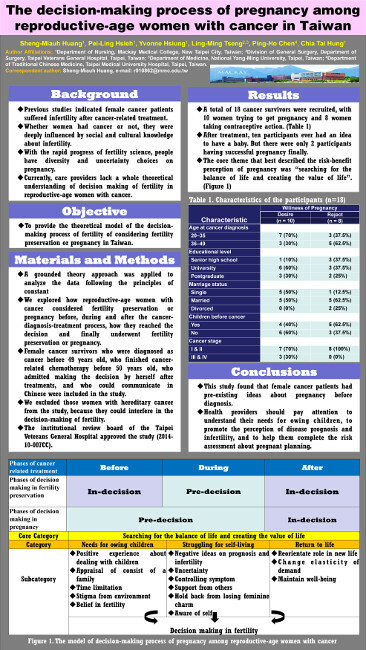 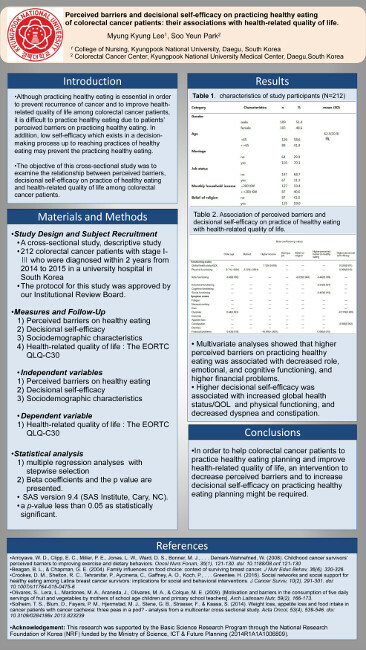 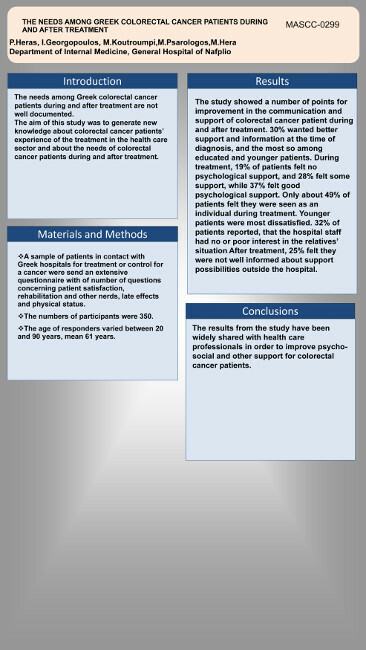 Perceived barriers and decisional self-efficacy on practicing healthy eating of colorectal cancer patients: their associations with health-related quality of life. 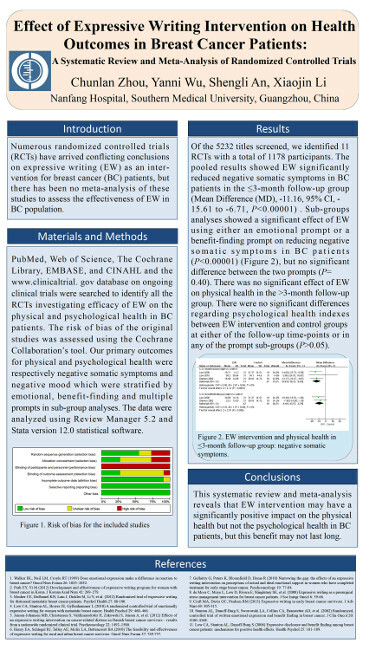 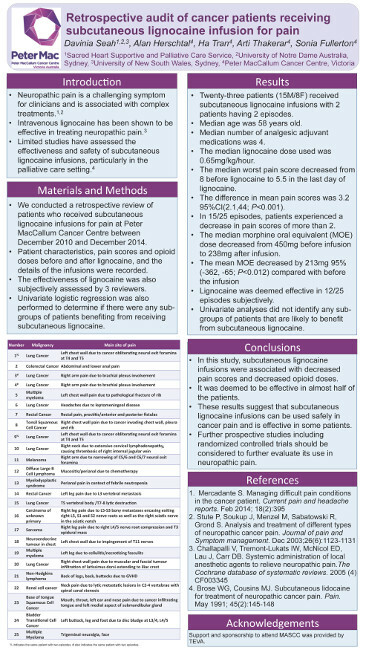 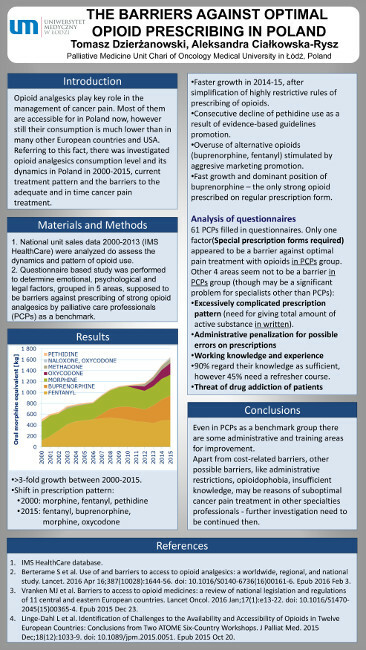 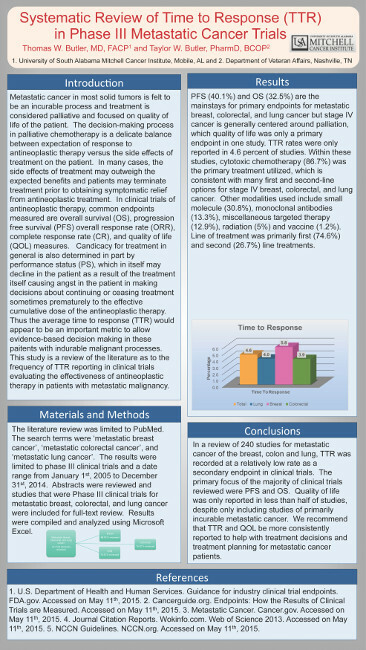 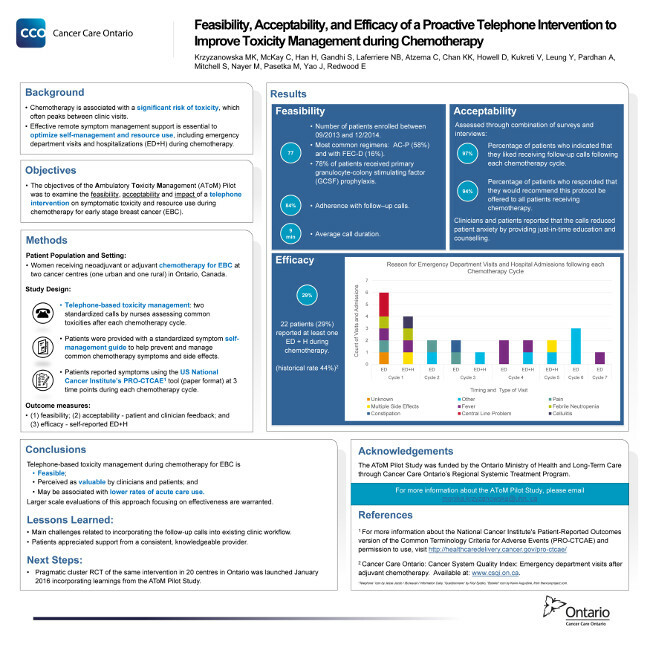 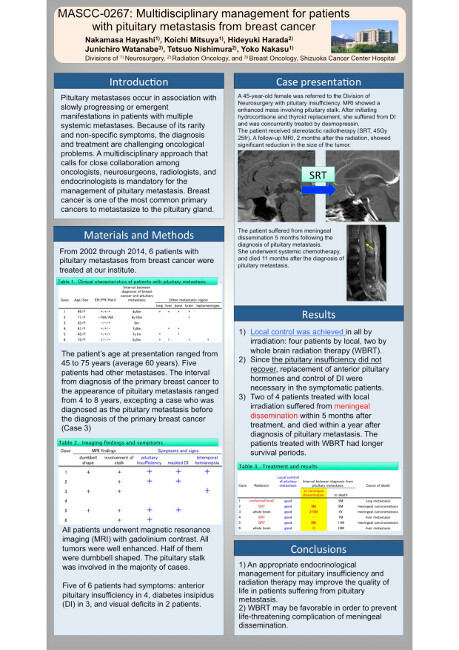 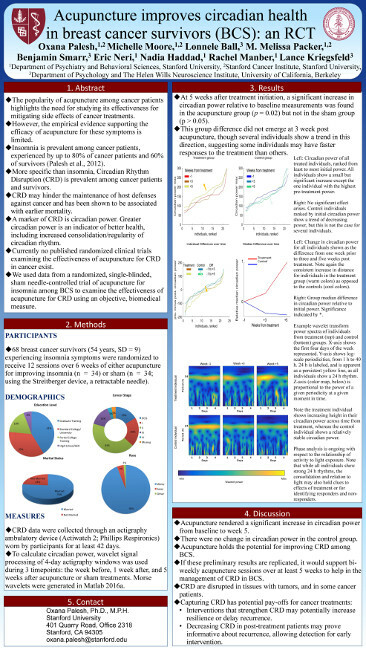 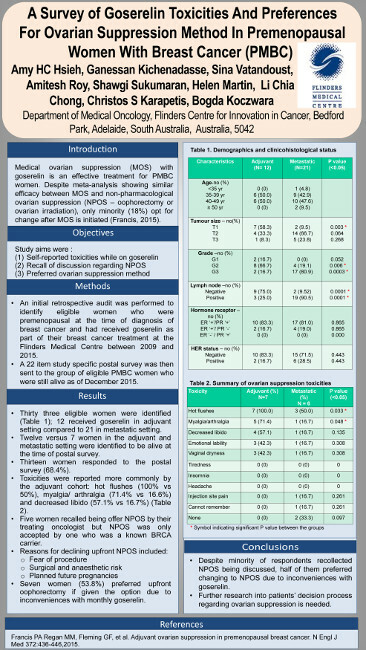 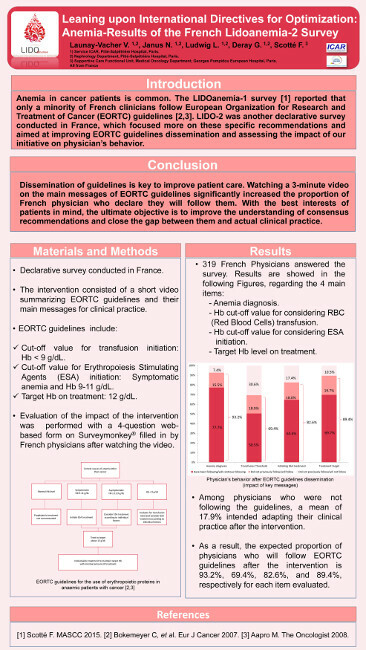 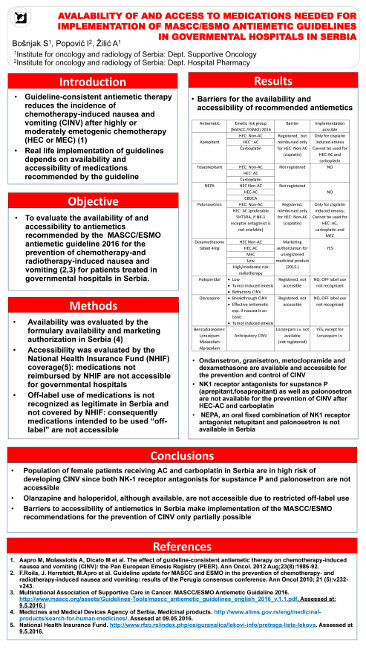 Collaborative pharmacotherapy involving physicians and pharmacists aimed at improving adherence in everolimus therapy for advanced/recurrent breast cancer and its outcomes. 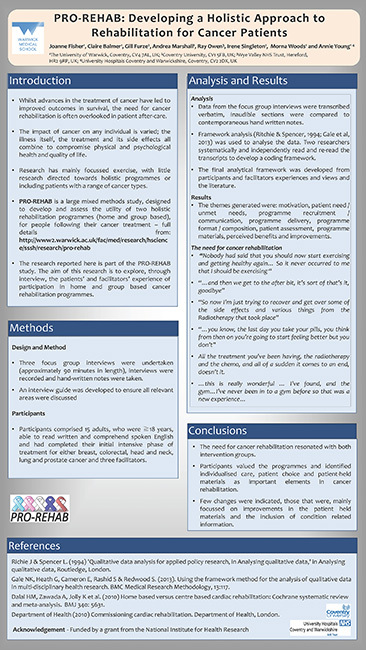 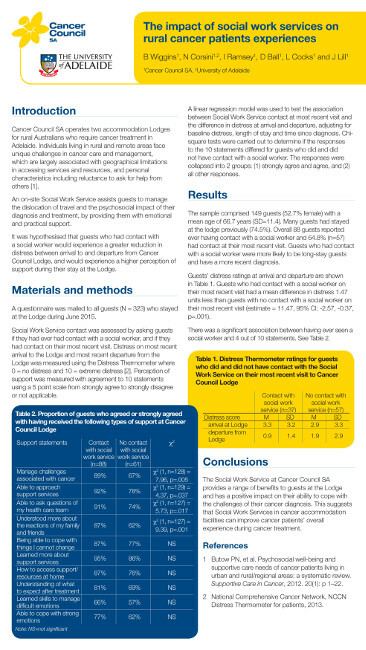 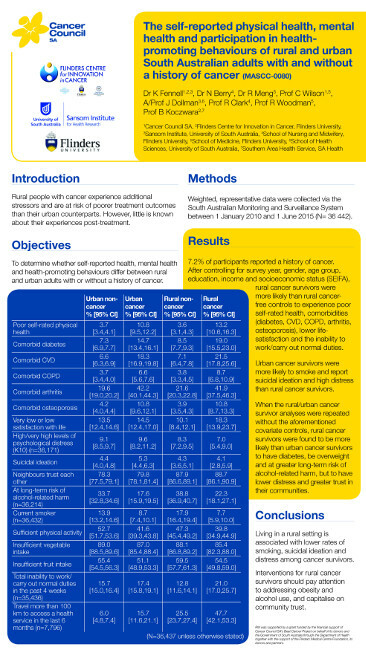 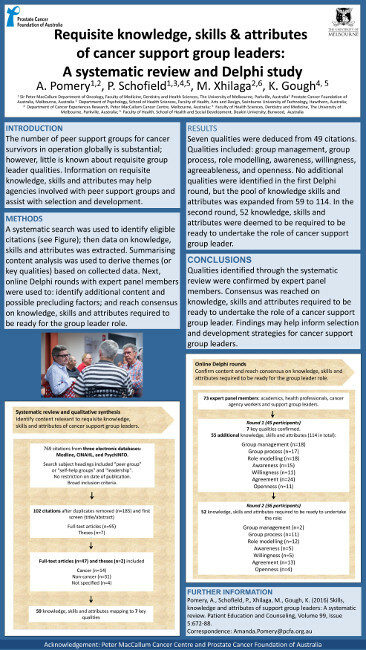 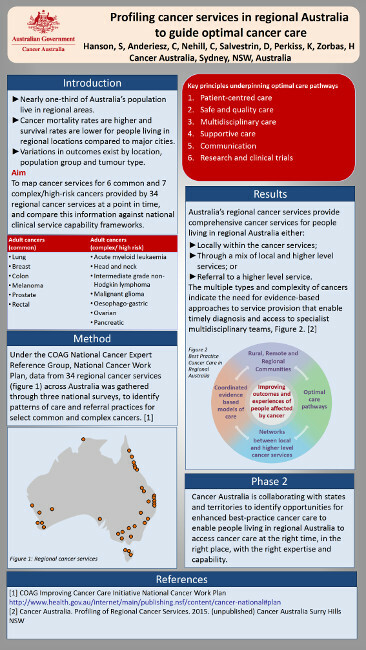 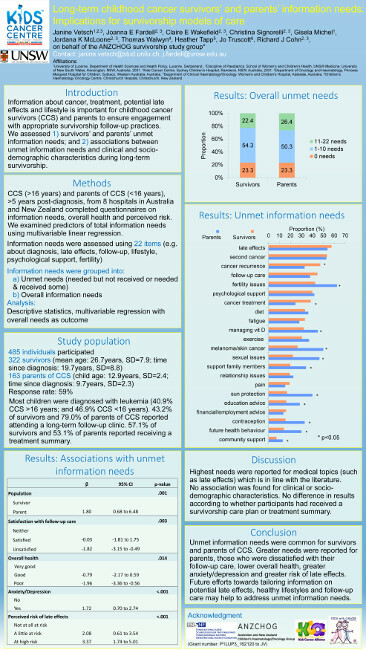 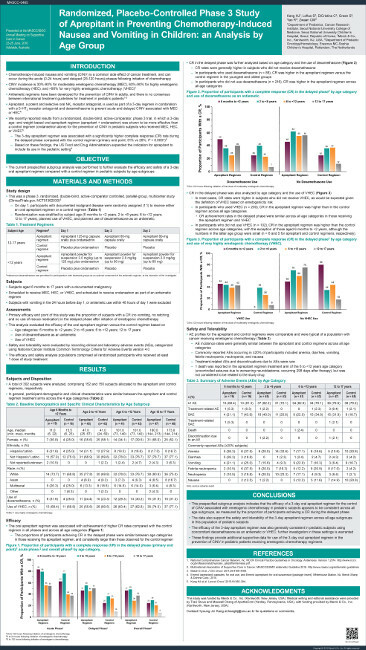 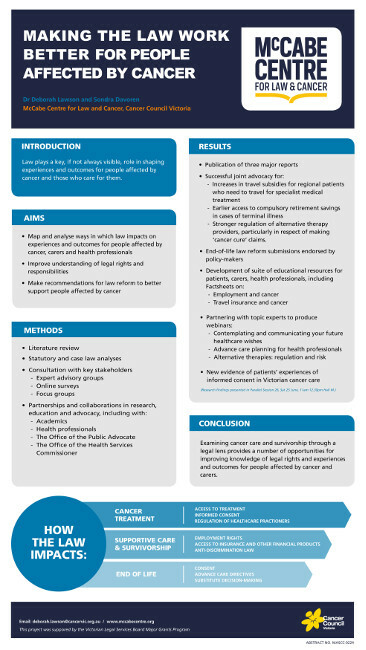 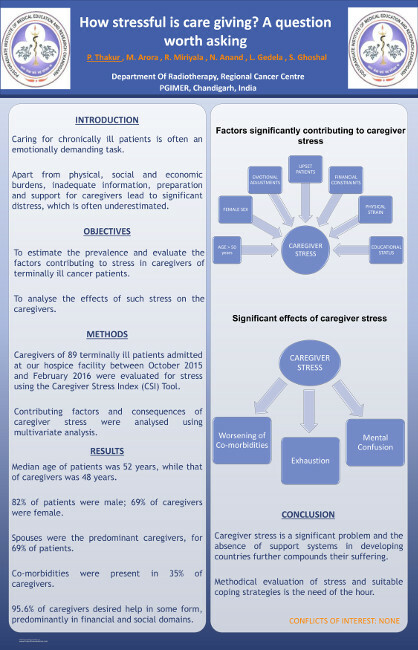 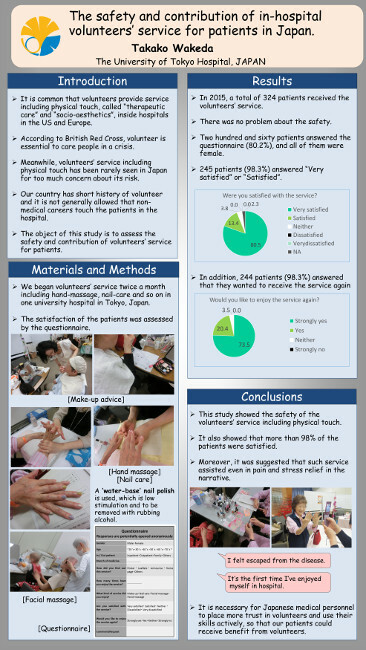 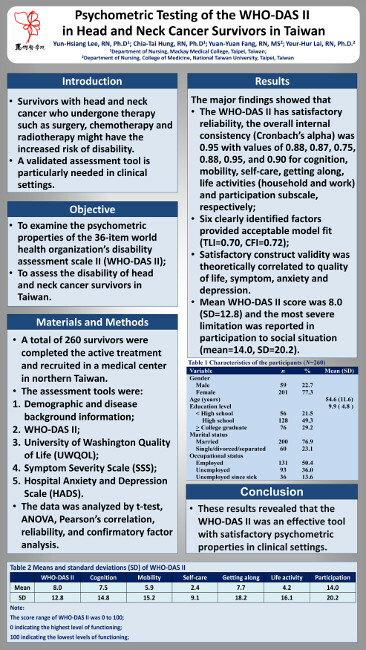 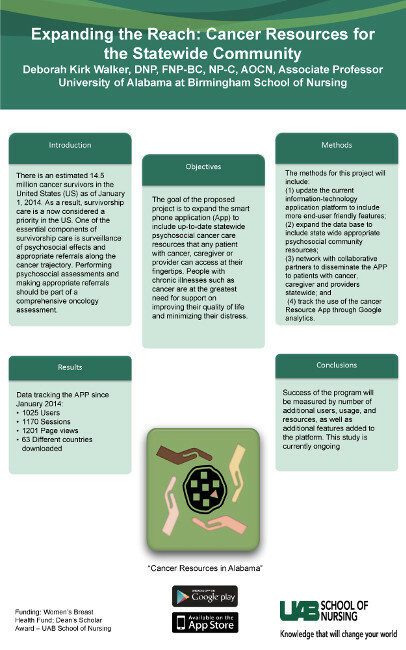 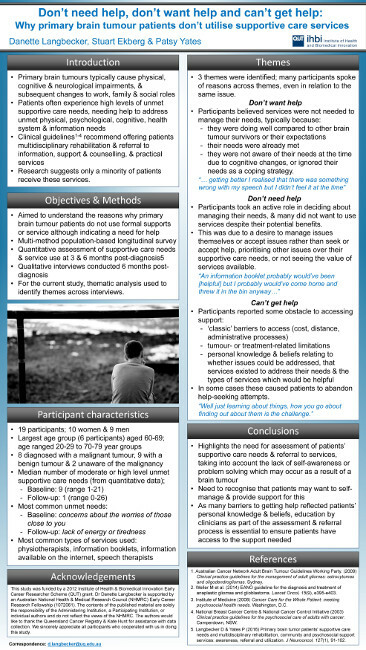 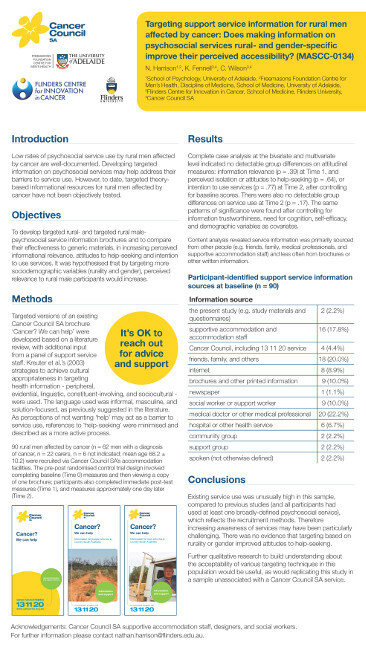 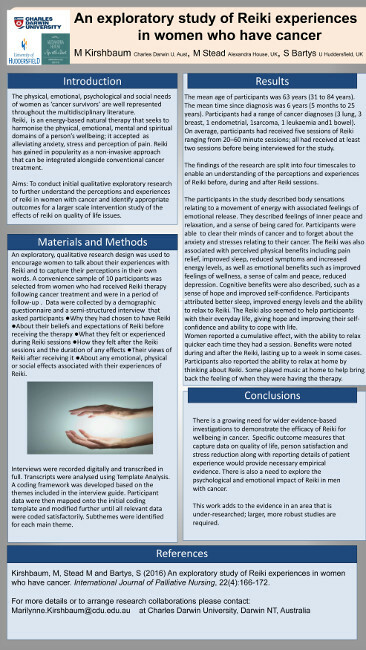 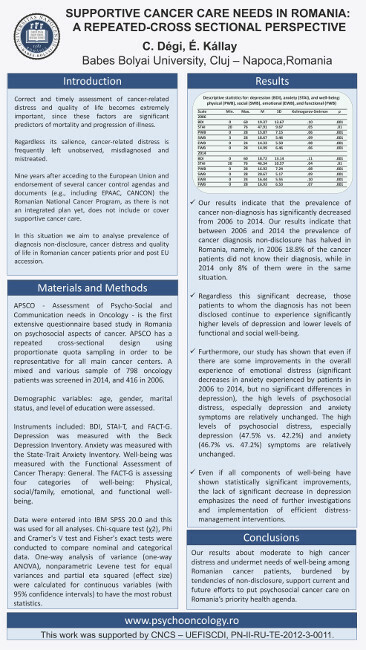 TARGETING SUPPORT SERVICE INFORMATION FOR RURAL MEN AFFECTED BY CANCER: DOES MAKING INFORMATION ON PSYCHOSOCIAL SERVICES RURAL- AND GENDER-SPECIFIC IMPROVE THEIR PERCEIVED ACCESSIBILITY? 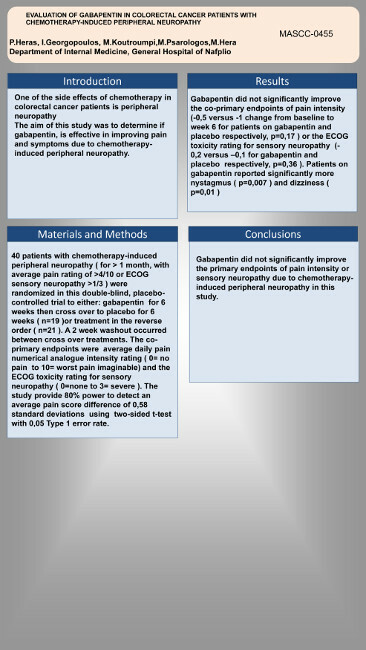 Which pain intensity scale from the Brief Pain Inventory correlates most highly with functional interference scores in patients experiencing taxane-induced arthralgia and myalgia? 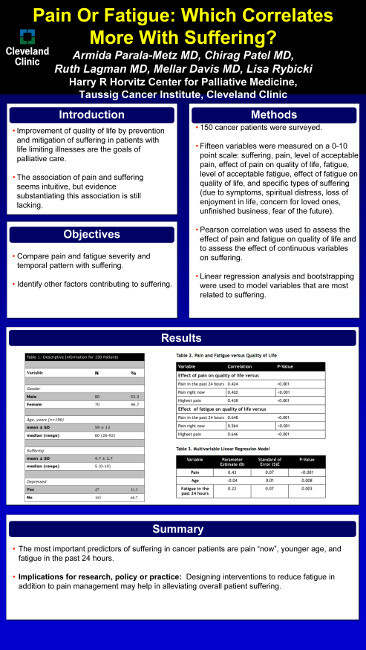 Pain or Fatigue: Which correlates more with suffering? 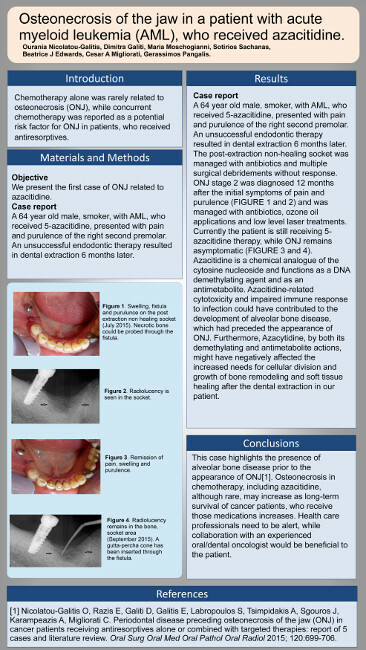 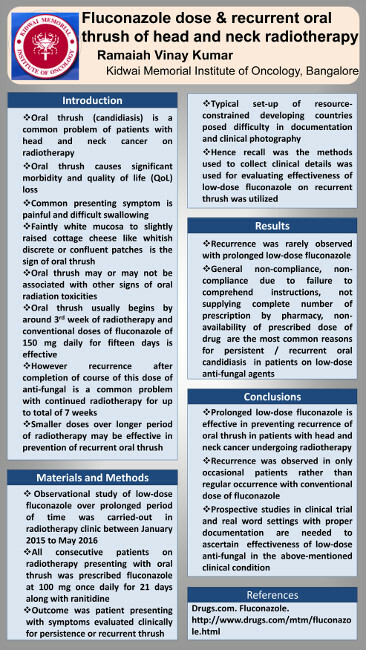 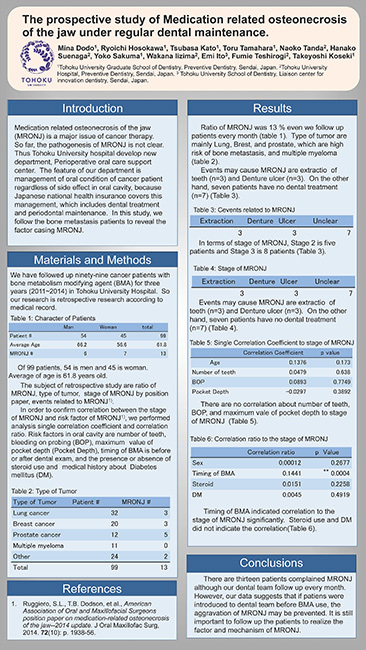 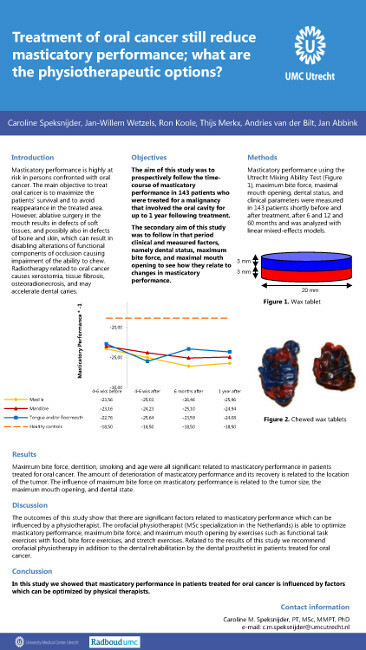 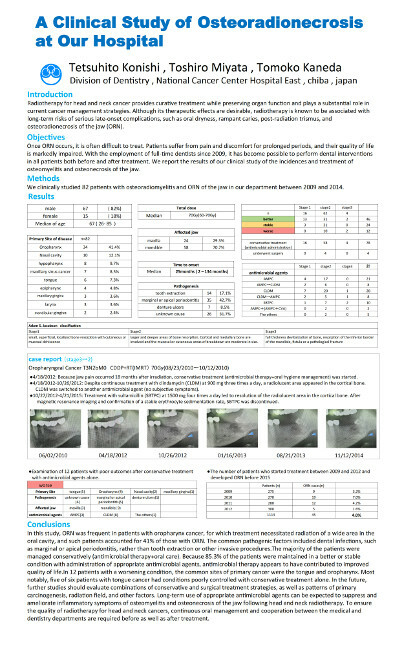 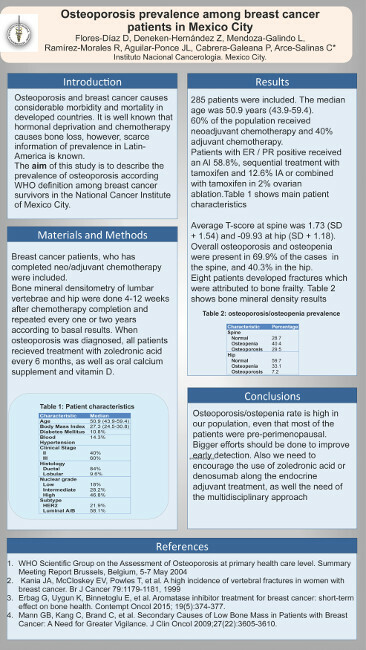 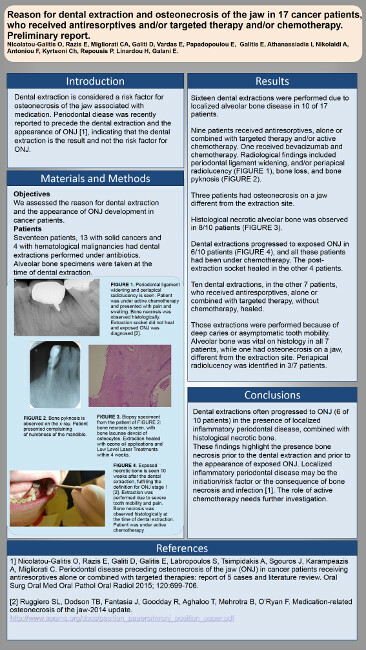 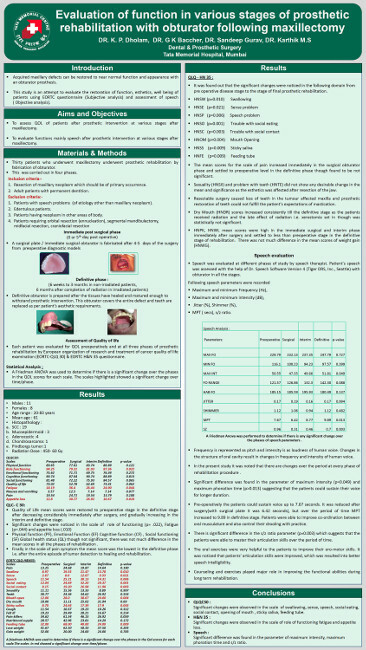 The prospective study of Medication related osteonecrosis of the jaw under regular dental maintenance. 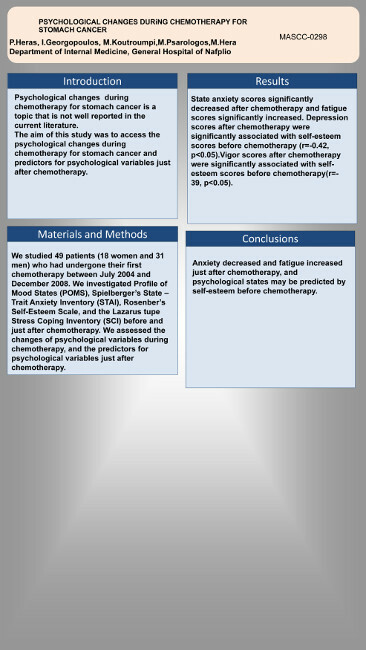 Standing on the receiving end: how much we could change the patientsâ€™ perception of chemotherapy symptoms standing at 2016? 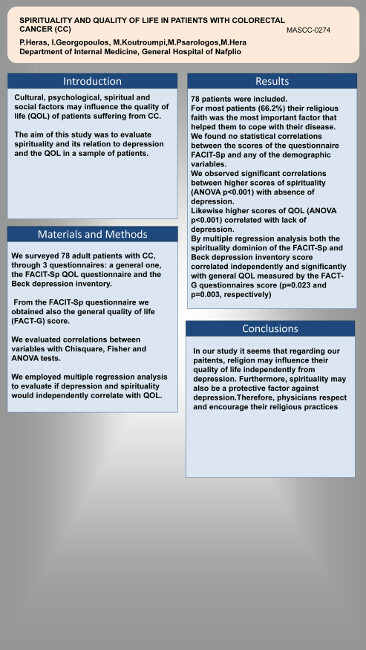 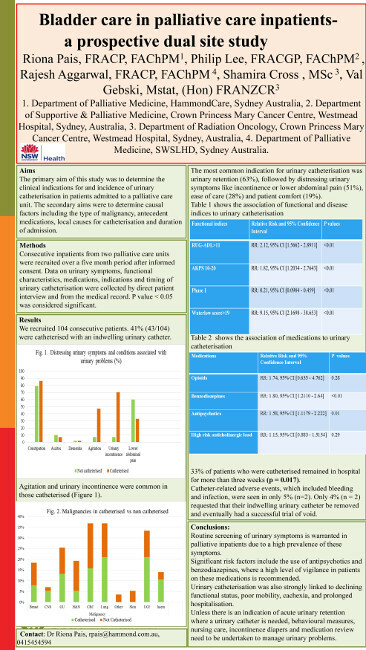 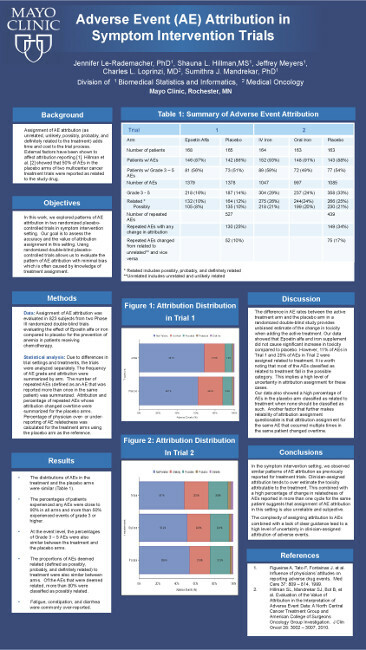 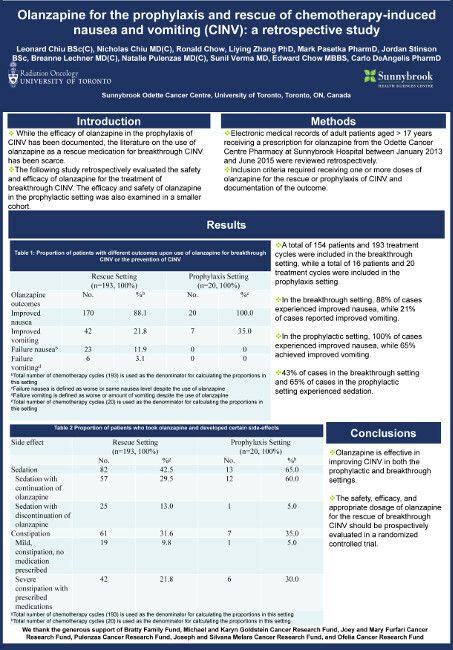 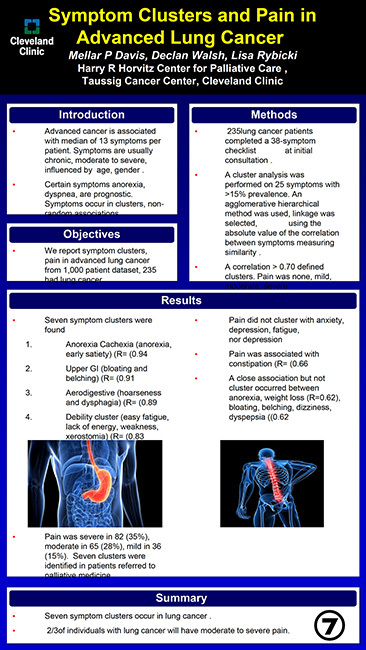 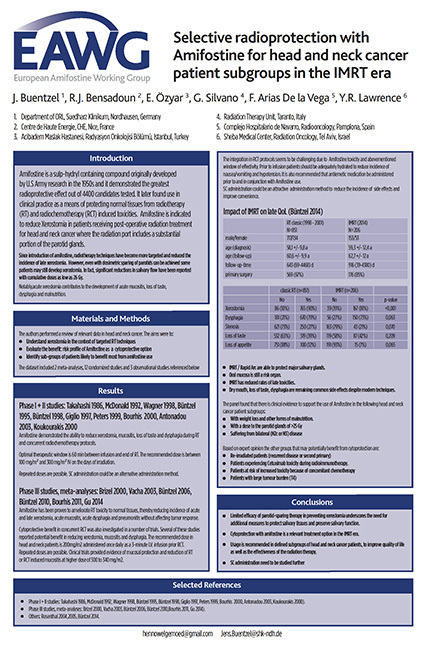 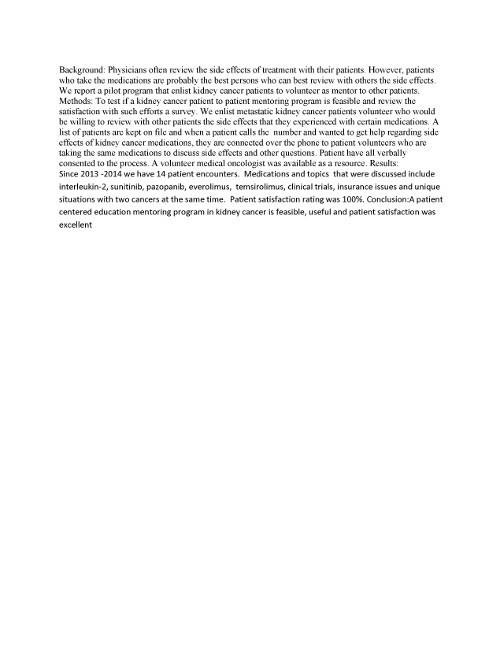 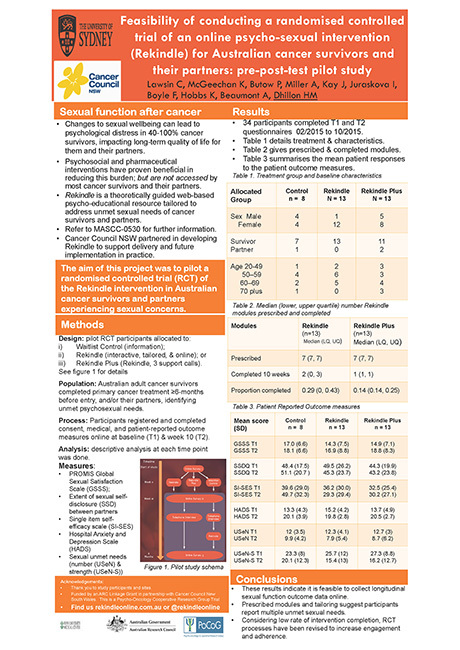 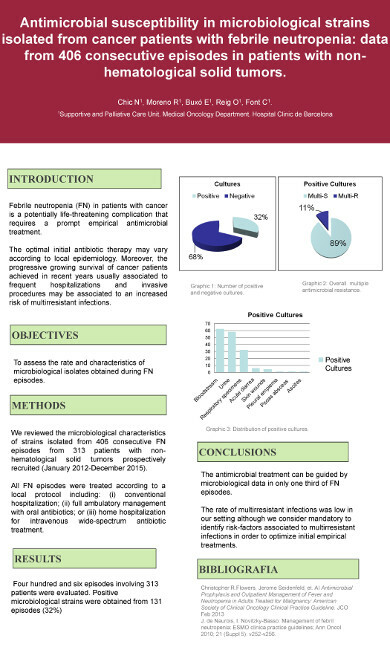 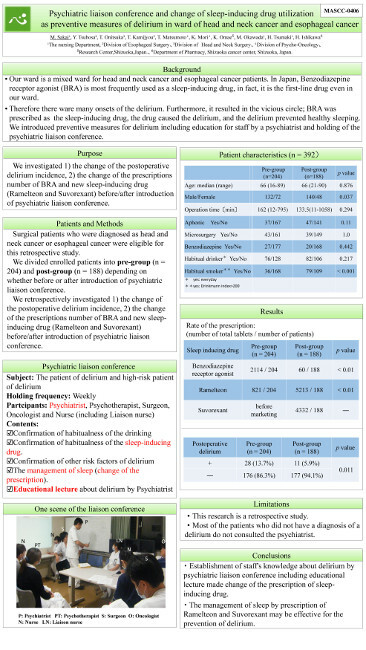 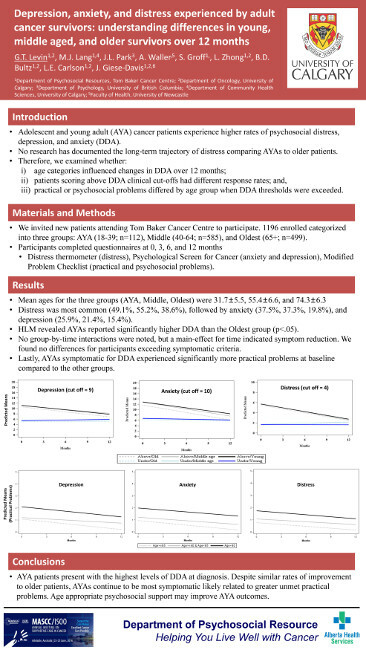 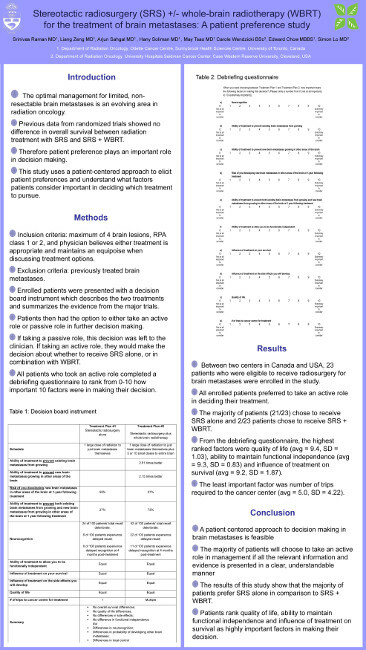 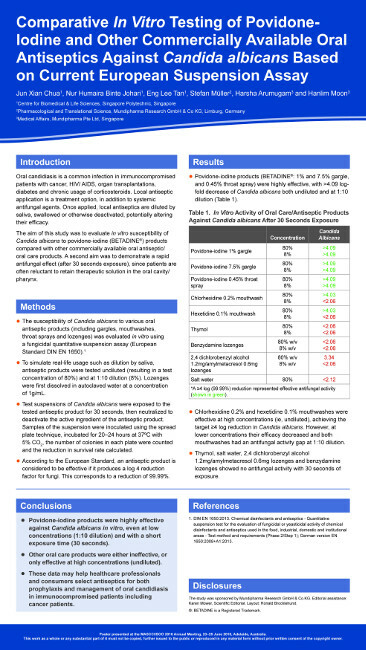 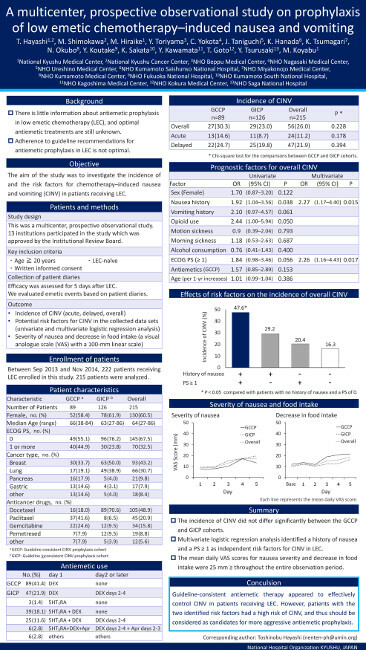 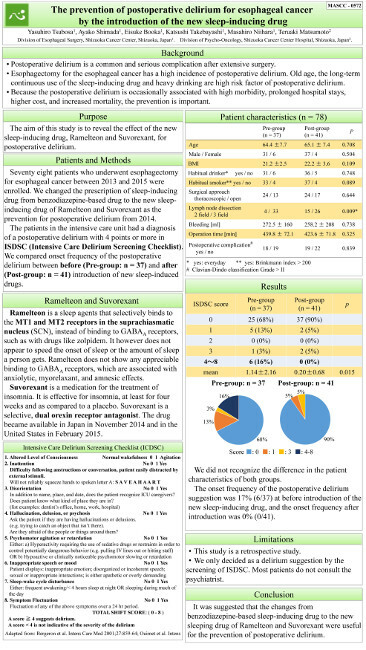 Comparison of efficacy, safety and sedation with two doses of add on olanzapine in chemotherapy induced nausea and vomiting: a randomized controlled pilot study. 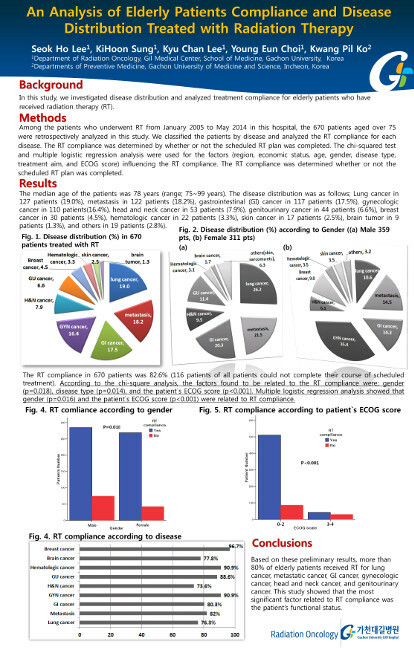 SEIZURES IN PATIENTS WITH PRIMARY BRAIN TUMORS: WHAT IS THEIR PSYCHOSOCIAL IMPACT? 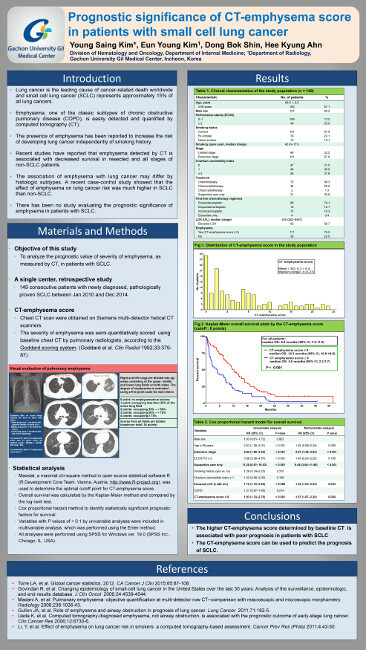 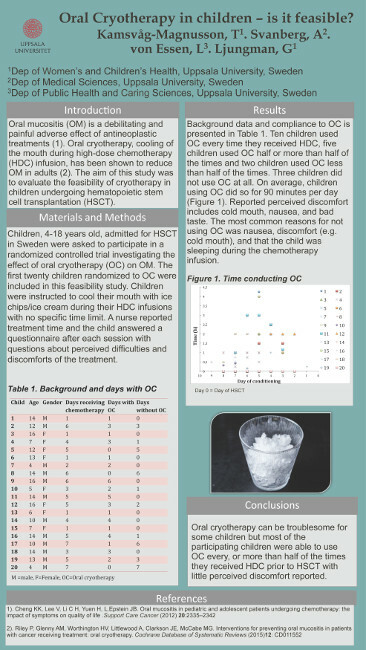 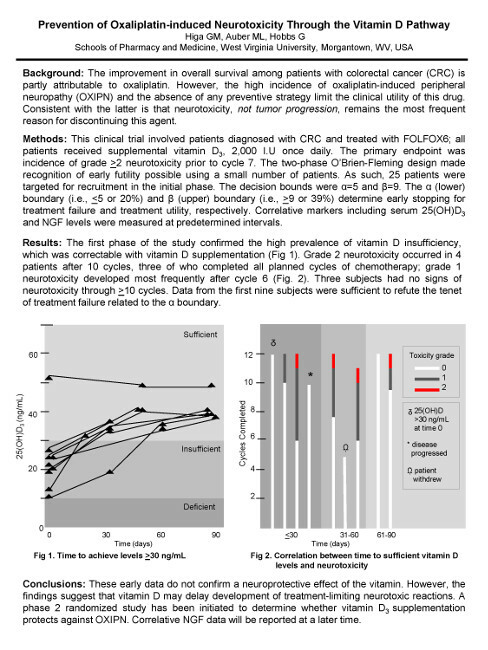 Oral cryotherapy in children receiving high dose chemotherapy to avoid mucositis - is it feasible? 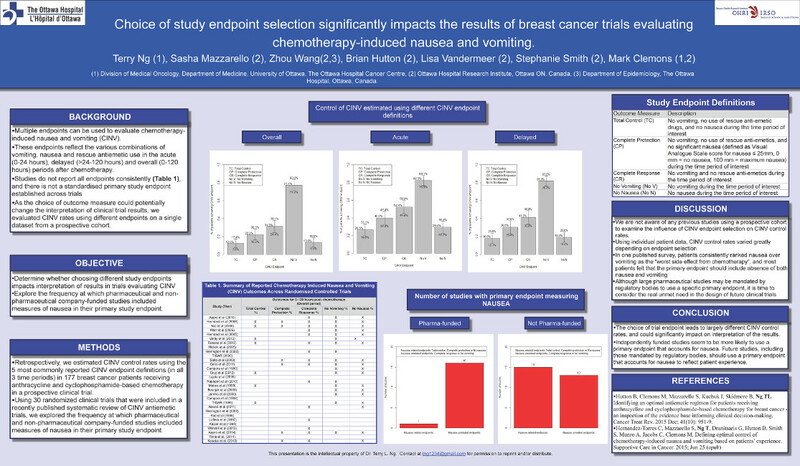 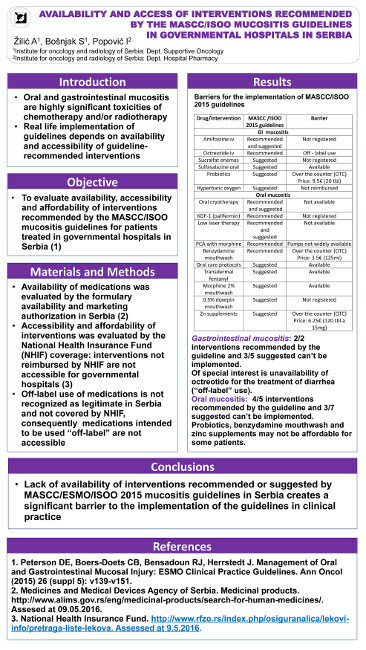 Patterns and severity of chemotherapy-induced nausea (CIN) in patients with various cancers associated with highly to moderately emetogenic chemotherapy (HEC and MEC). 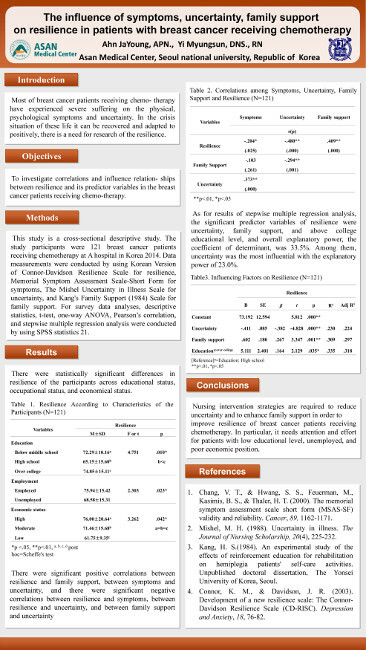 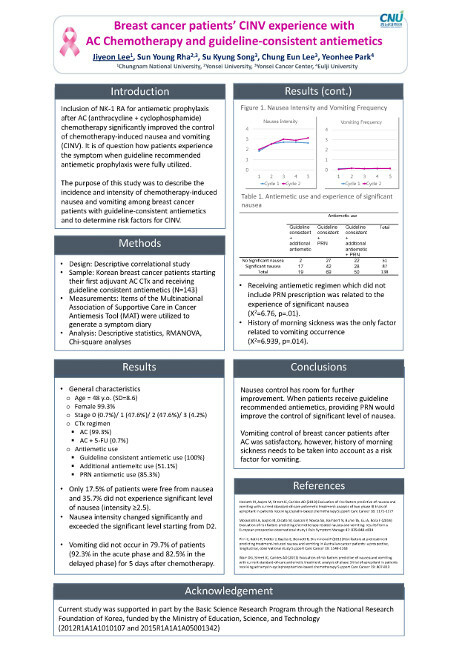 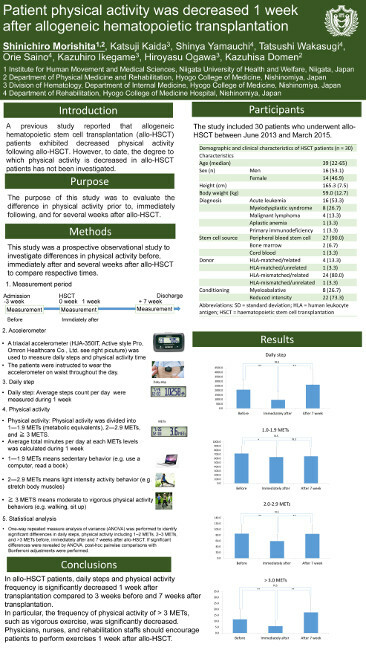 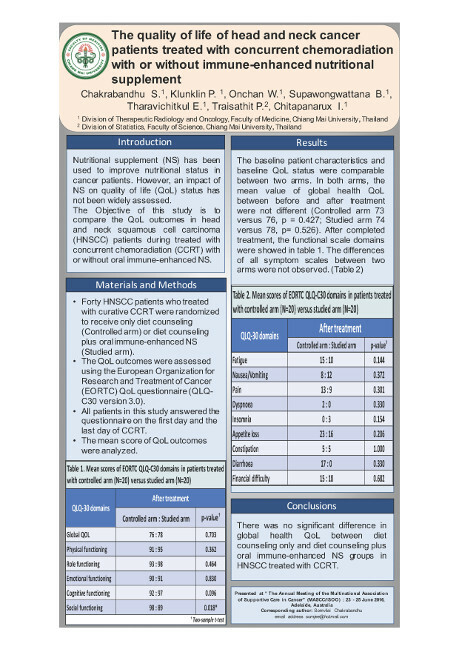 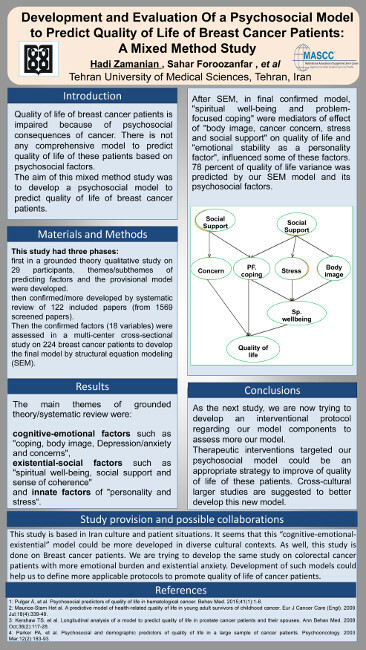 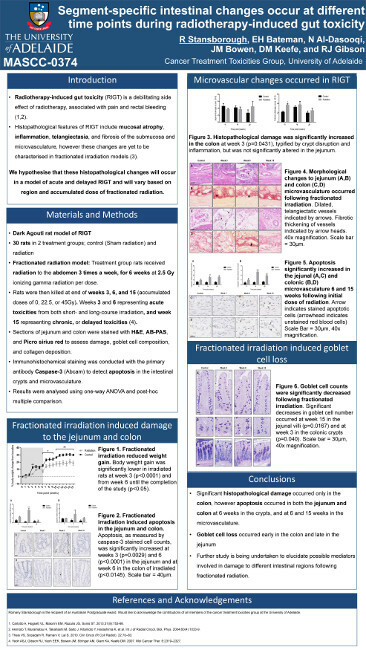 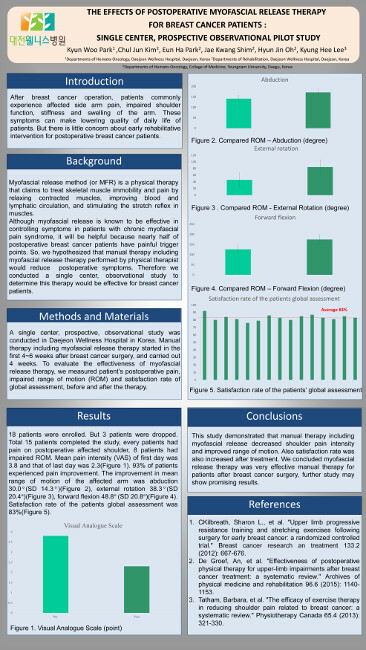 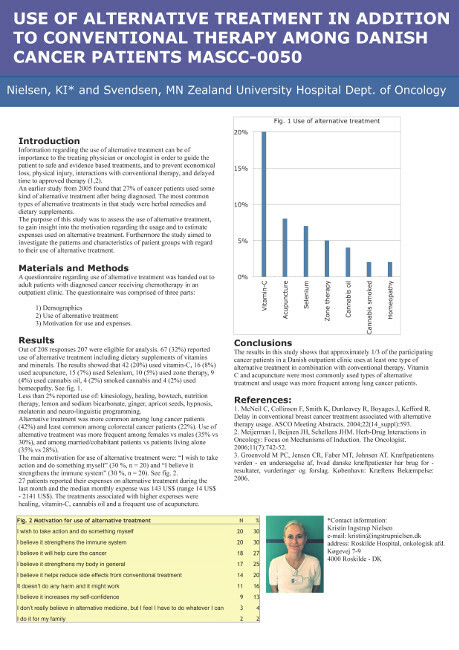 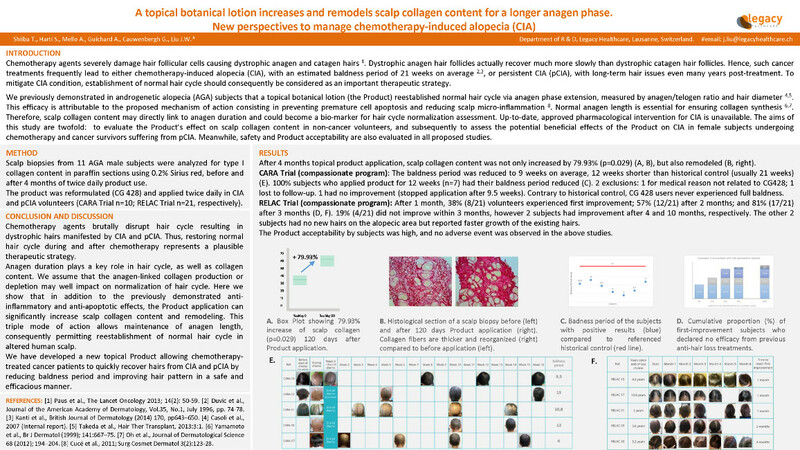 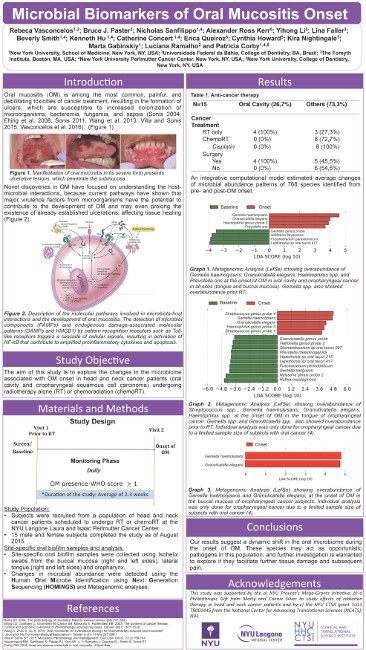 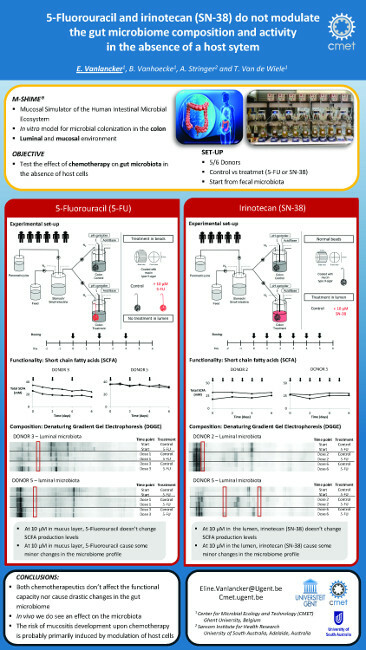 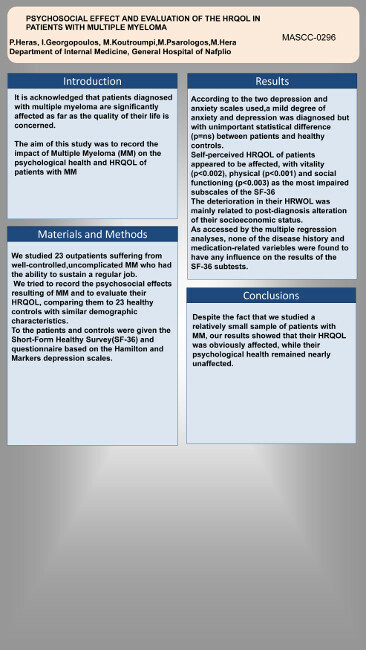 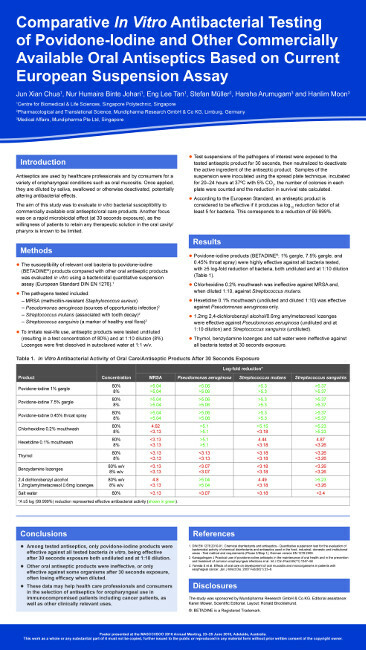 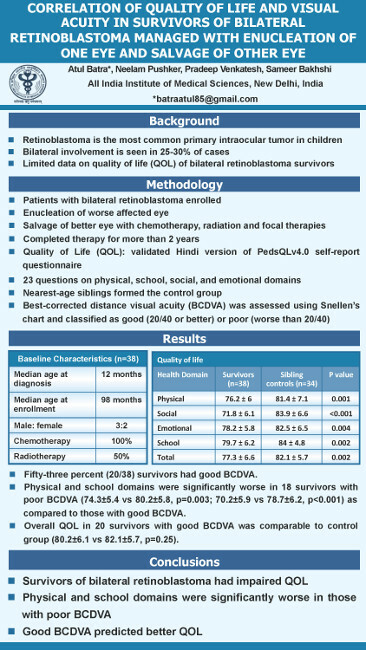 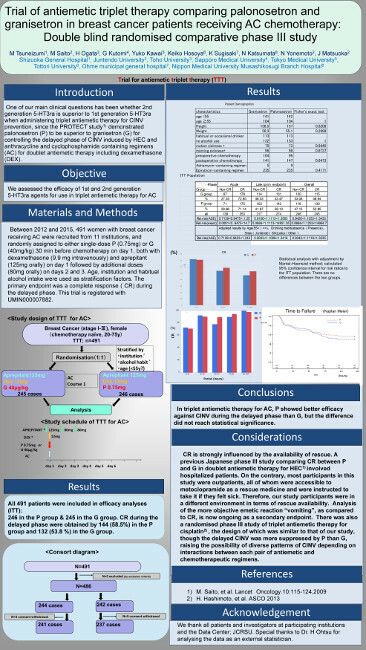 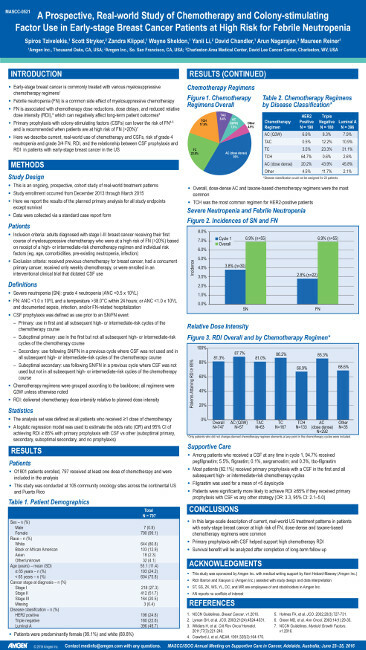 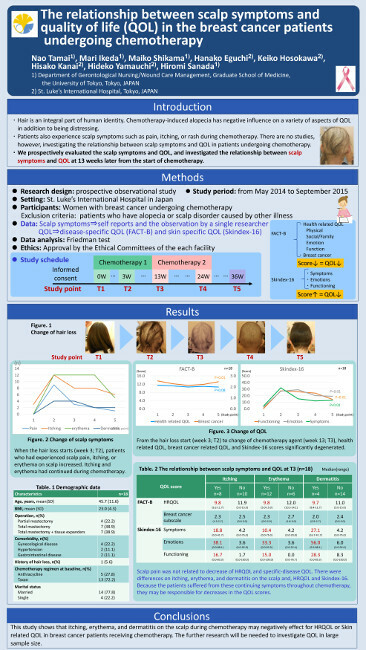 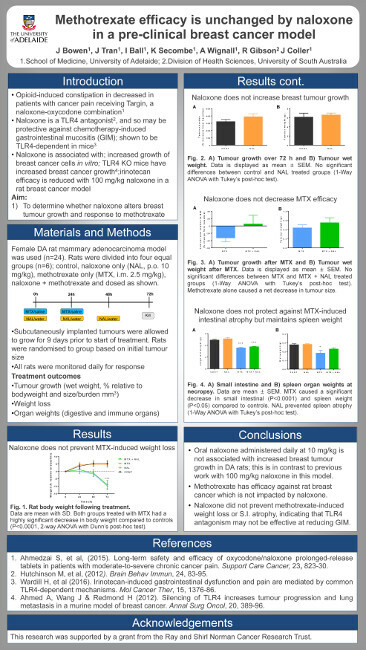 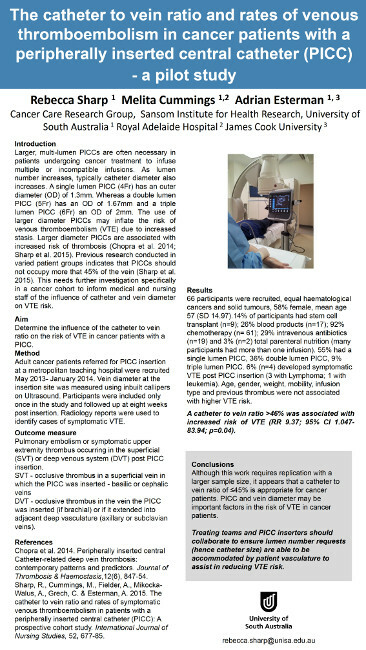 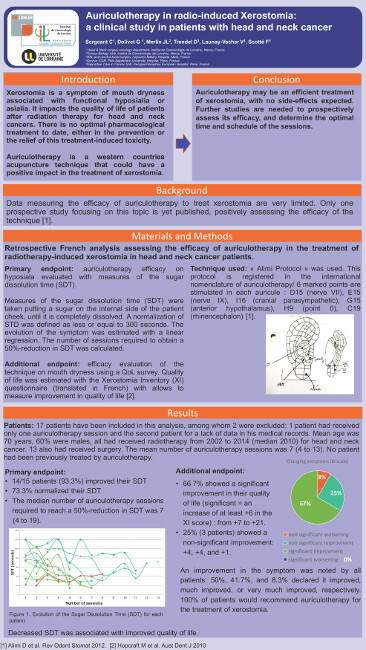 A study into the safety, efficacy and tolerability of scalp cooling in patients receiving chemotherapy, through the reduction of chemotherapy induced alopecia. 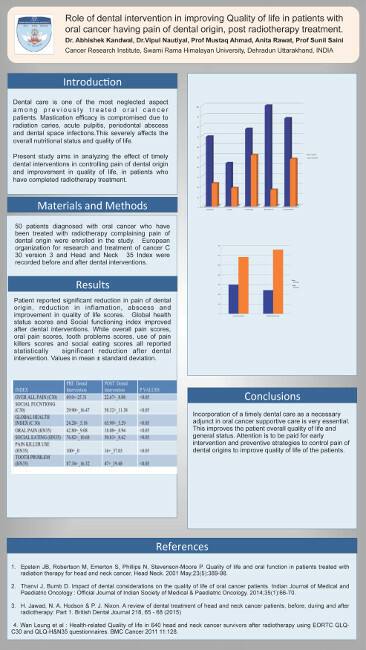 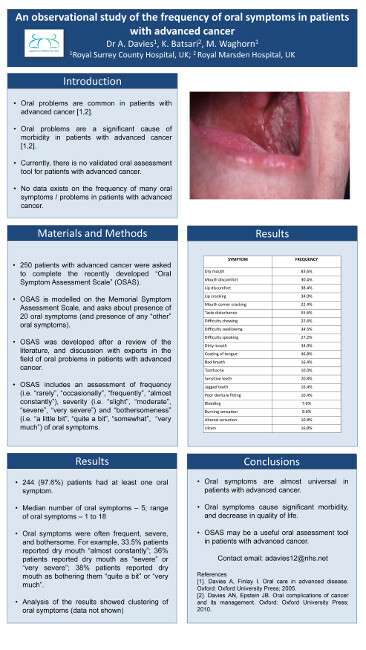 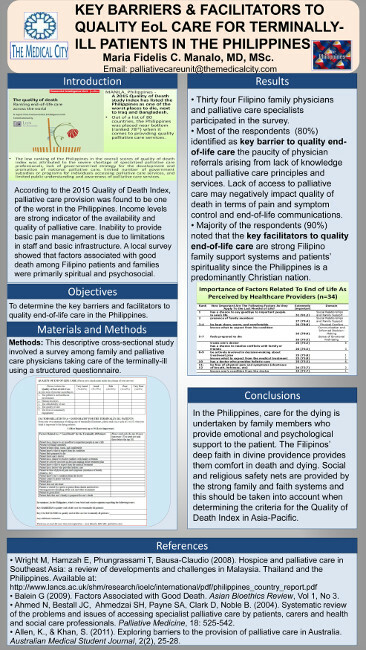 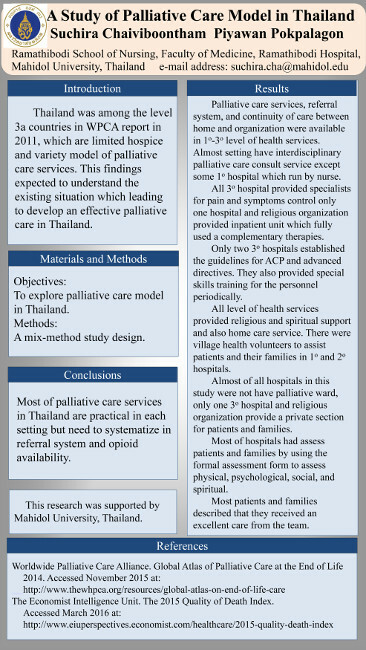 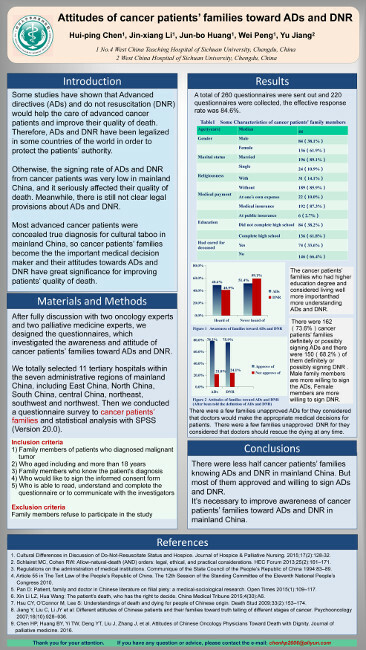 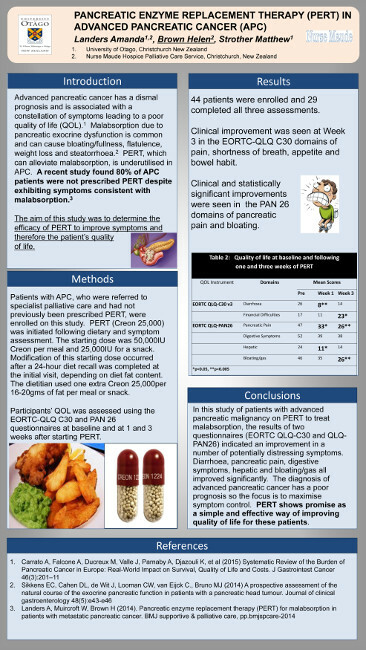 Role of dental intervention in improving Quality of life in patients with oral cancer having pain of dental origin, post radiotherapy treatment.